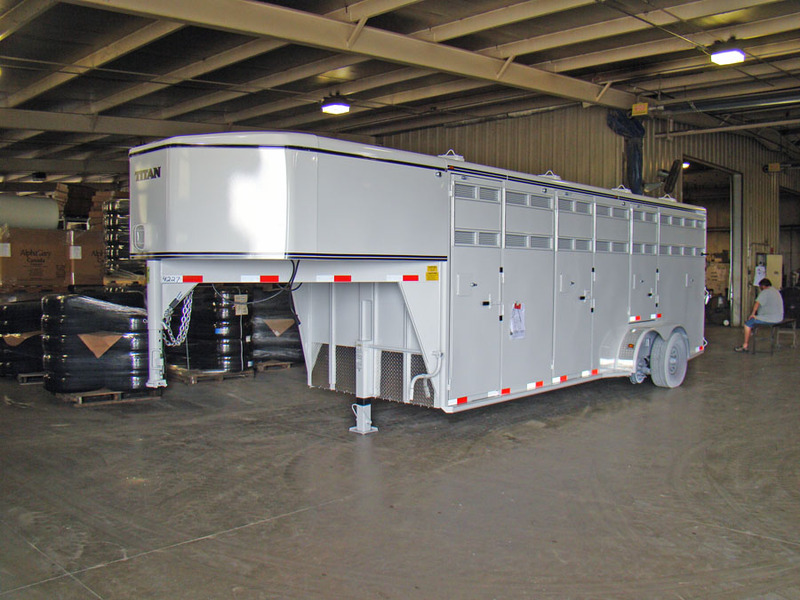 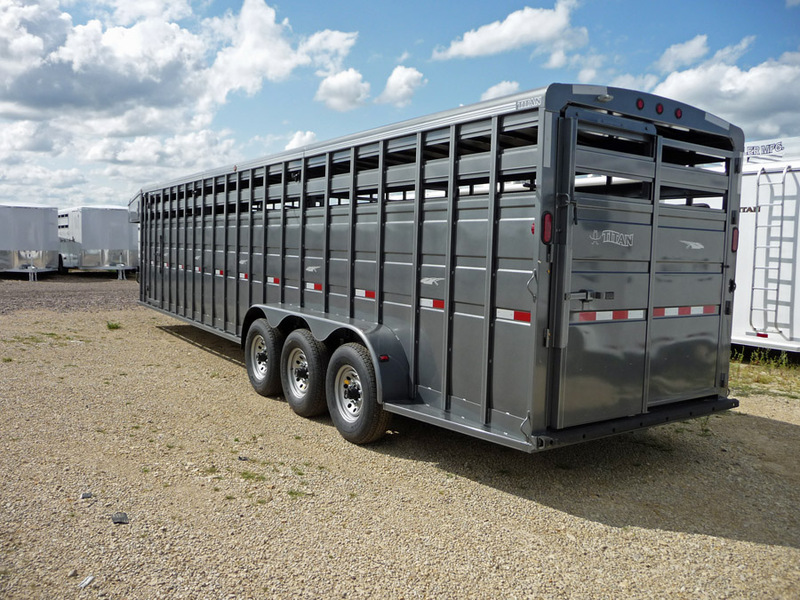 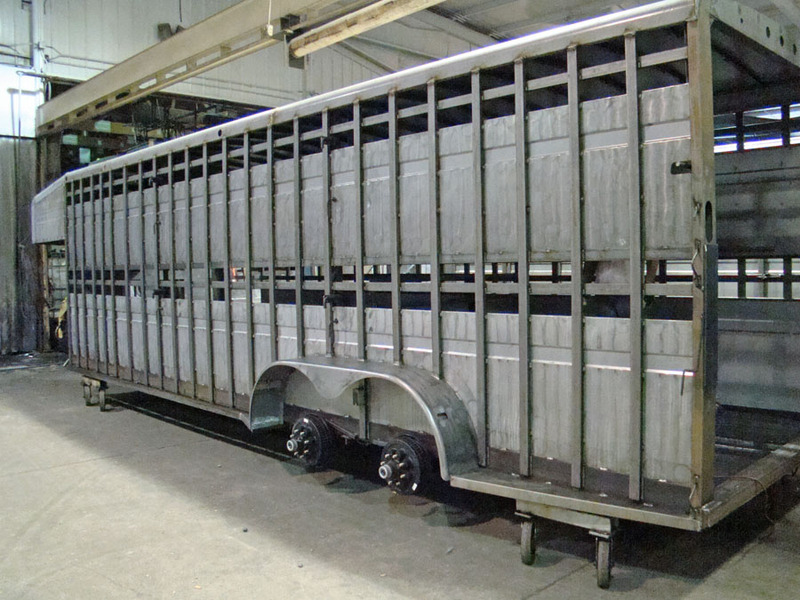 Titan Trailers from Kansas, are well know for livestock trailers, flatbeds and inexpensive steel horse trailers. 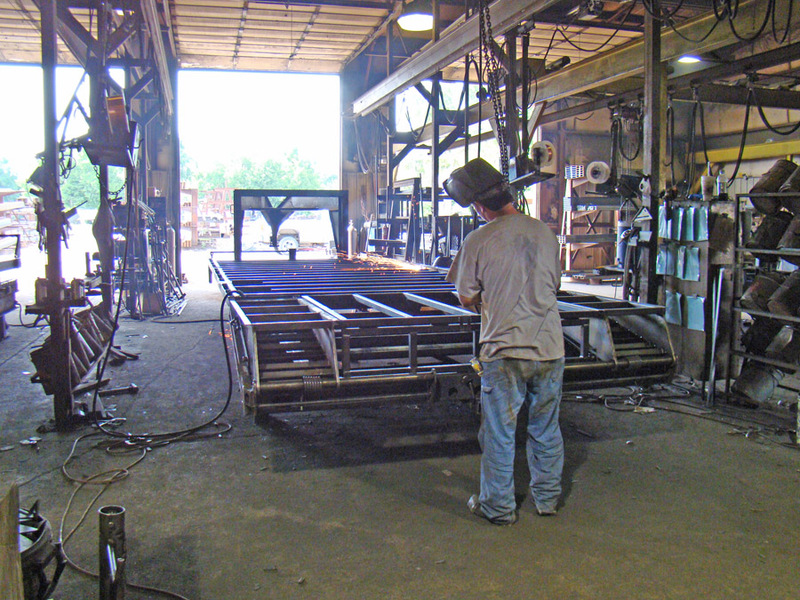 But they make them all, chances are if you need it, they build it. 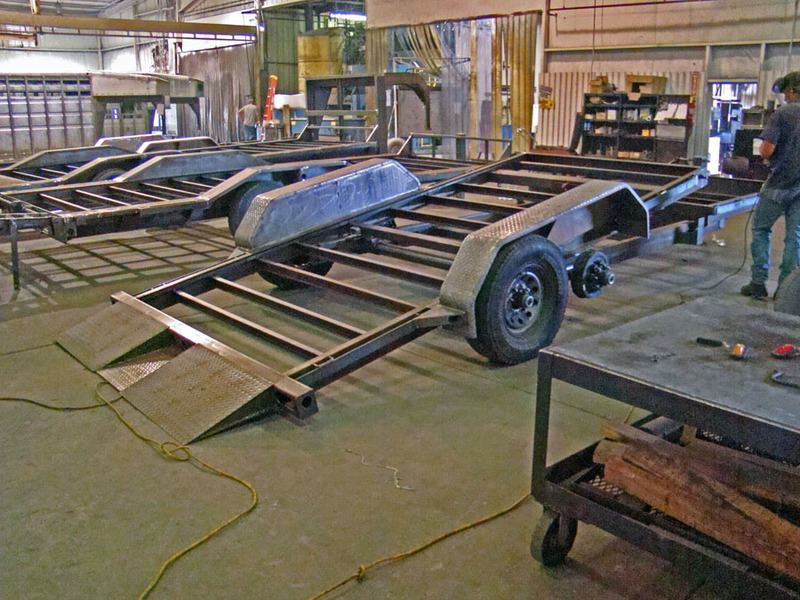 And they build a lot of trailers. 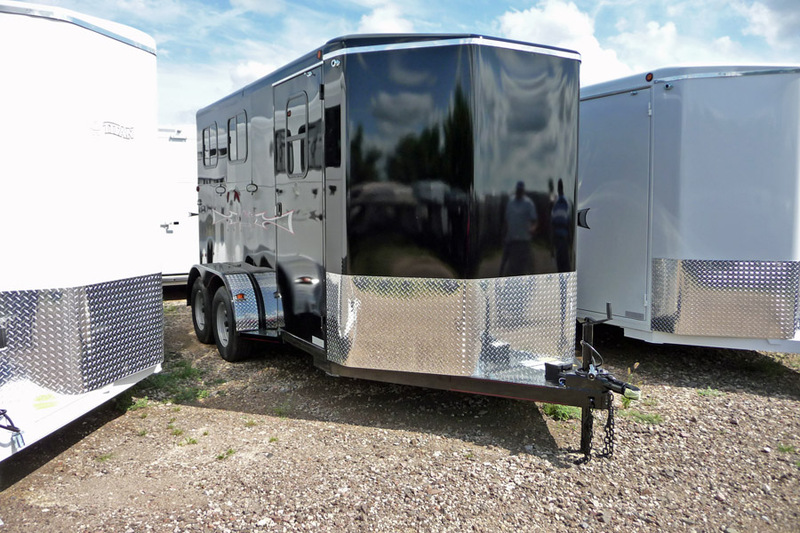 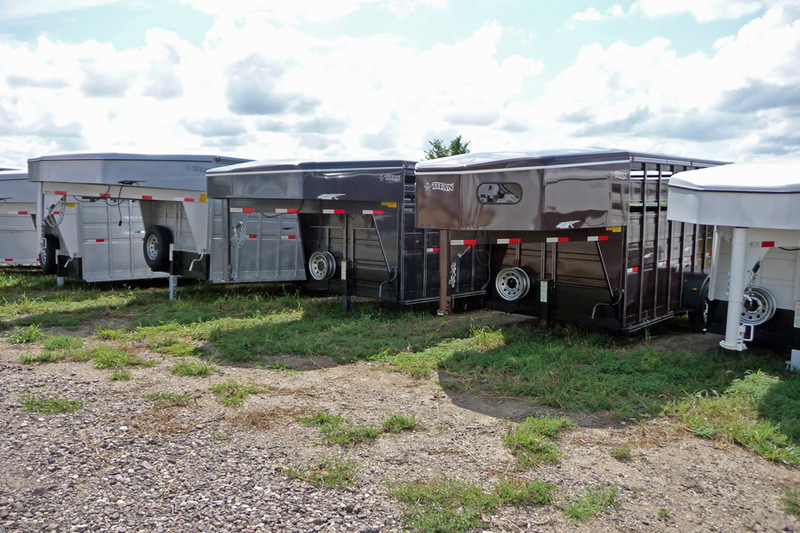 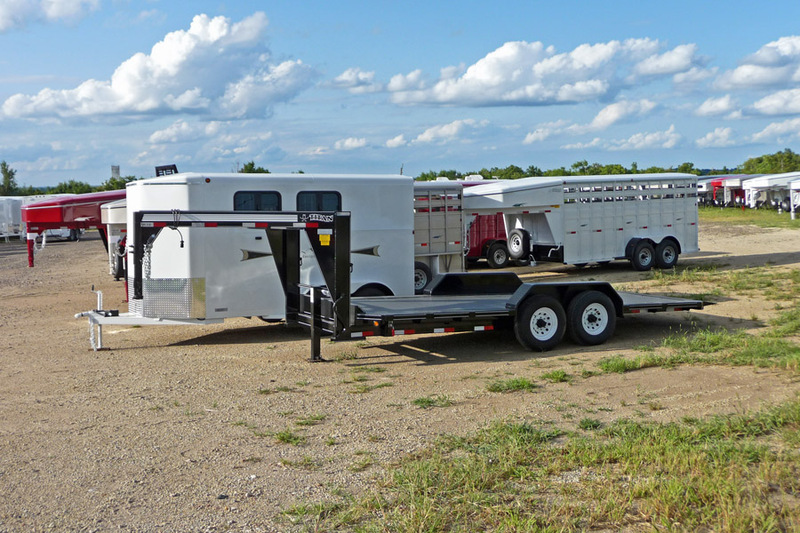 Titan Trailers recently purchased Logan Coach, a horse trailer company. 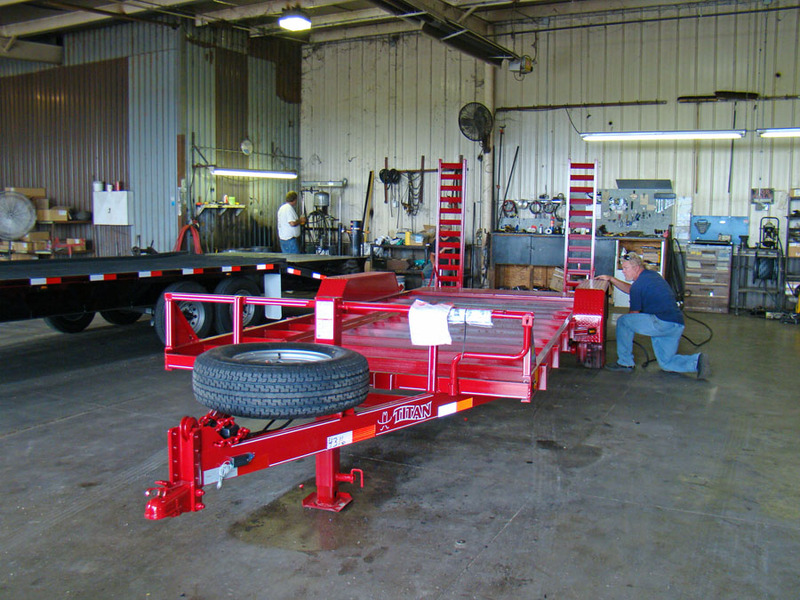 Over the years Titan has acquired many other trailer companies, adding their buying v olume and manufacturing expertise. 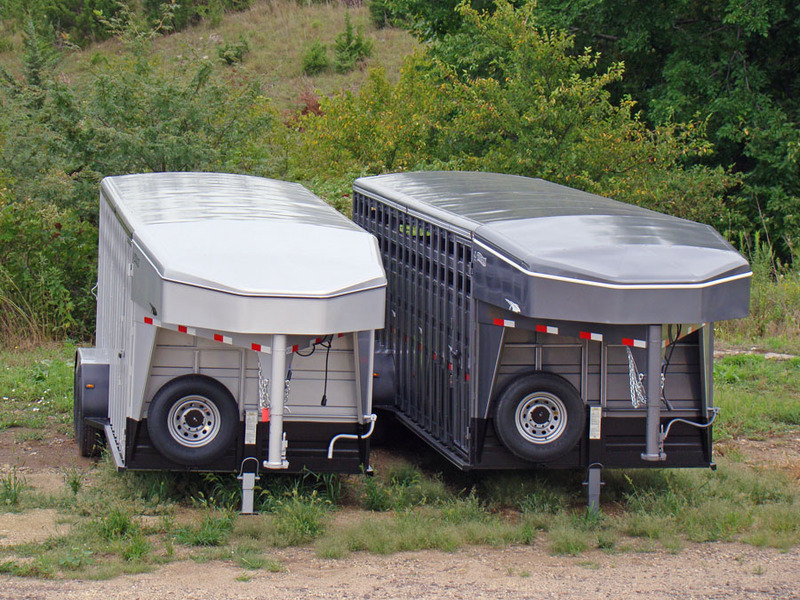 Titan Trailers, steel horse, livestock and flatbed trailers. 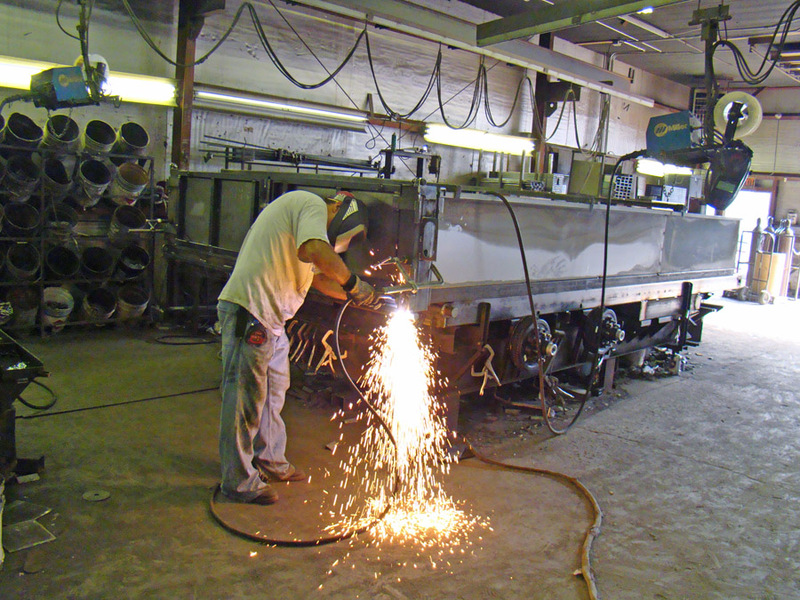 Surviving recessions is all about controlling costs and separating yourself from the crowd with first class problem solving customer service. 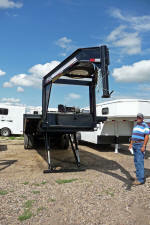 Great 5 year warranty with Titan going the extra mile, according to customers I’ve talked to. 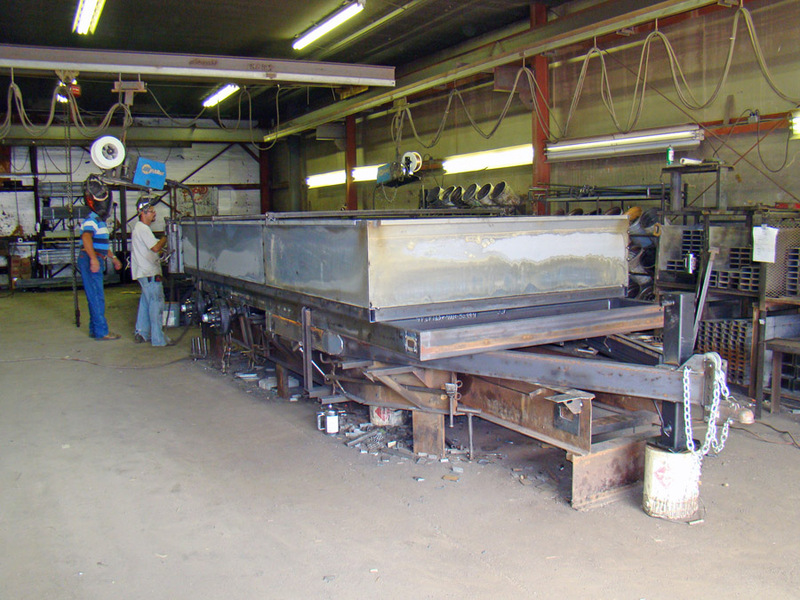 “Flatbed Frank” Nietfeld, (picture left, 20 years) like many of the long term employees are part of the “farmer pool of knowledge.” Engineering farmers are the most practical, as Dave Smerchek tells his crew, “when in doubt make it stout.” Dave Smerchek built his first stock trailer in 1986 after working for other trailer companies before building Titan Trailers. 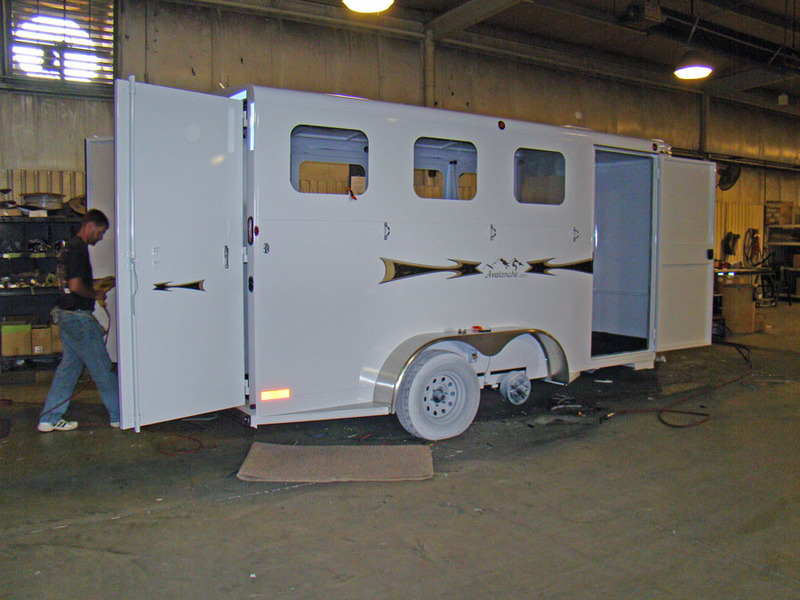 Not many trailer company owners can say they built the first one. 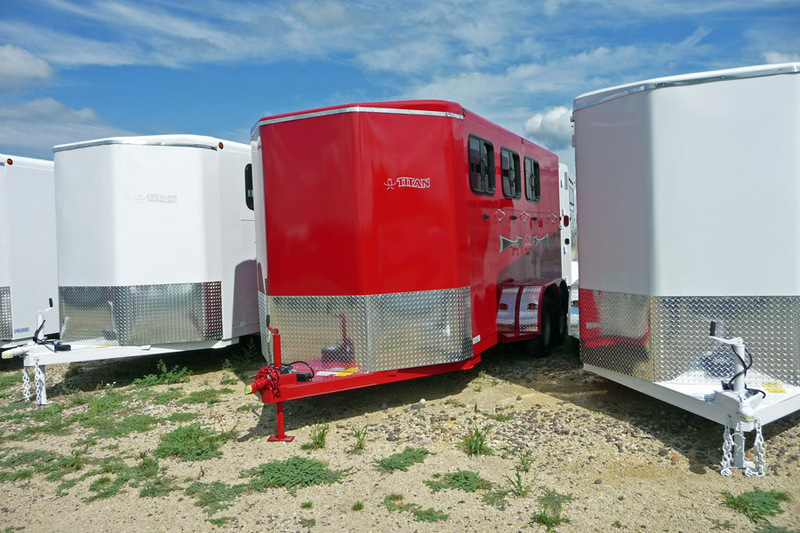 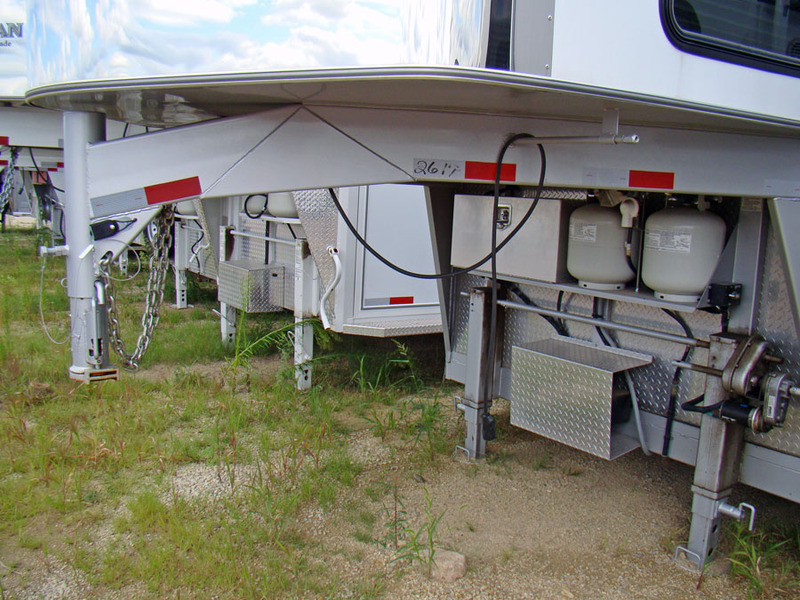 With the success of Titan, Dave has acquired other trailer companies that add to the strength of the Kansas company. 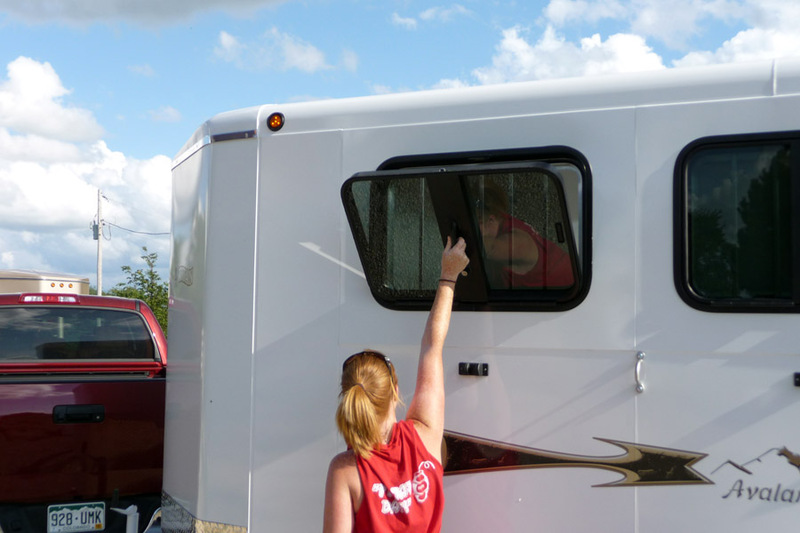 Surviving in hard times is all about watching the bottom line. 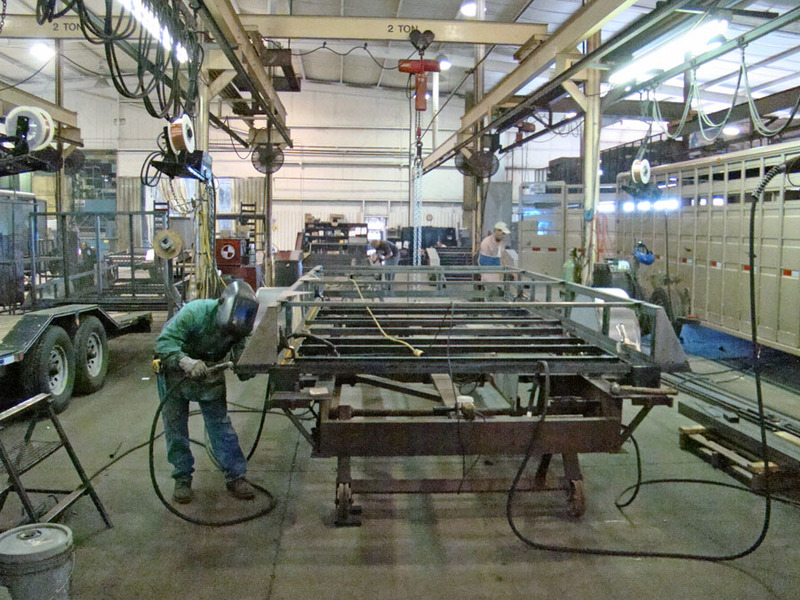 In the heartland of farm country, local welders have job stability doing piece work to keep labor rates competitive. 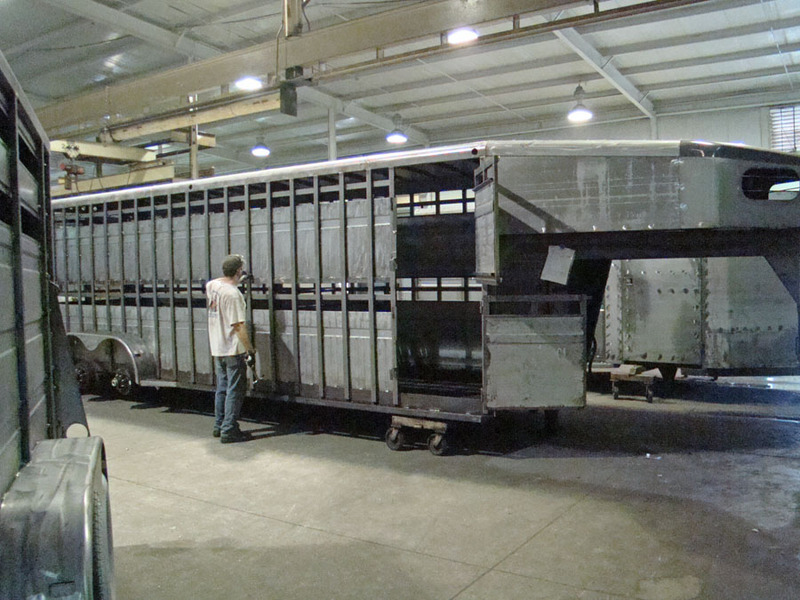 That’s what the auto makers need, a crew of Kansas farmers getting it done. 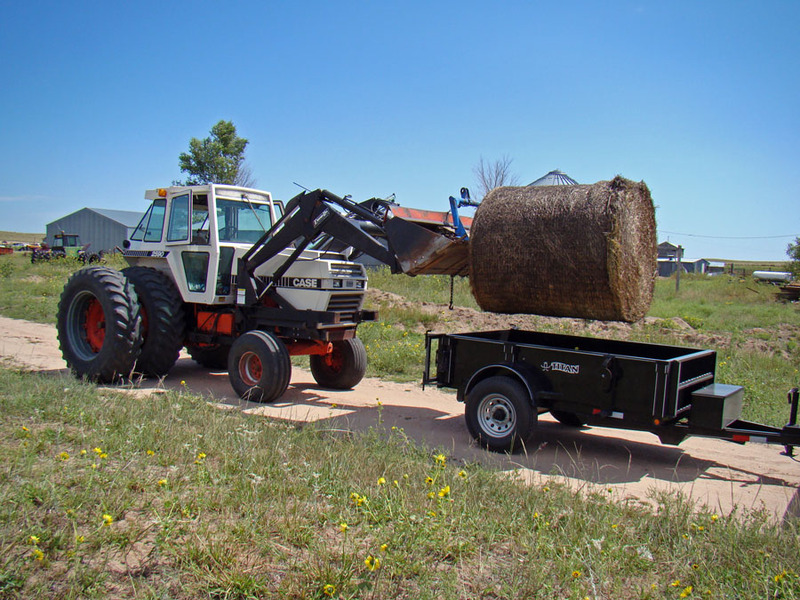 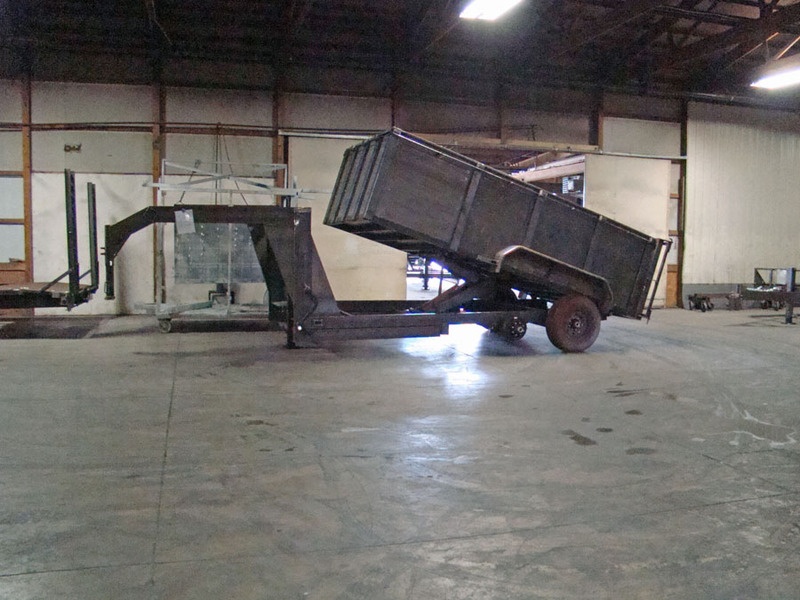 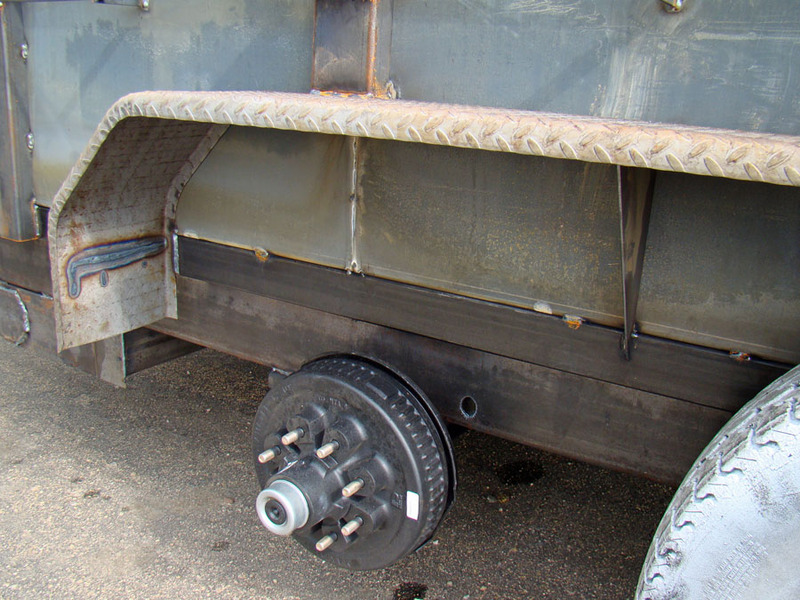 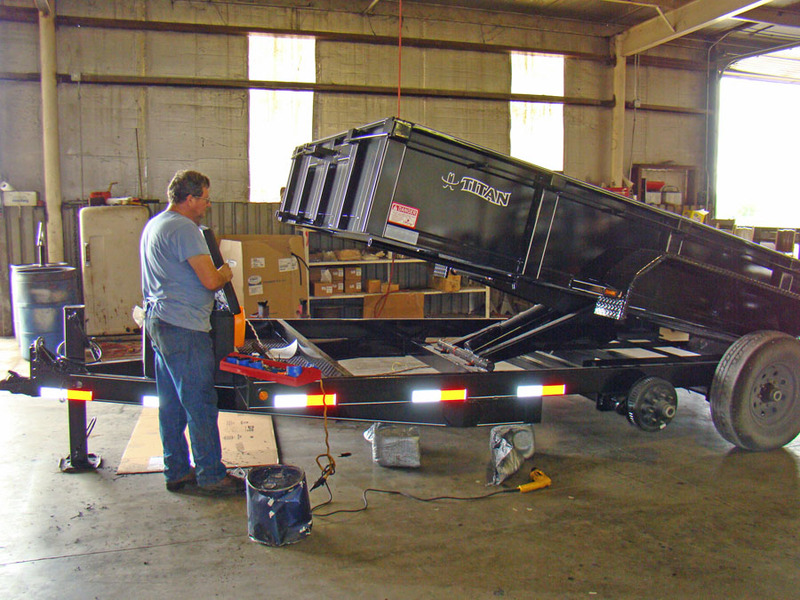 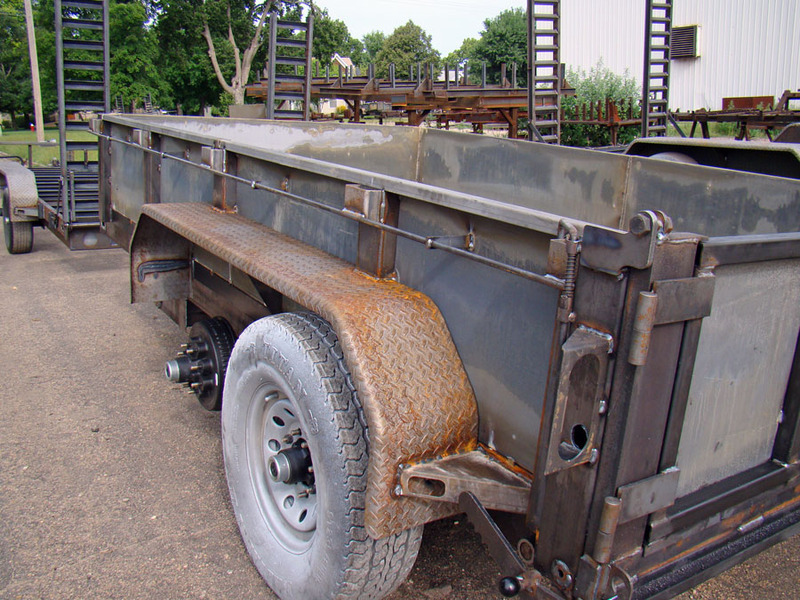 Dump trailers and tilt flat beds are double framed with 16″ center on stringers. 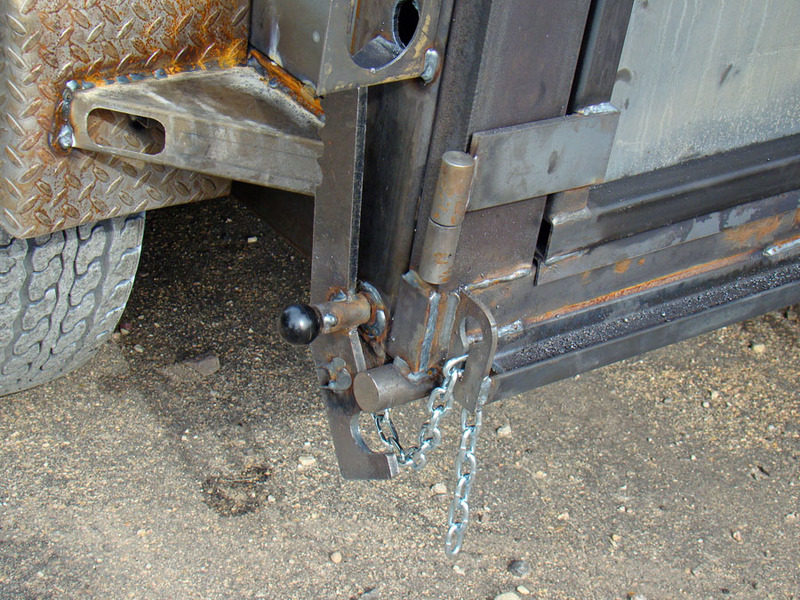 Torsion axles are on everything, as they should be. 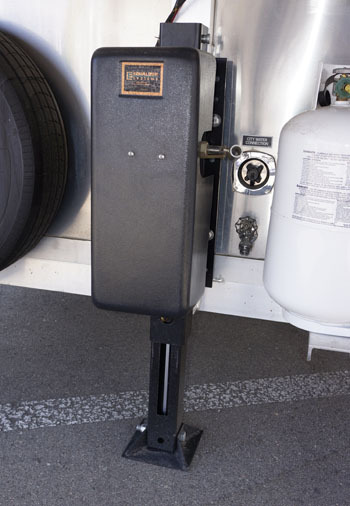 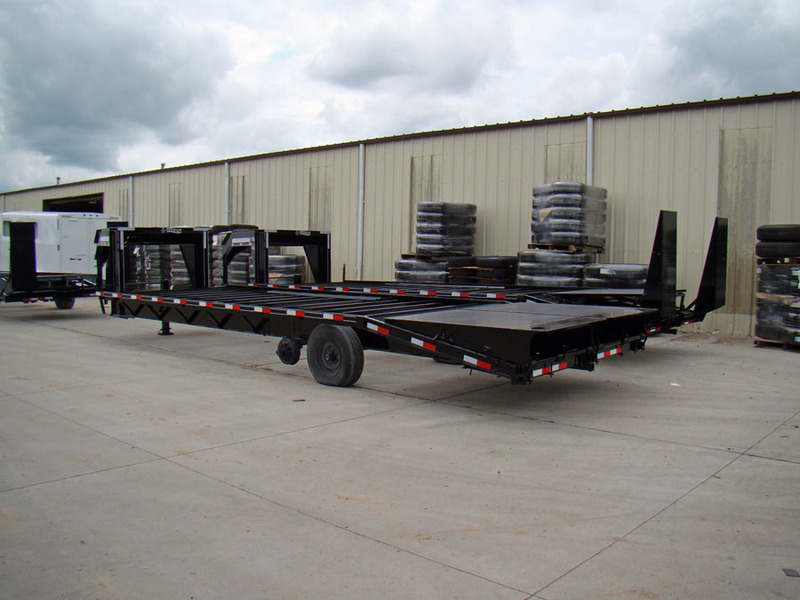 They provide a great ride and stability for a road trailer. 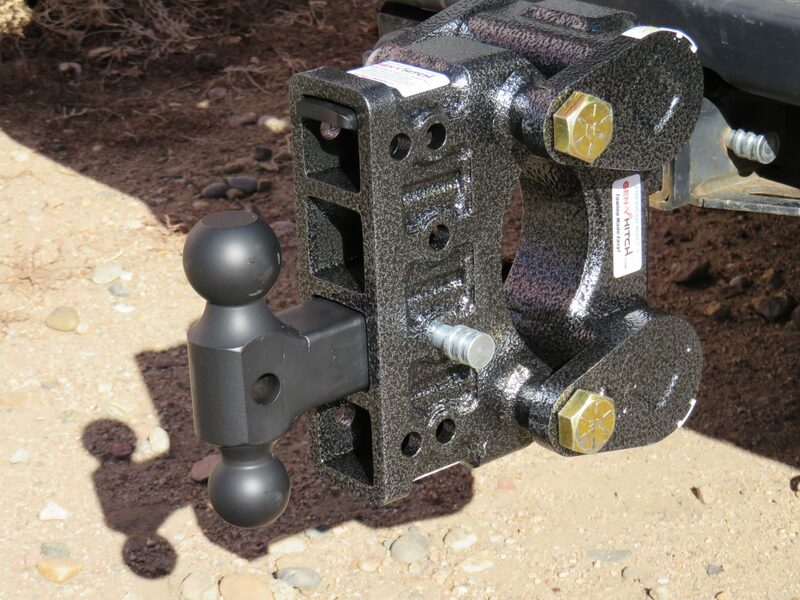 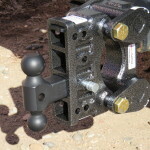 Axle’s are also in a jig to align with coupler for straight towing. 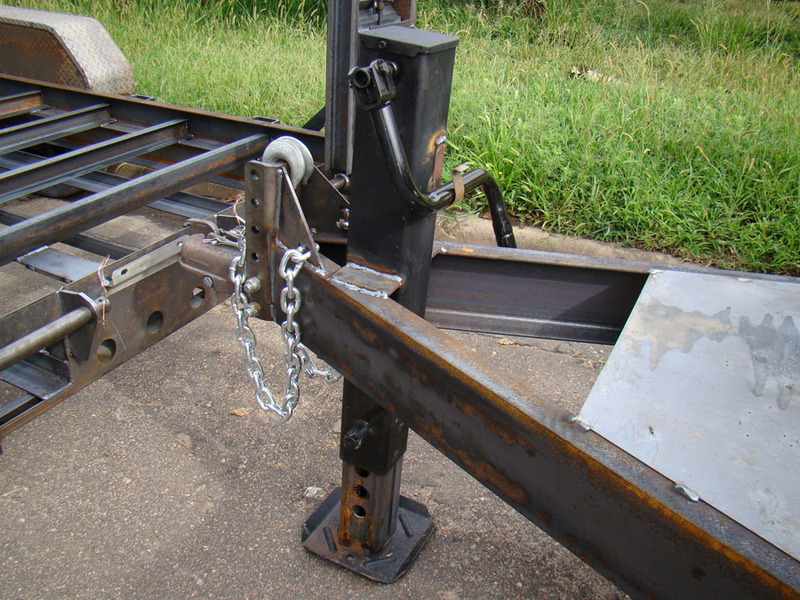 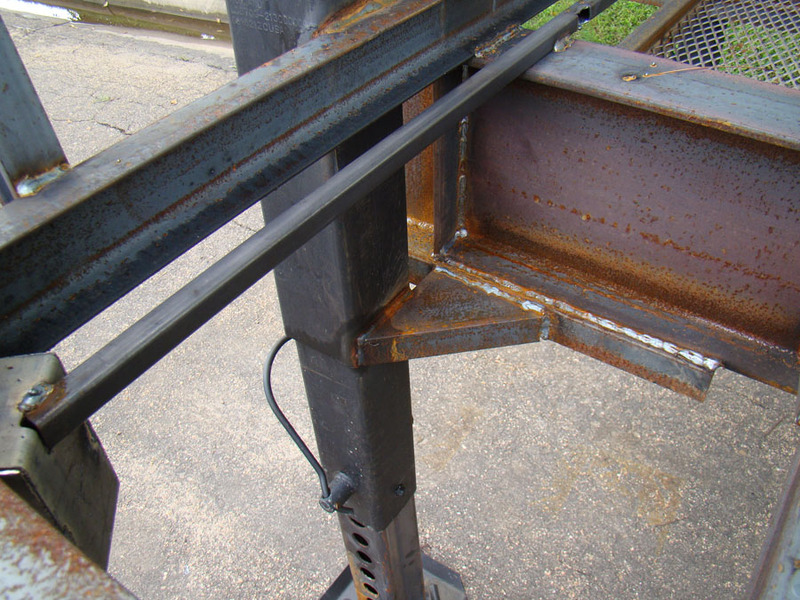 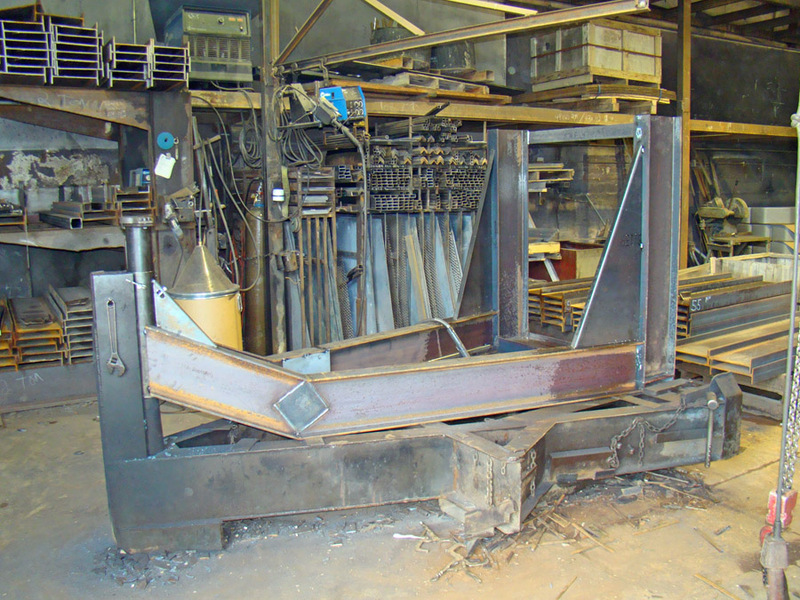 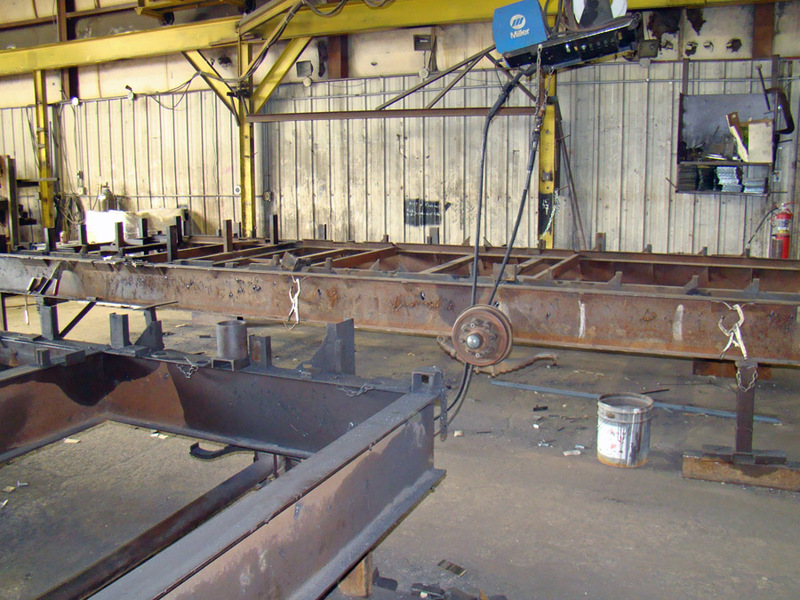 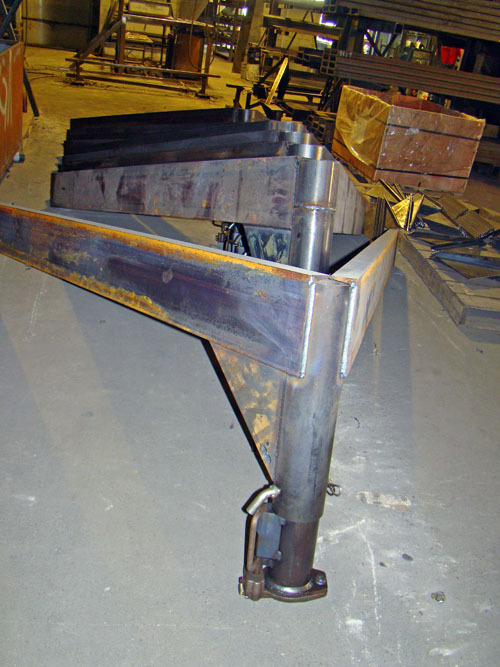 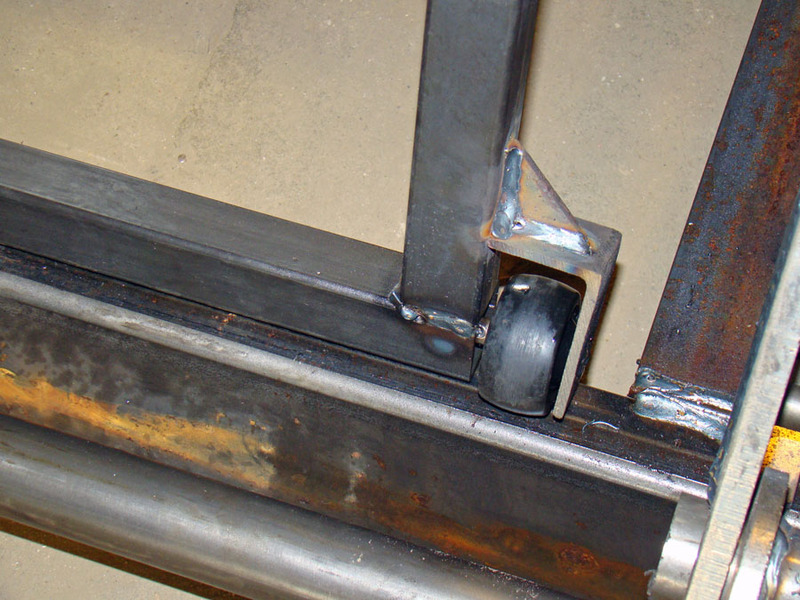 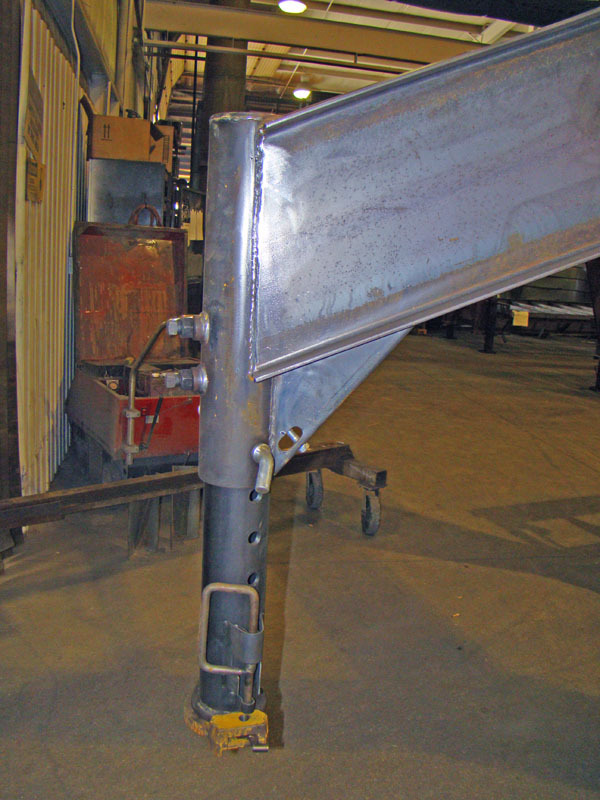 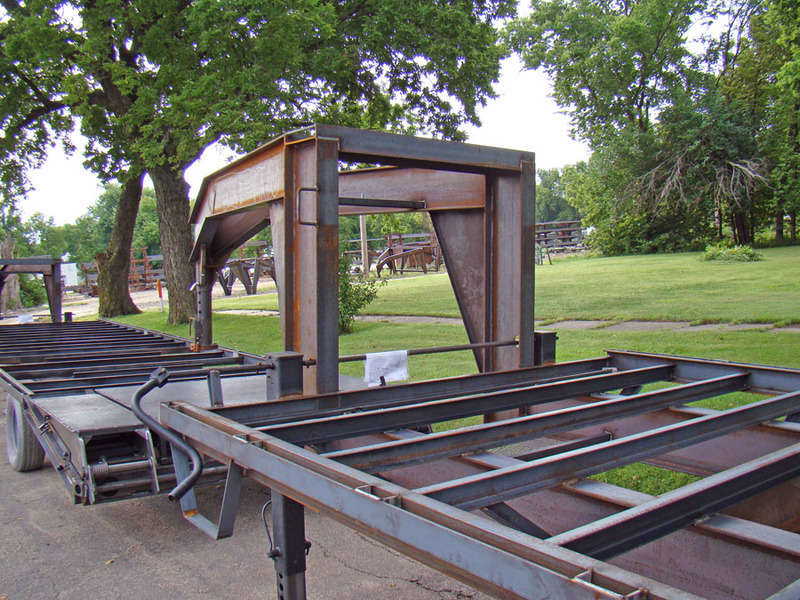 One jig for the bottom of flatbed trailers, above picture left is a gooseneck jig that allows easier welding by flipping the top. 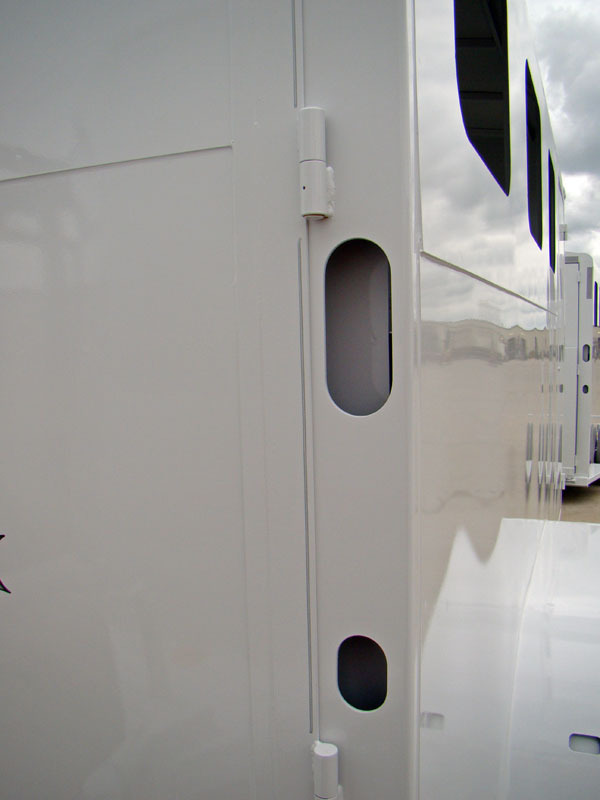 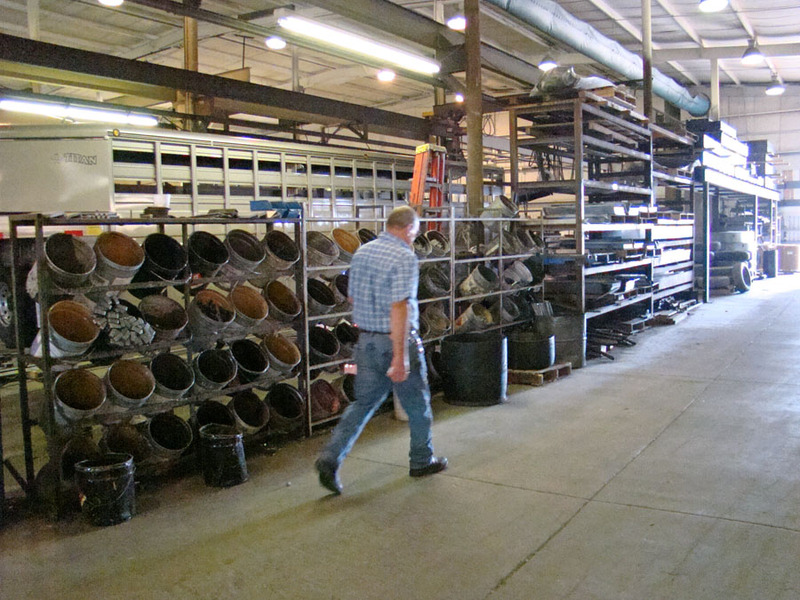 Side by side trailer lines (picture above right) keep the streamlined production flowing threw the enormous building. 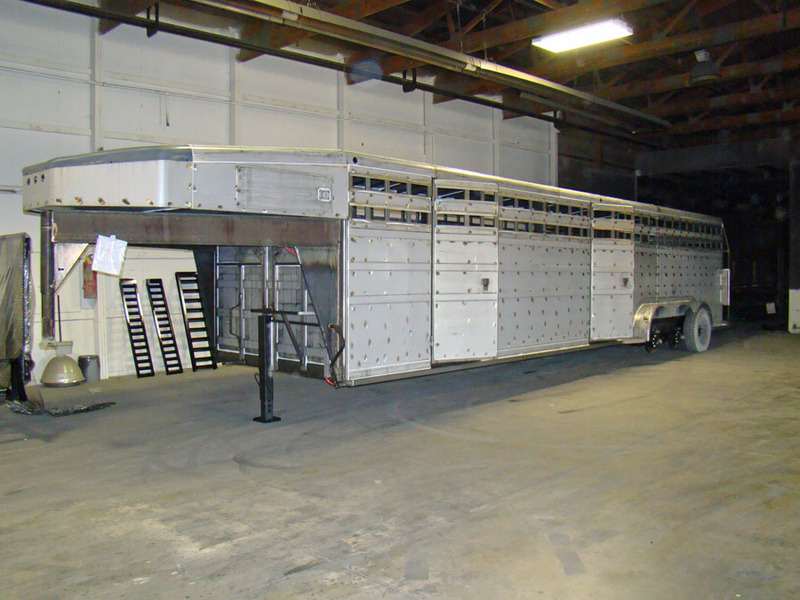 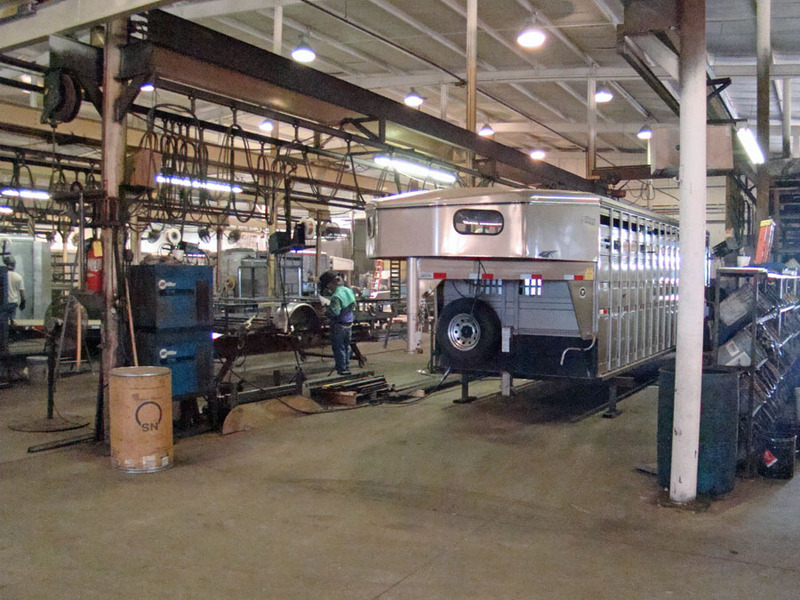 Horse trailers, flatbeds and construction trailers built next to each other in an efficient assembly line. 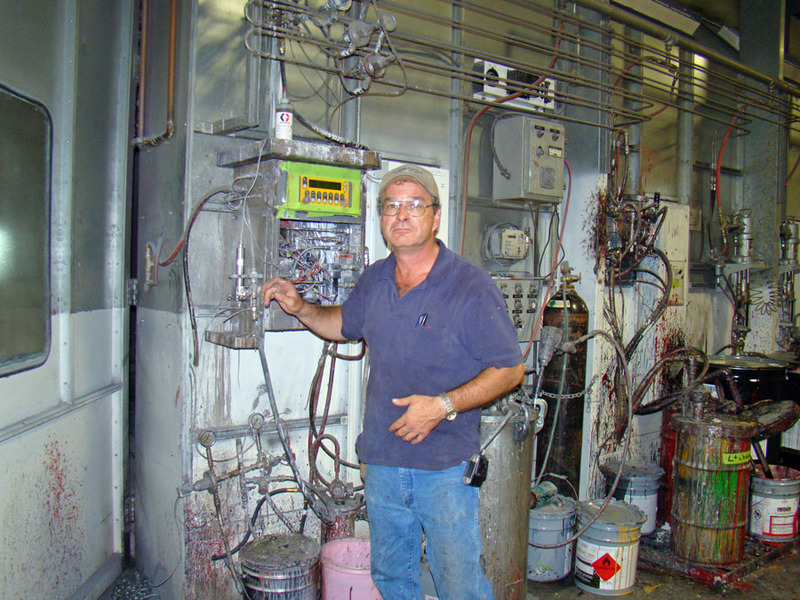 All wiring goes thru conduit, made in the factory. 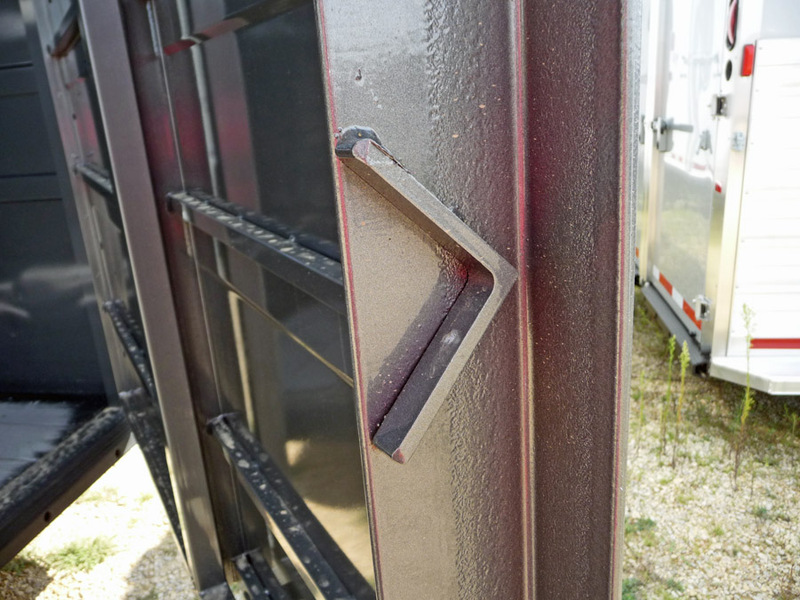 Greasing hinges is different too, no zerks, just holes so you can use a grease needle that works instead of replacing grease zerks way too often when they freeze up. 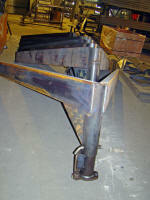 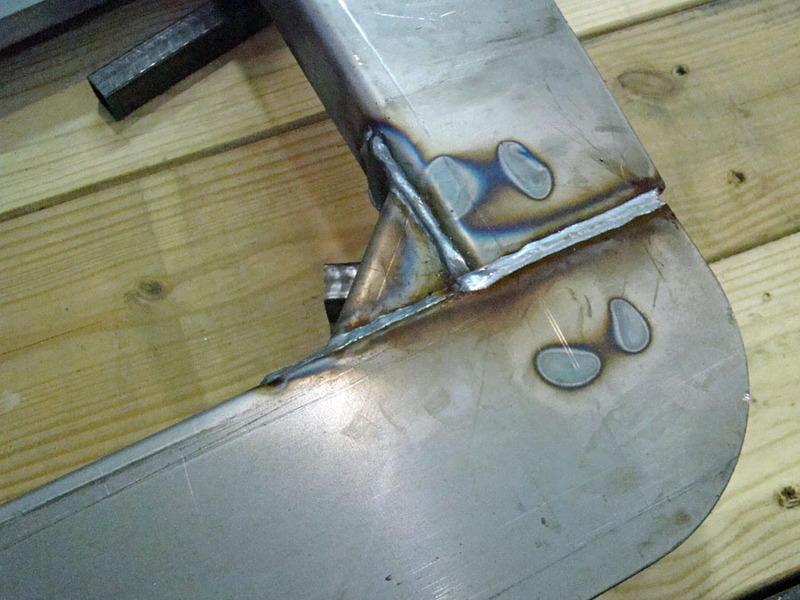 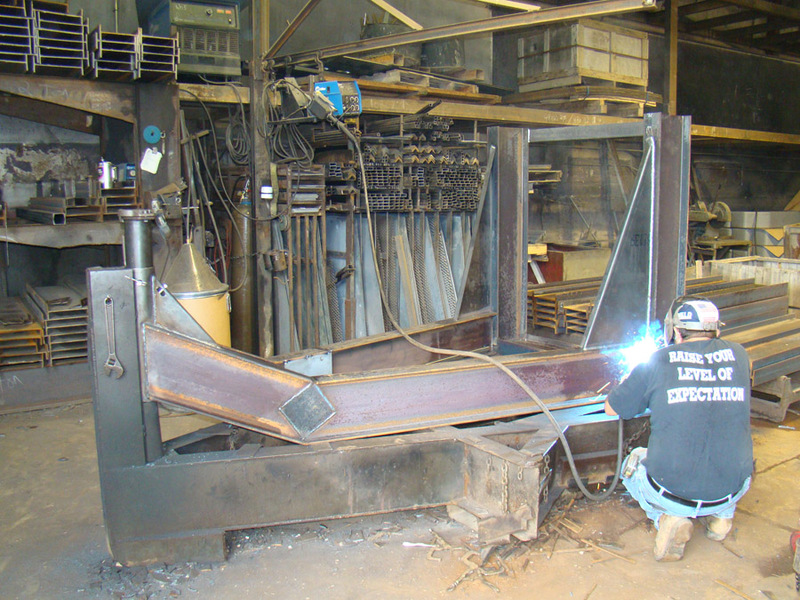 No tape measures here, pieces are built the same, they fit, the welders just weld. 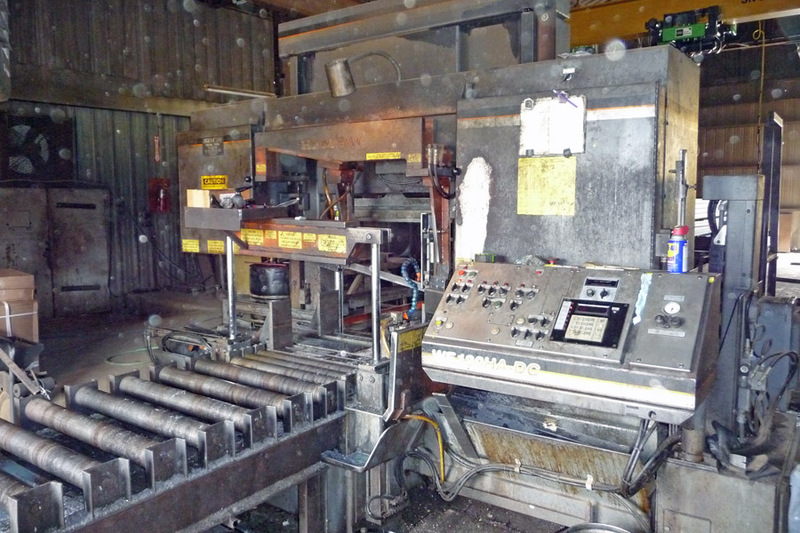 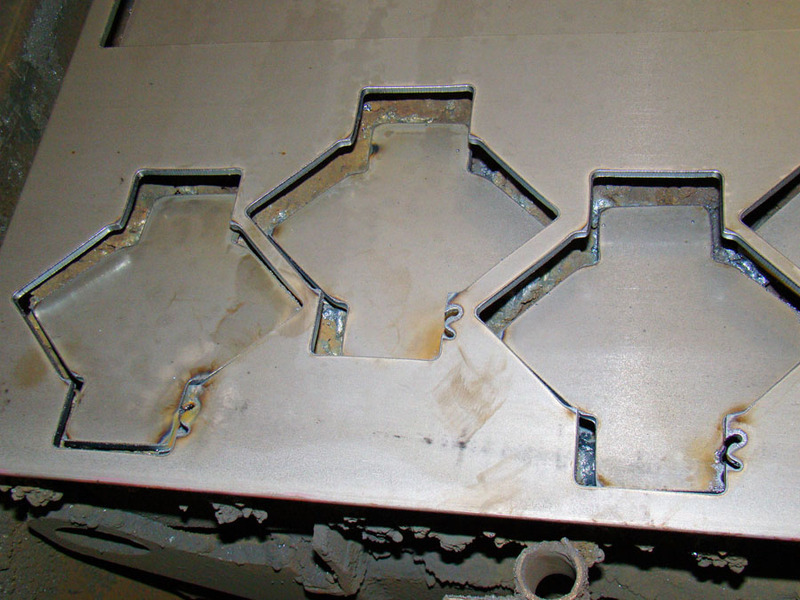 All sheet metal is Galvannealed. 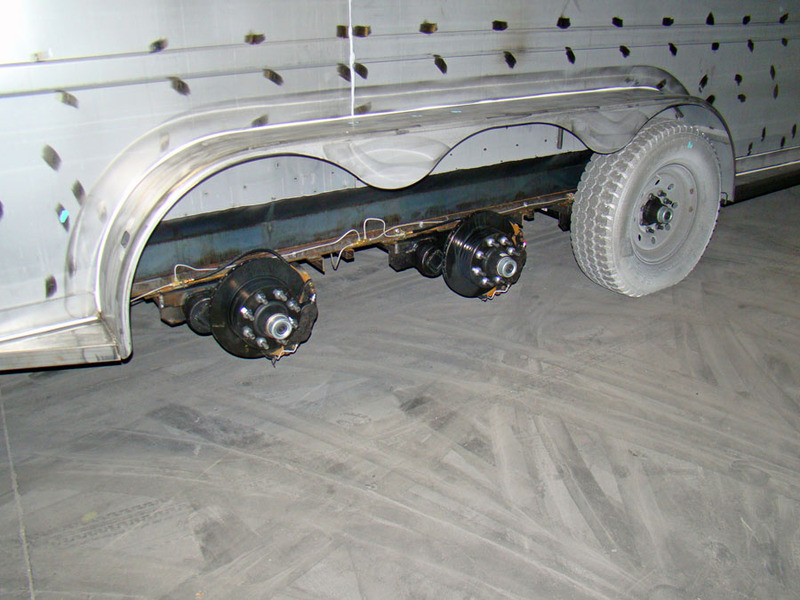 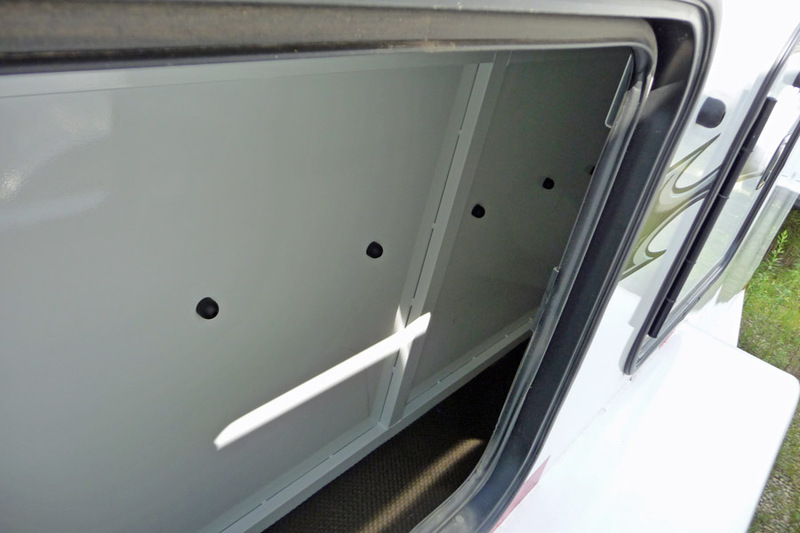 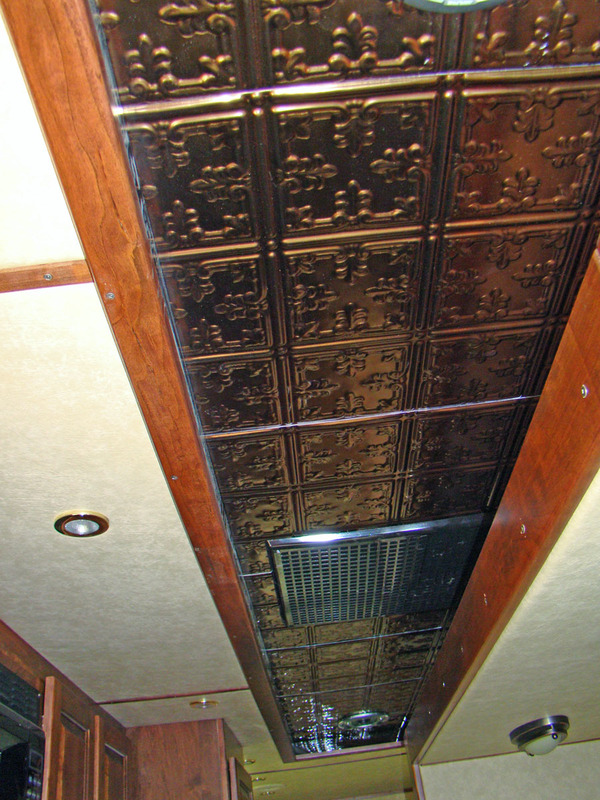 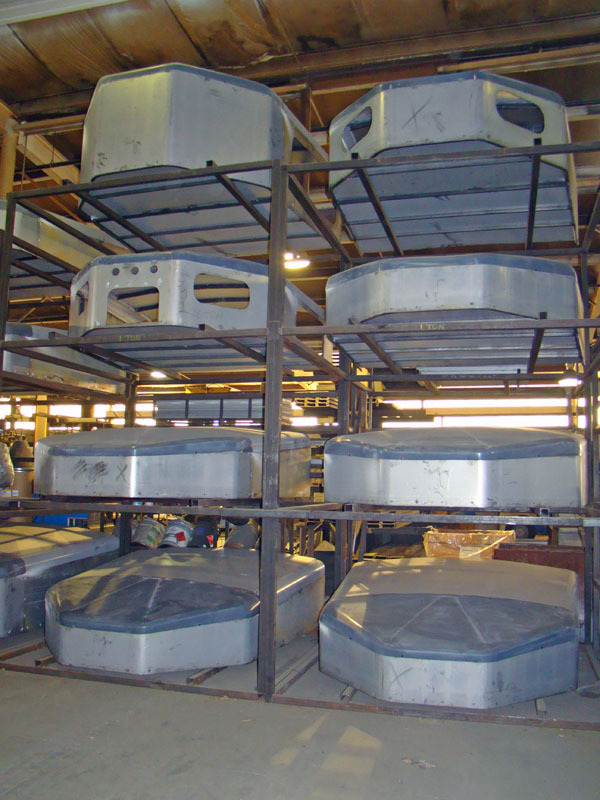 Scorpion bedliner coating is used on bulkheads and fender protection preventing rust and electrolysis. 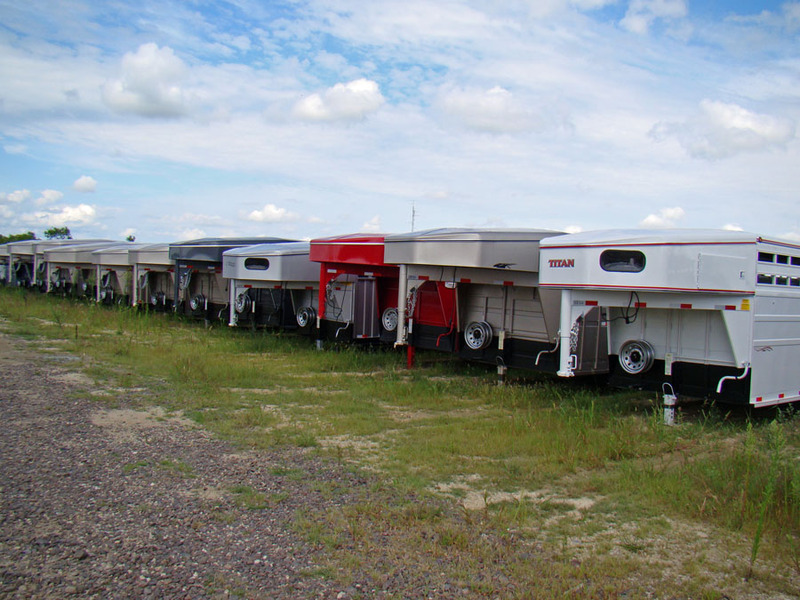 When you’ve built trailers for over 24 years, you have long term repeat customers that stay over to pickup their next trailer. 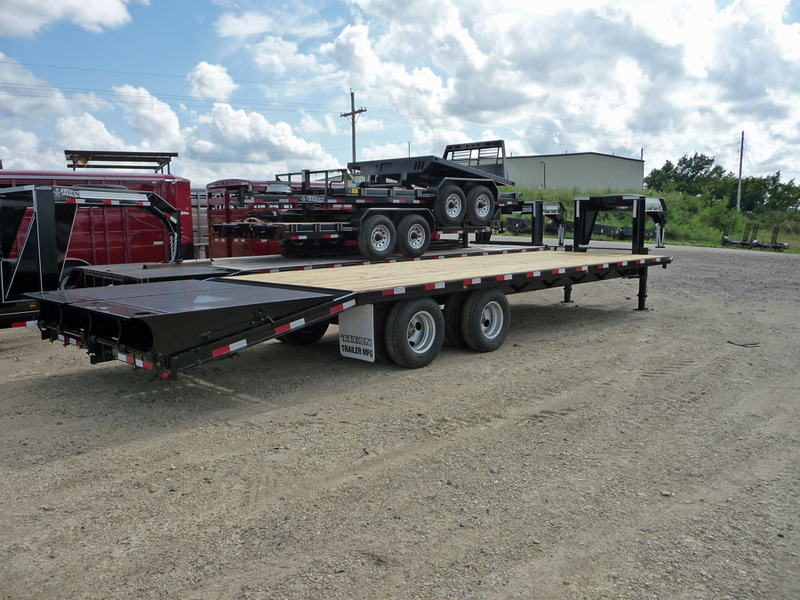 Big trailers, Titan is well know for big strong stock trailers. 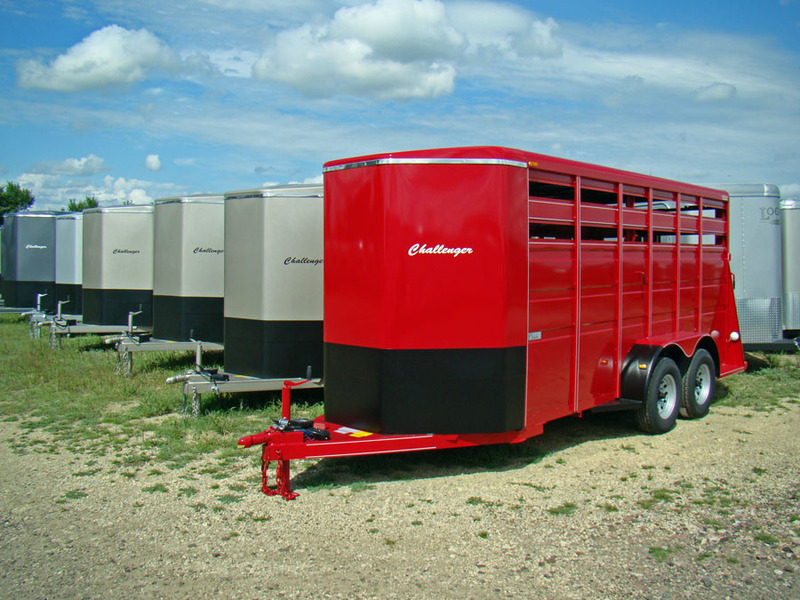 Biggest test of a trailer is cattle. 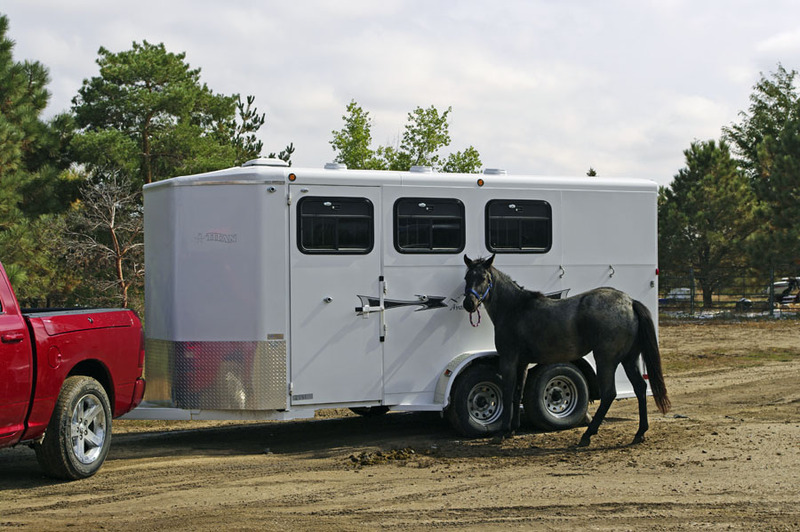 We worry about horses with their high center of gravity swatting flies with their tails and rocking a trailer. 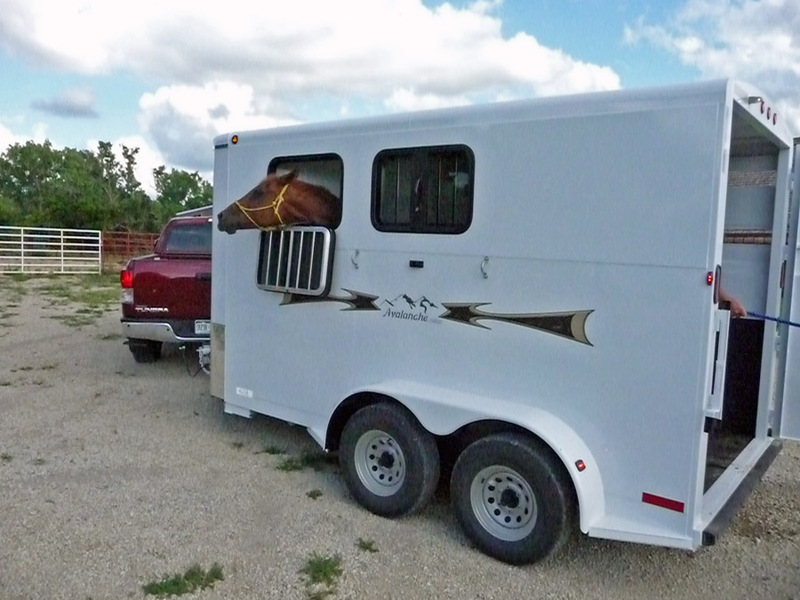 But horses most of the time are quiet compared to cattle. 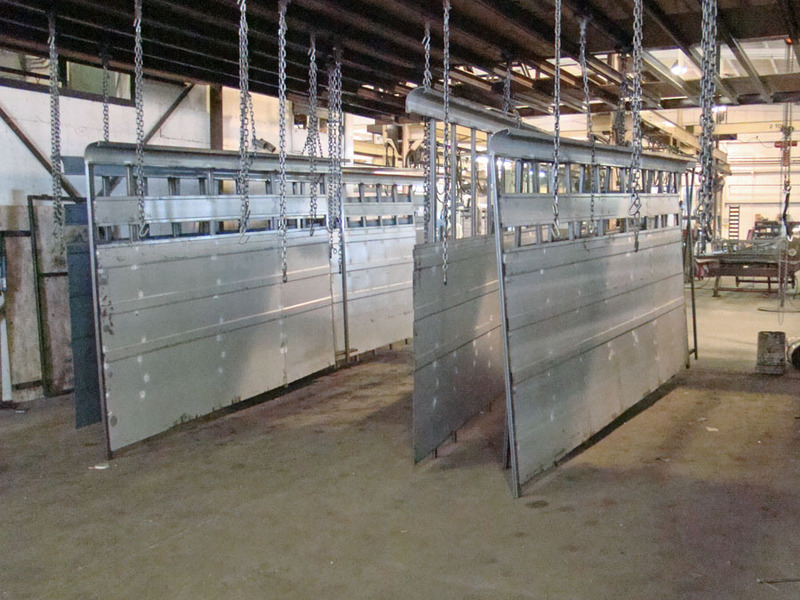 Cattle move in all directions on a trailer trip and are constantly pushing on walls and gates. 16″ side post spacing, 12″ with bull package. 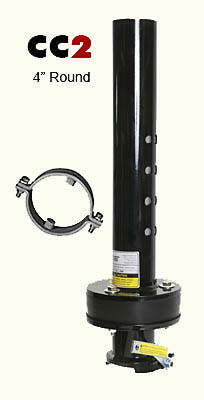 1×2″ post, 14 gauge. 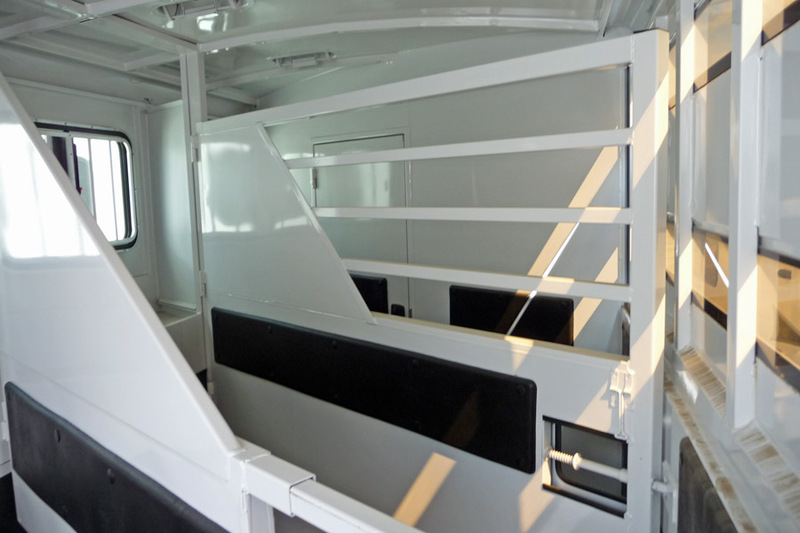 Galvanized sheet metal, Scorpion bedliner on the bulkhead and fender face. 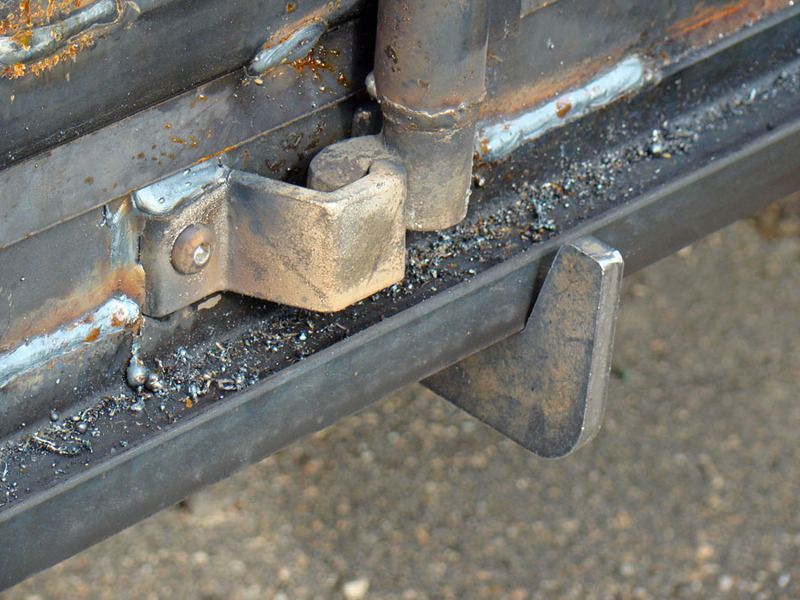 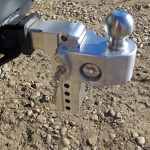 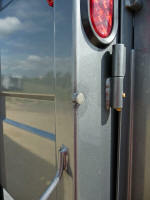 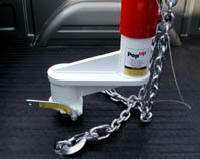 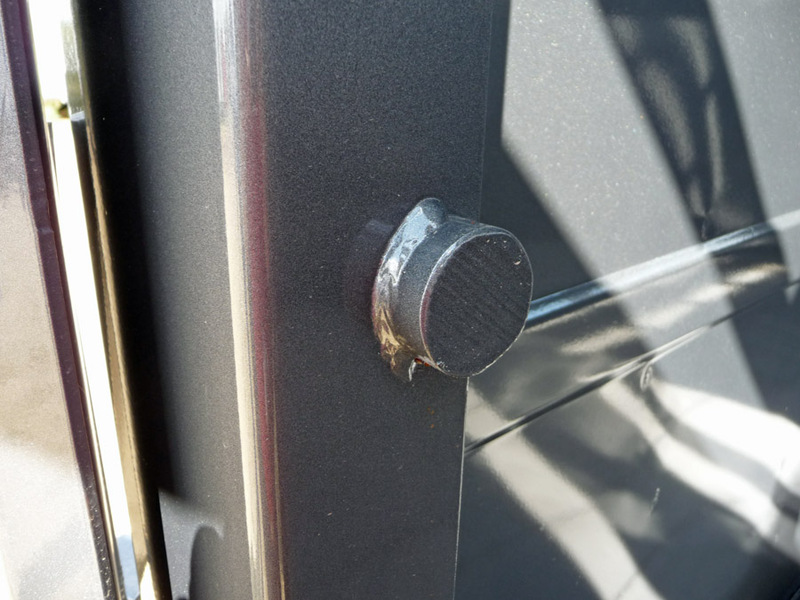 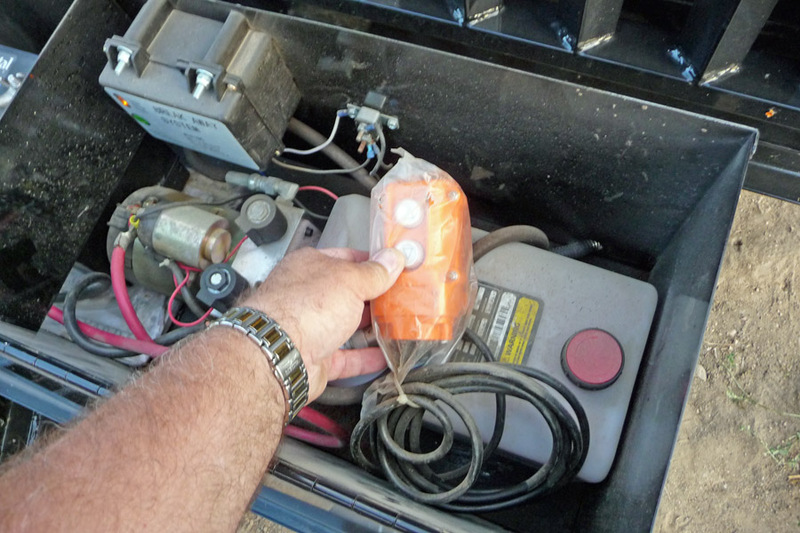 Gate latch (left) from roof bows keeps inside gates out of the way for loading fast. 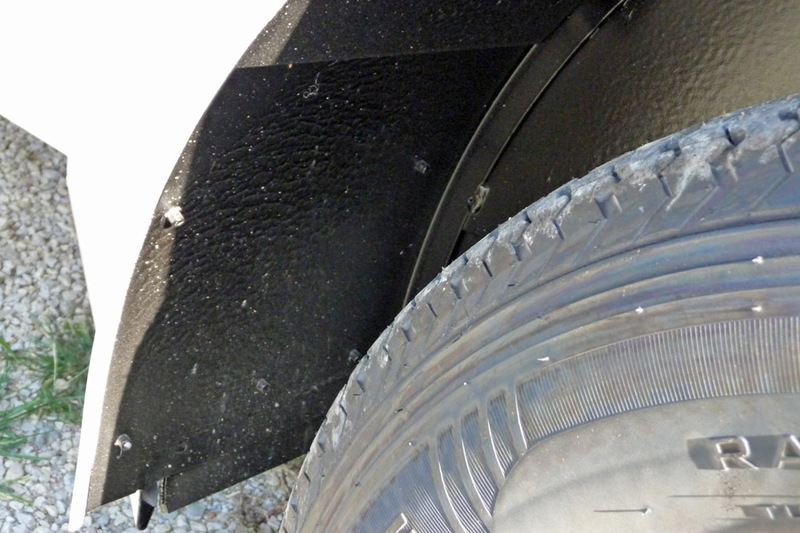 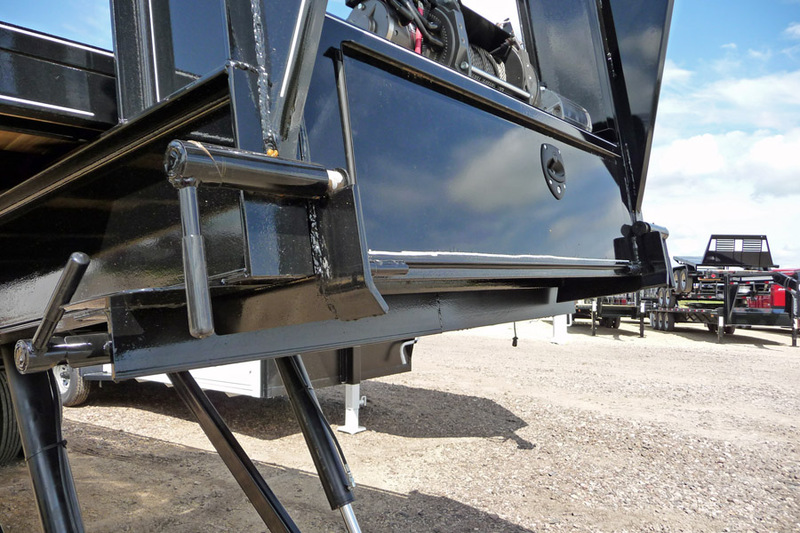 Scorpion bedliner coating inside the fenders (picture right) and on bulkhead and fender faces. 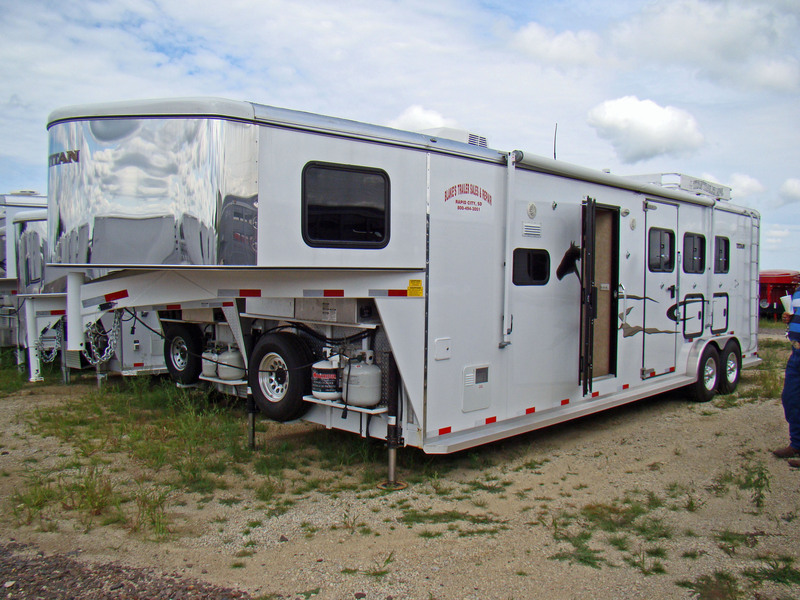 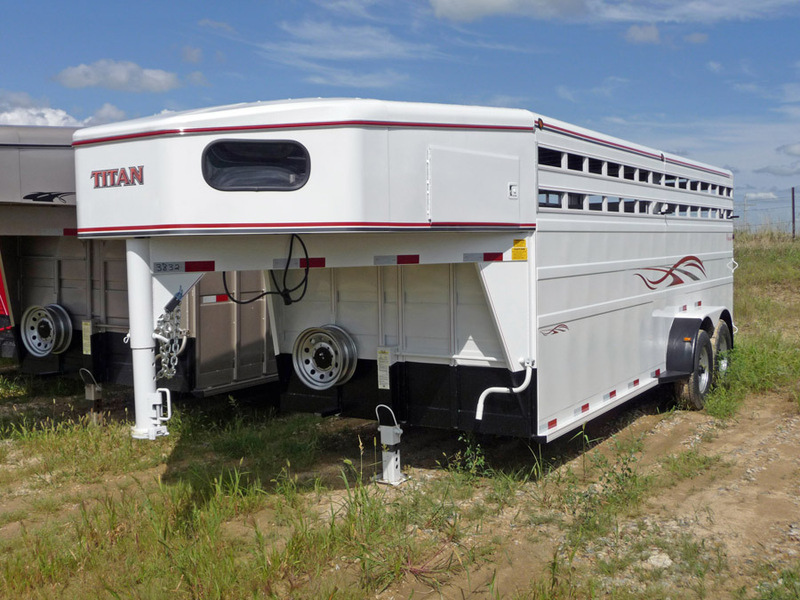 Rancher model with it’s vertical heavy ribs is another trailer company that became part of Titan Trailer family. 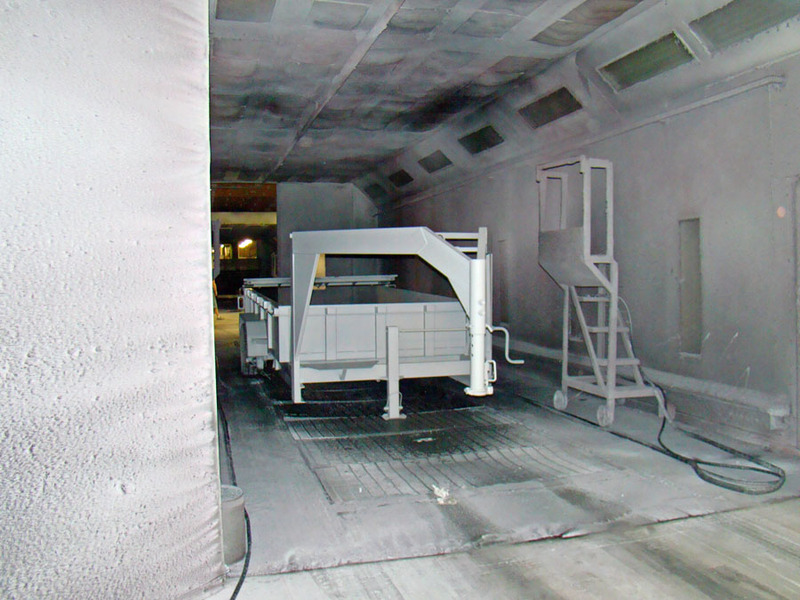 One of the quality features Titan is know for is the DuPont paint process. 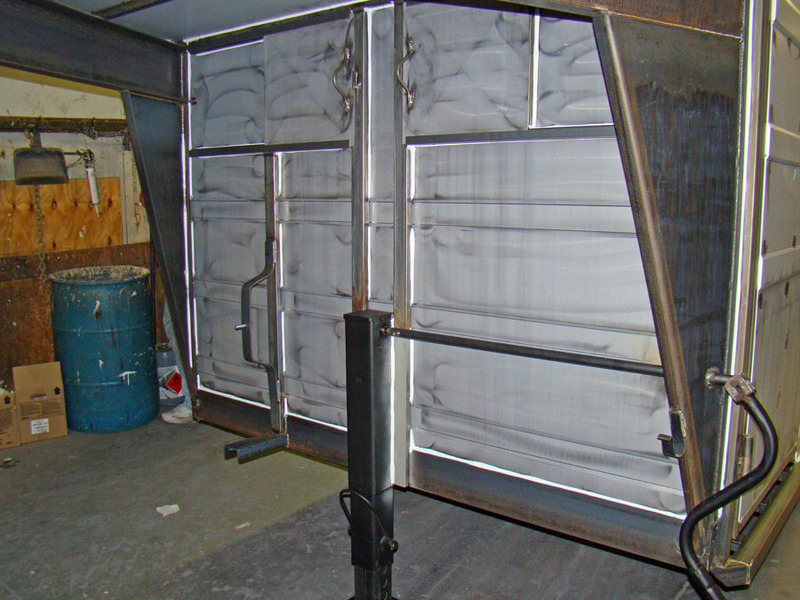 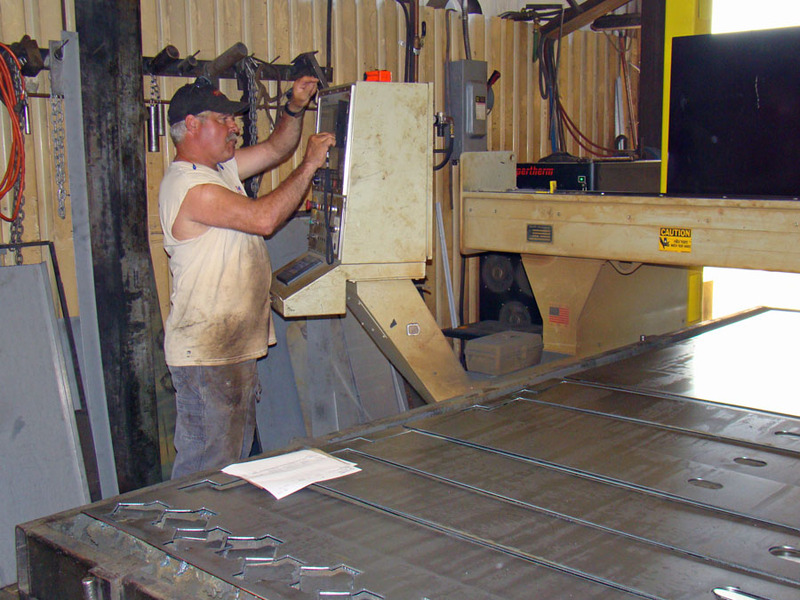 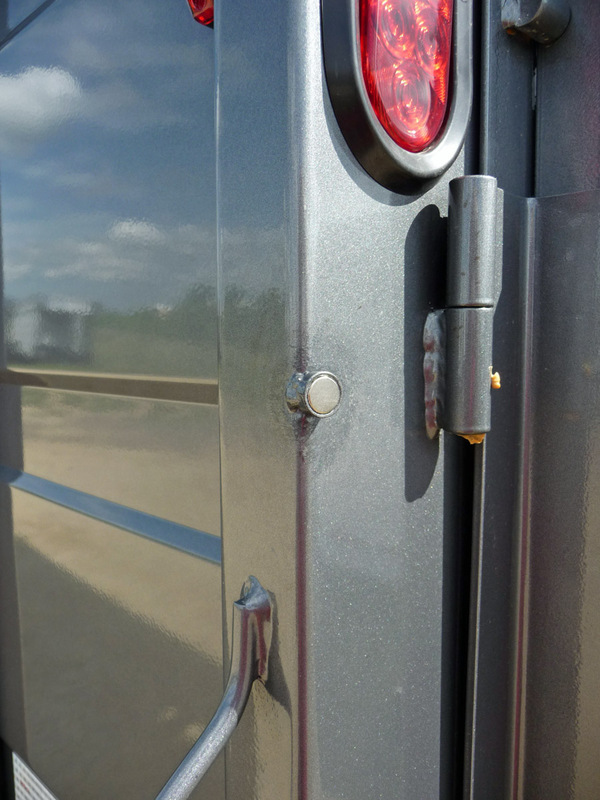 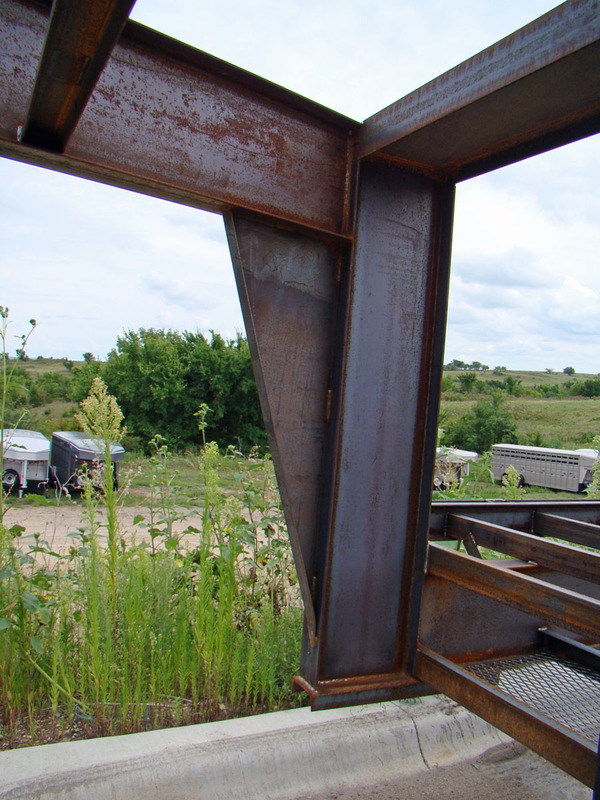 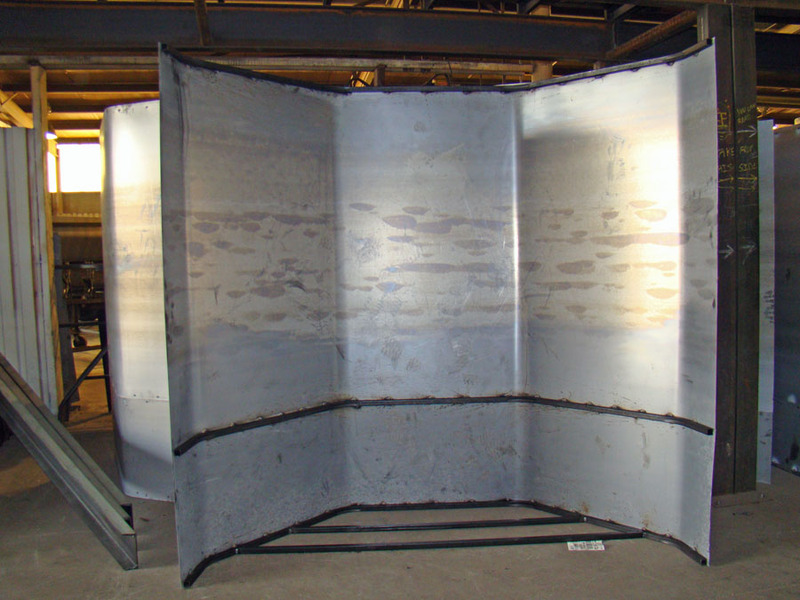 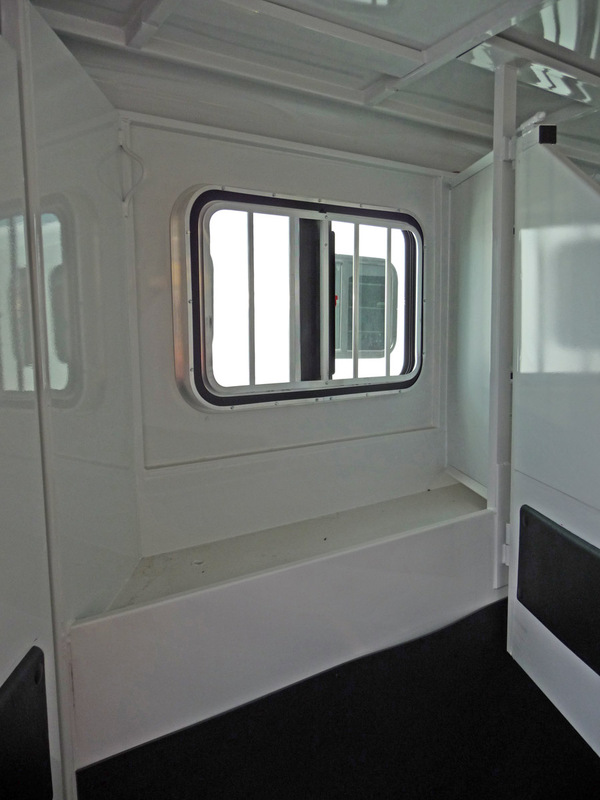 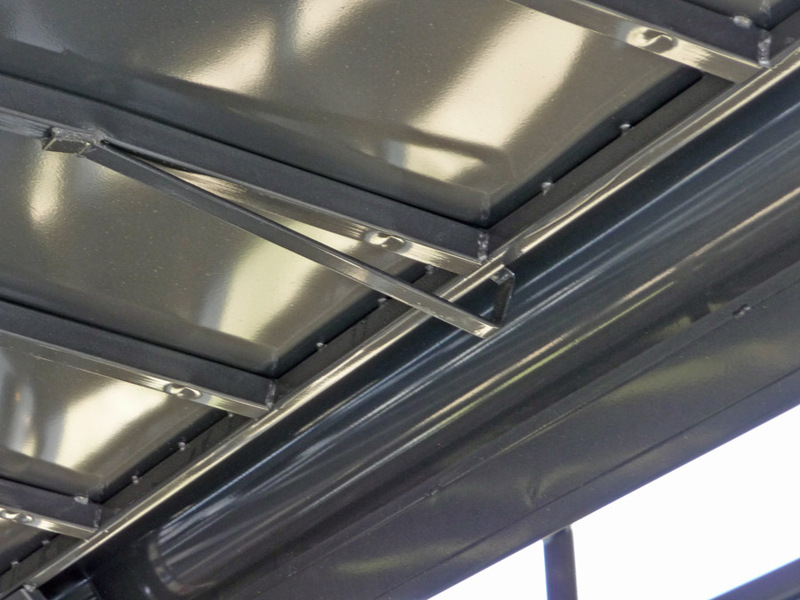 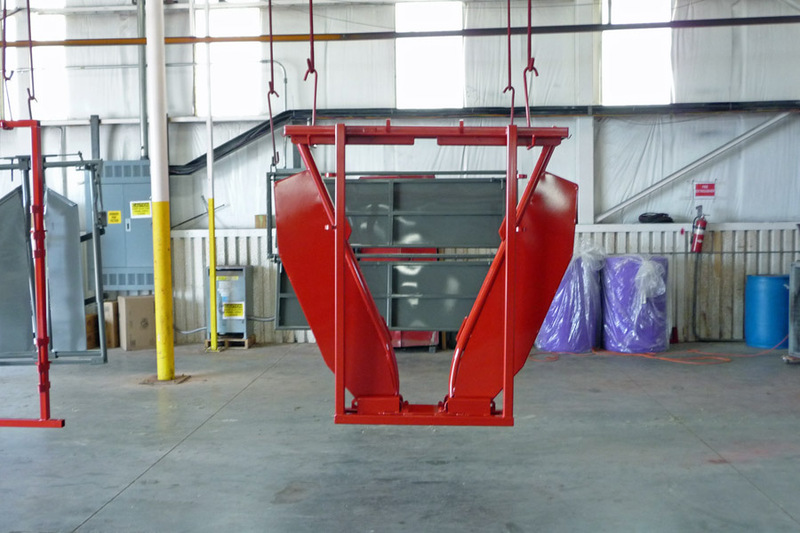 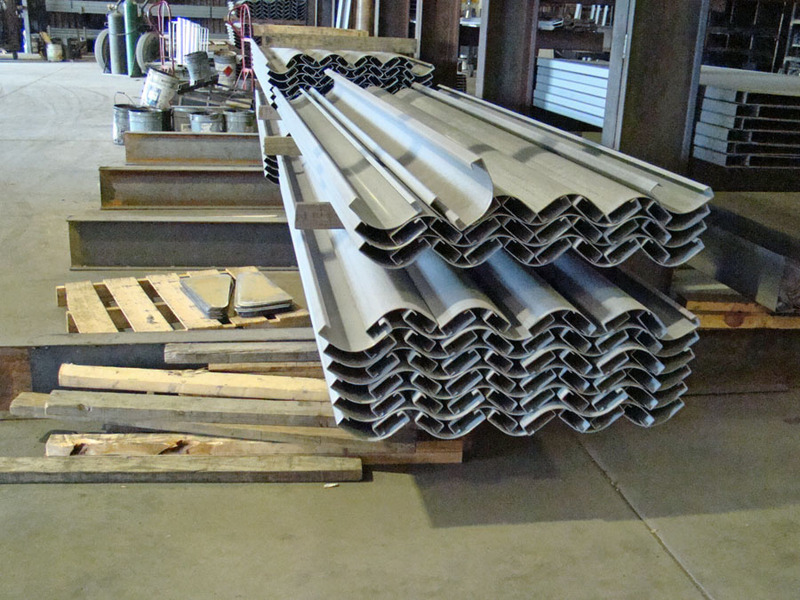 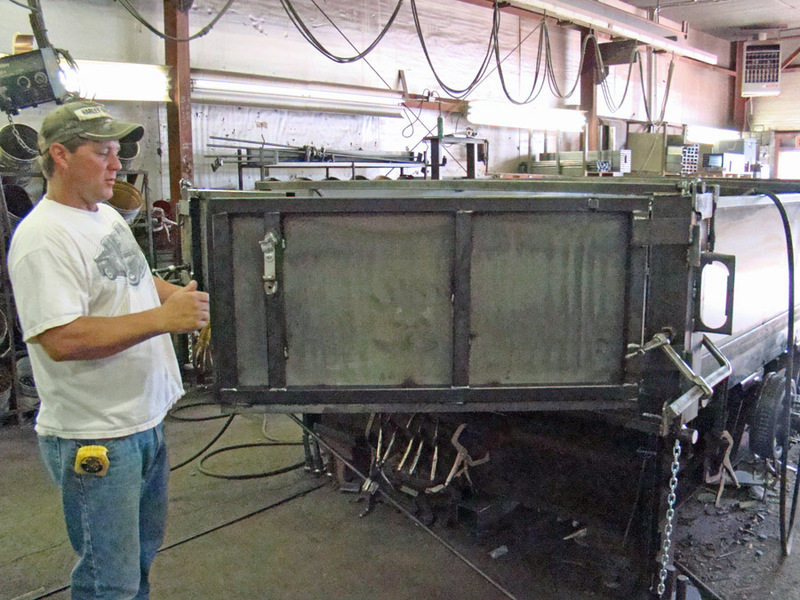 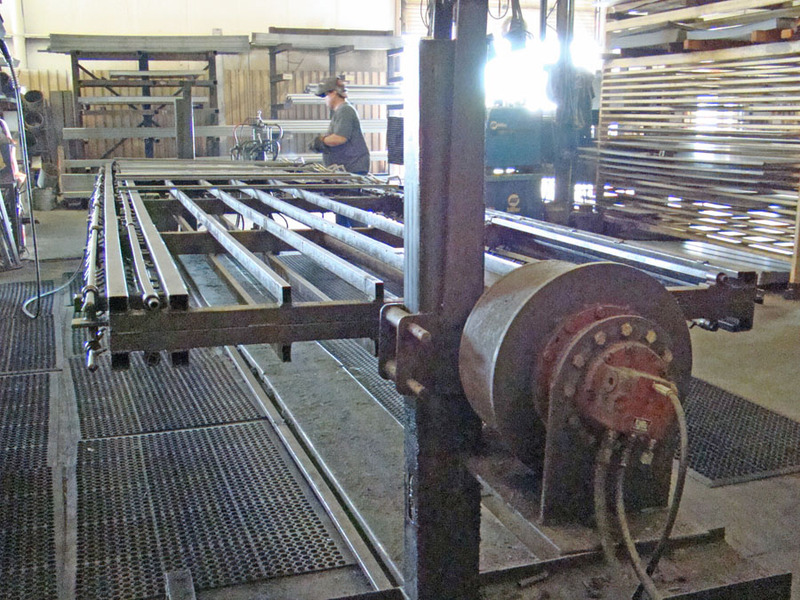 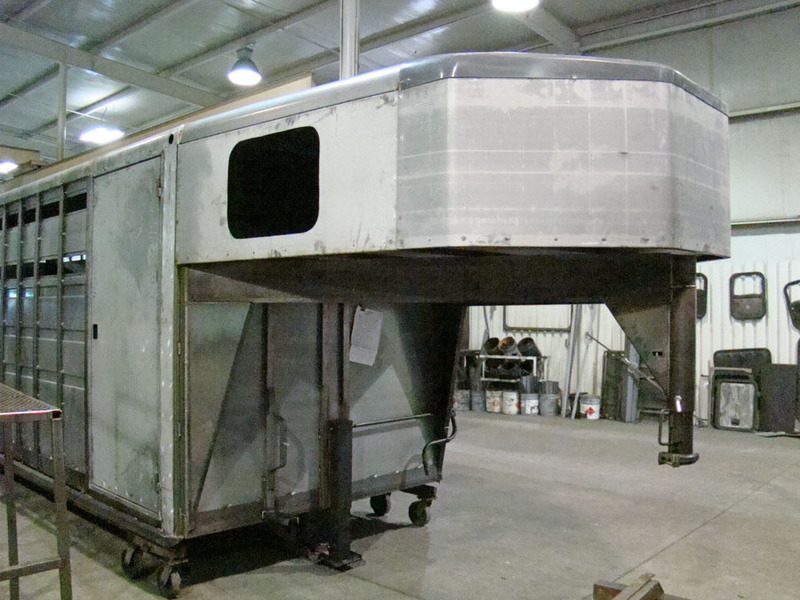 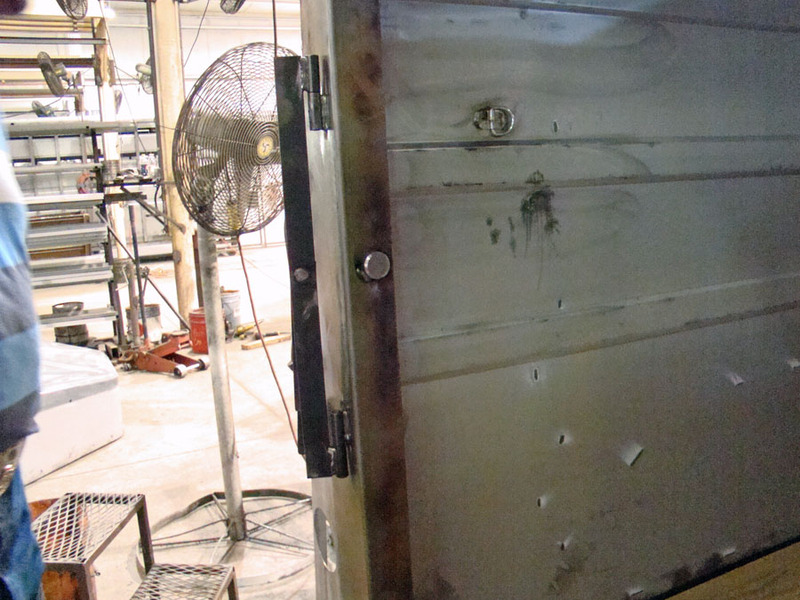 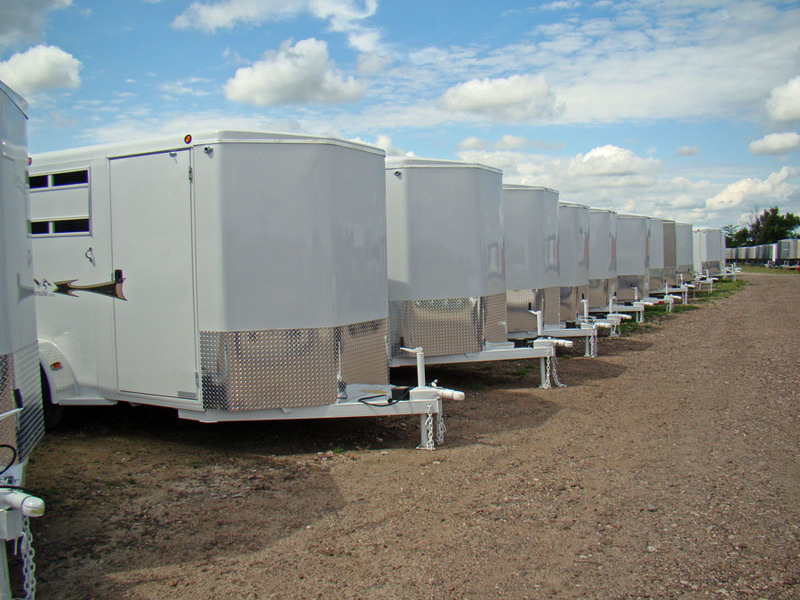 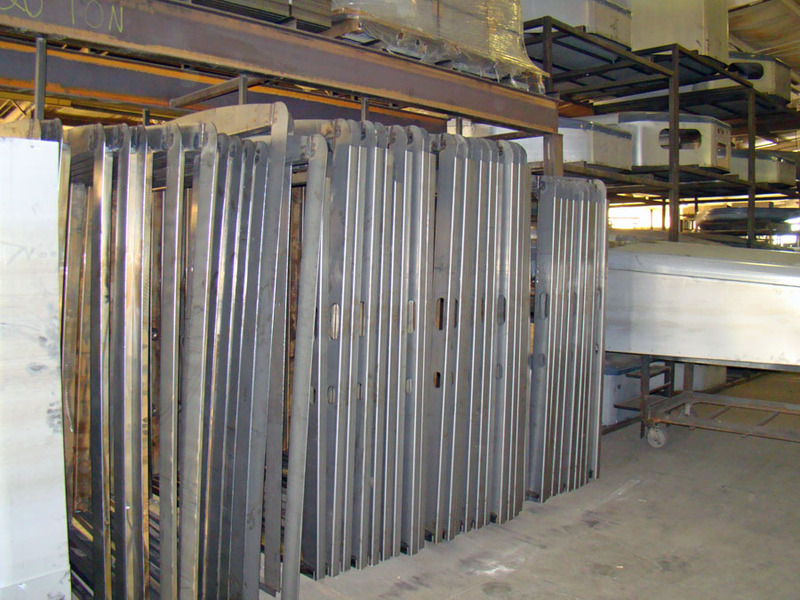 In the state of the art prep and paint booths in Waterville Kansas, steel trailers are chipped, ground and washed before sealing and painting. 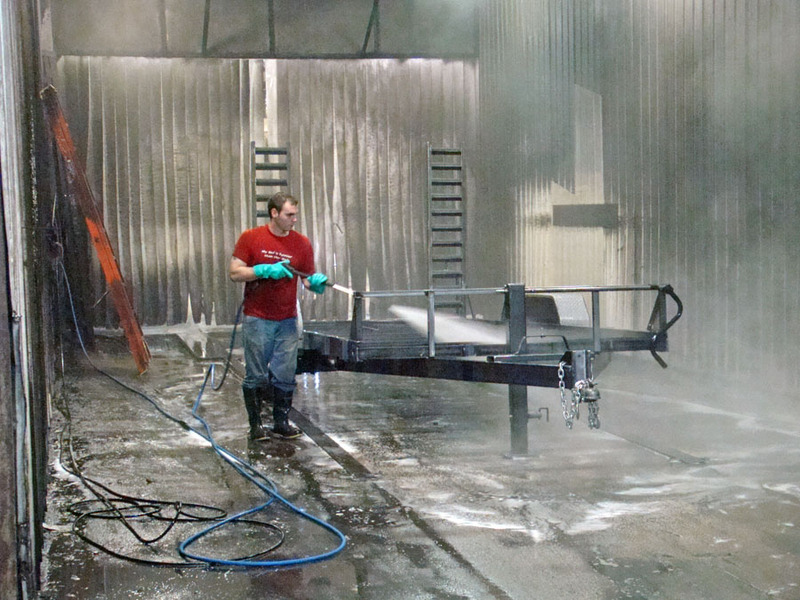 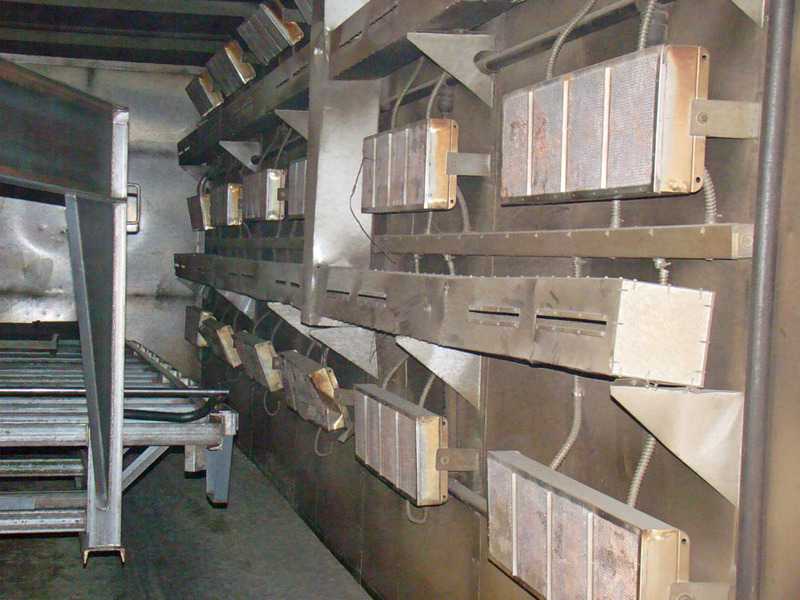 The prep oven runs at 250 degrees to boil out the water after they’re pressure washed, alkaline degreased and an iron phosphate pretreatment. 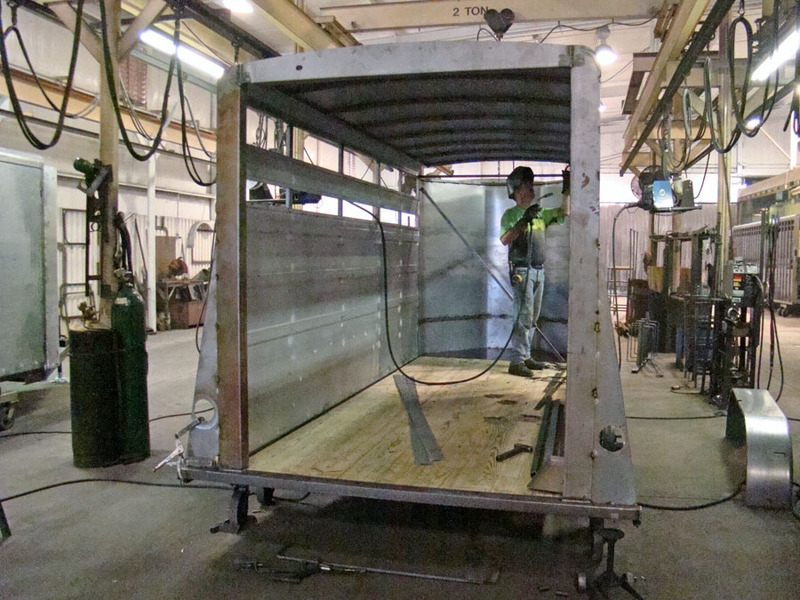 Then when there’s no water left, urethane caulking the seams by experts (picture left) prepare the trailers for painting. 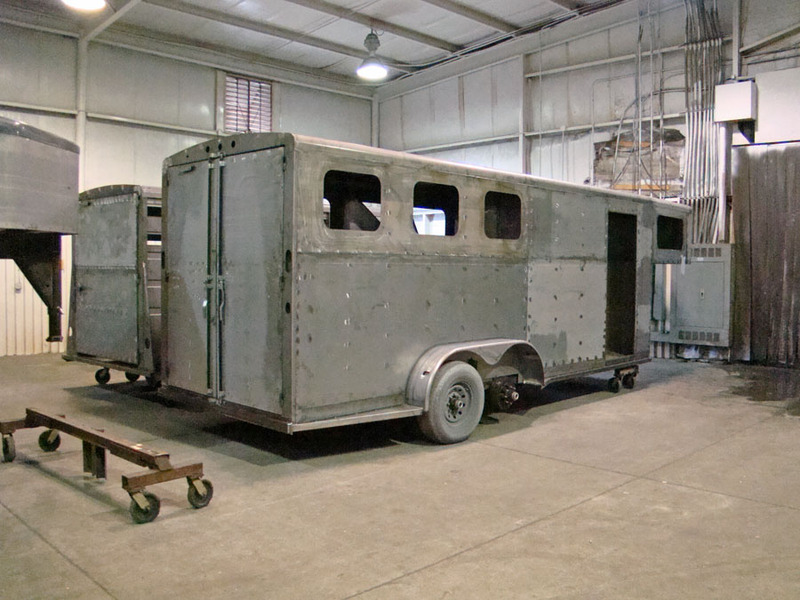 Trailers are moved into the primer booth, where they are primed with an 2 part epoxy primer. 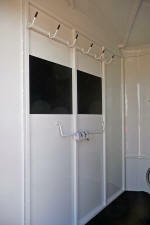 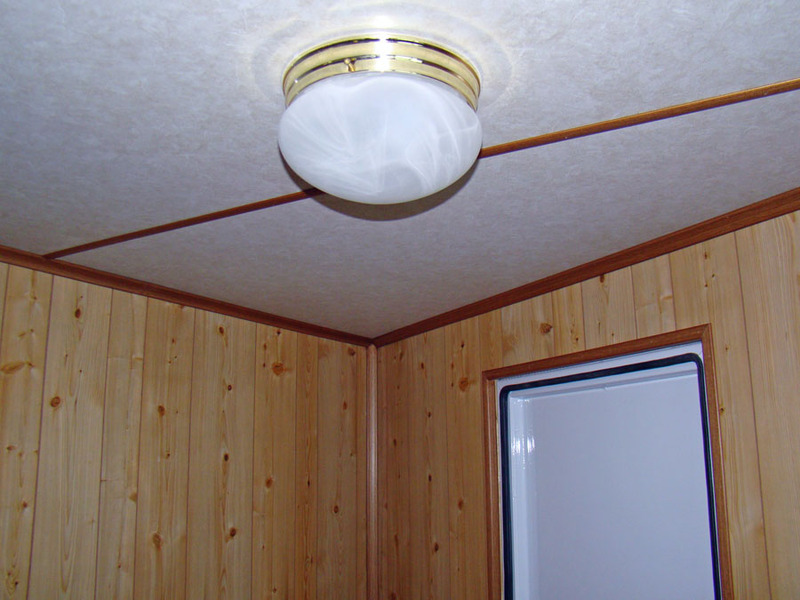 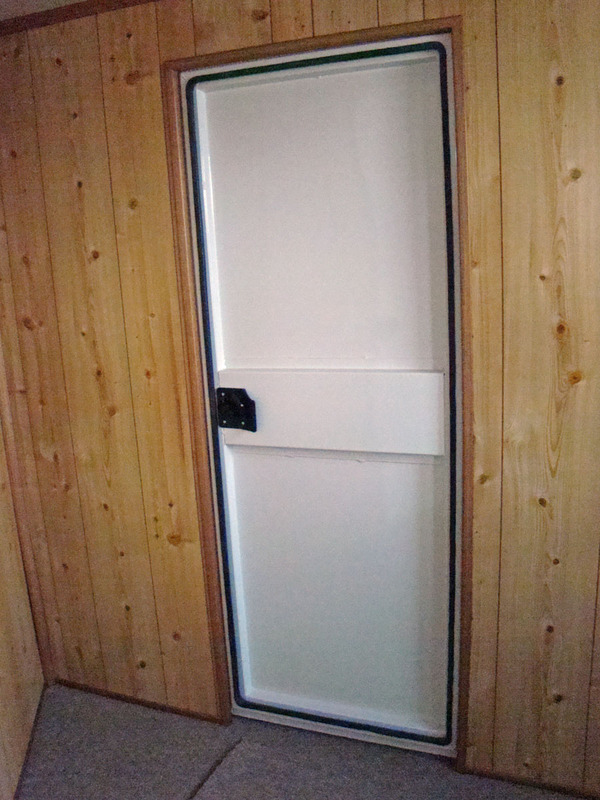 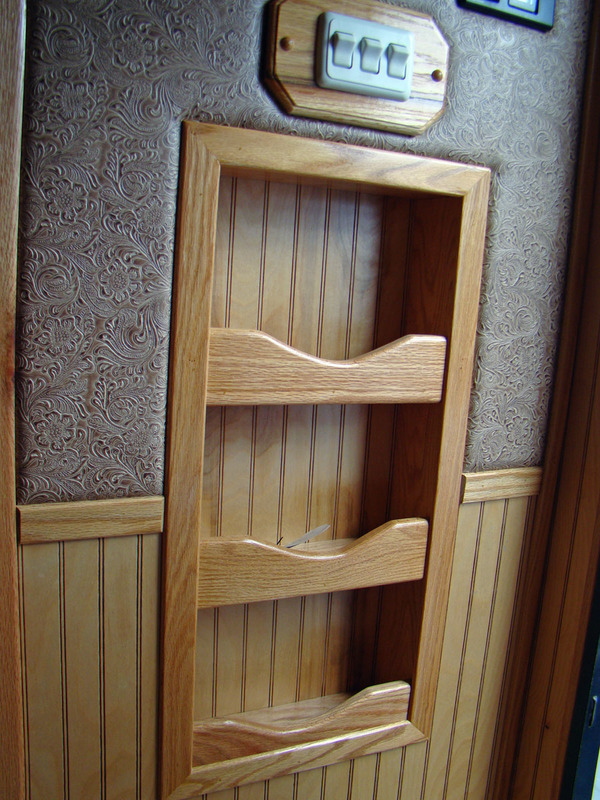 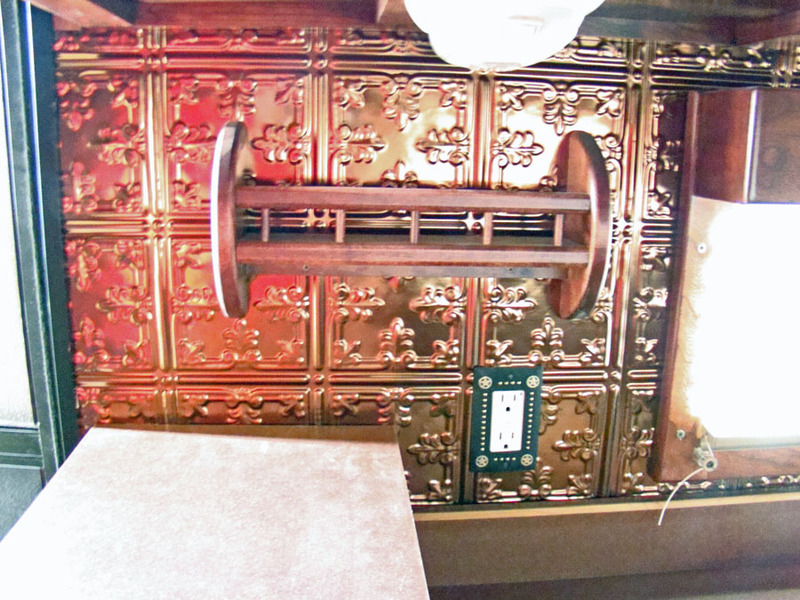 Units are allowed to flash, then moved into the topcoat booth. 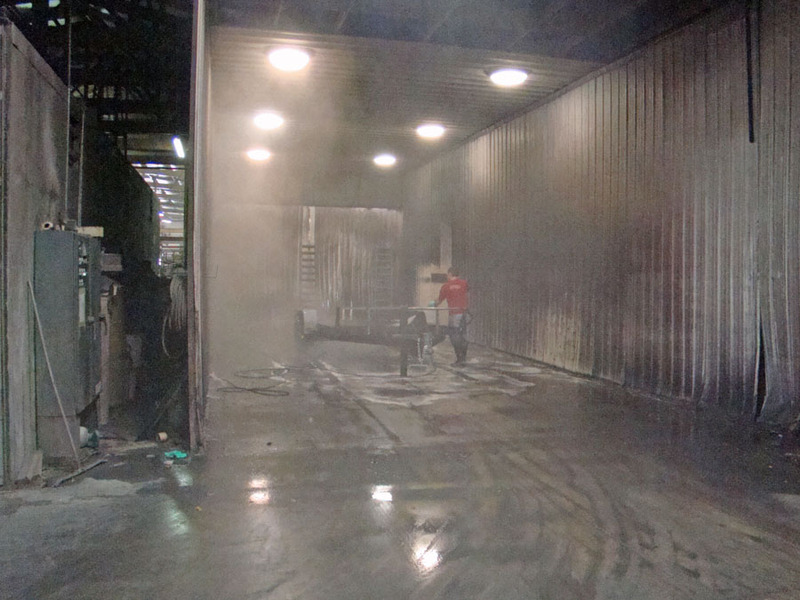 Units are sprayed with 2 part polyurethane topcoat, flashed and then forced dried for 30 minutes to maximize durability and gloss. 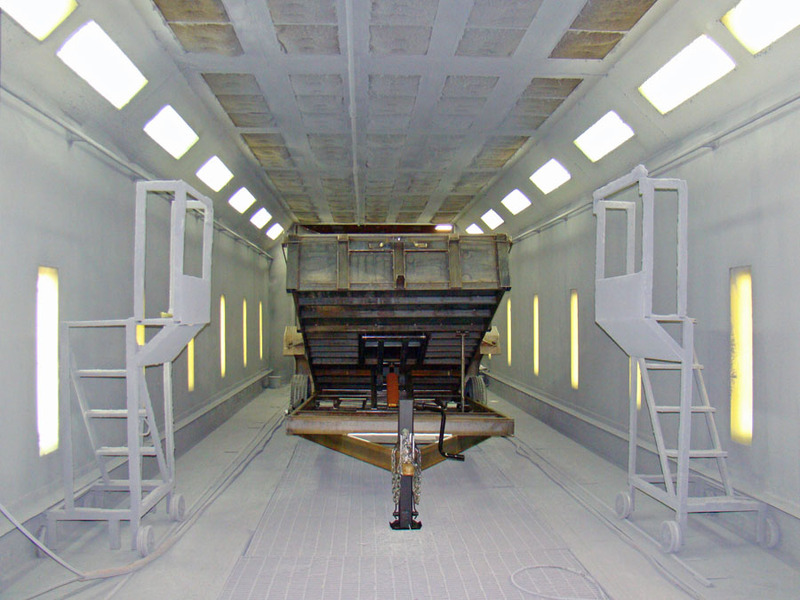 The DuPont paint process is premixed and applied with metering valve technology for an even consistent long lasting paint job. The drying booth finishes the process with bright vibrant colors, more choices of colors and graphics than you are use to seeing with trailers. 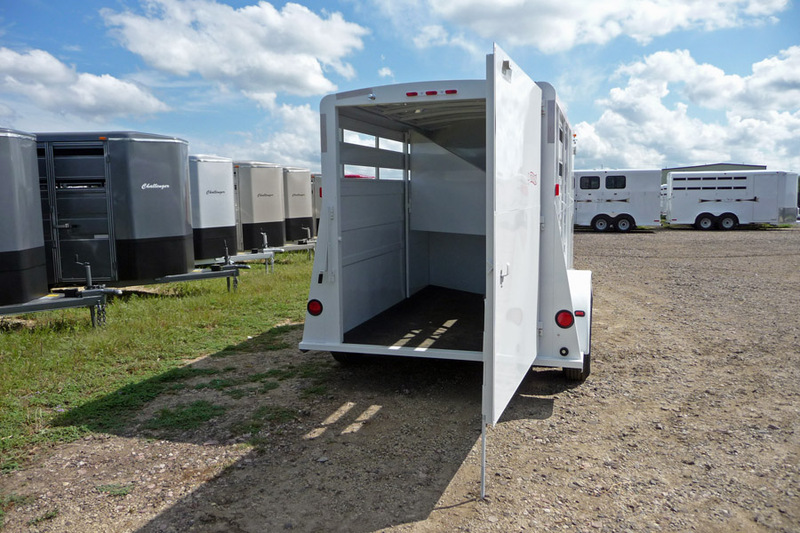 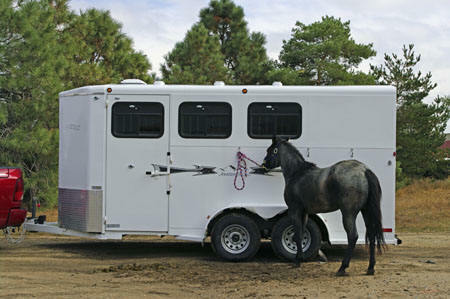 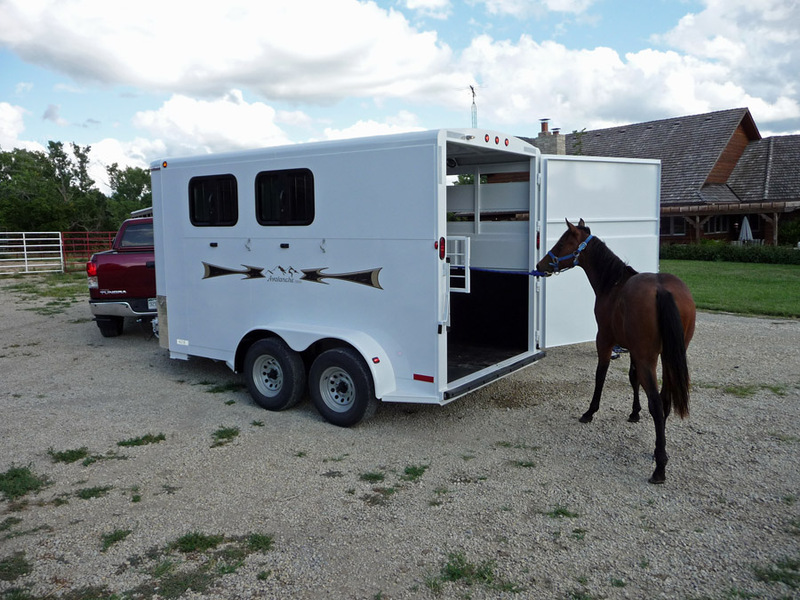 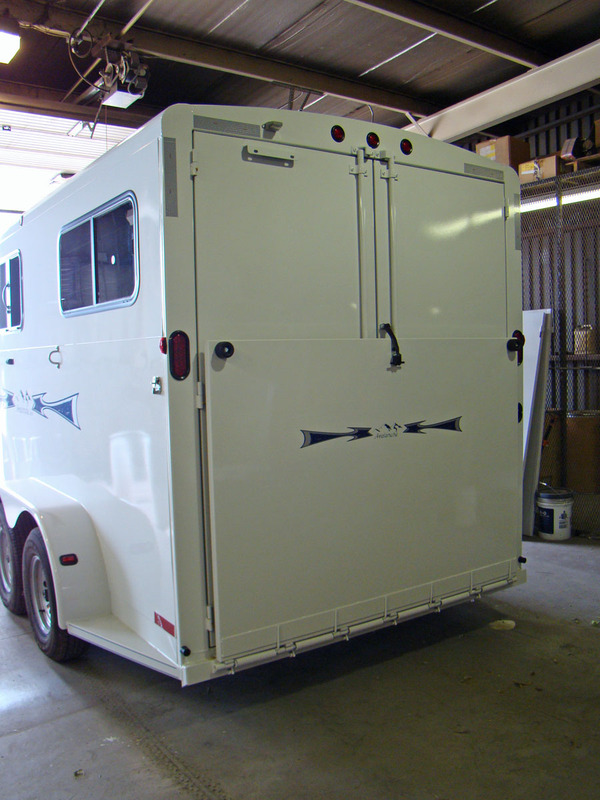 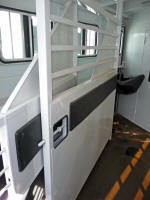 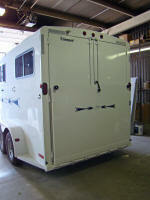 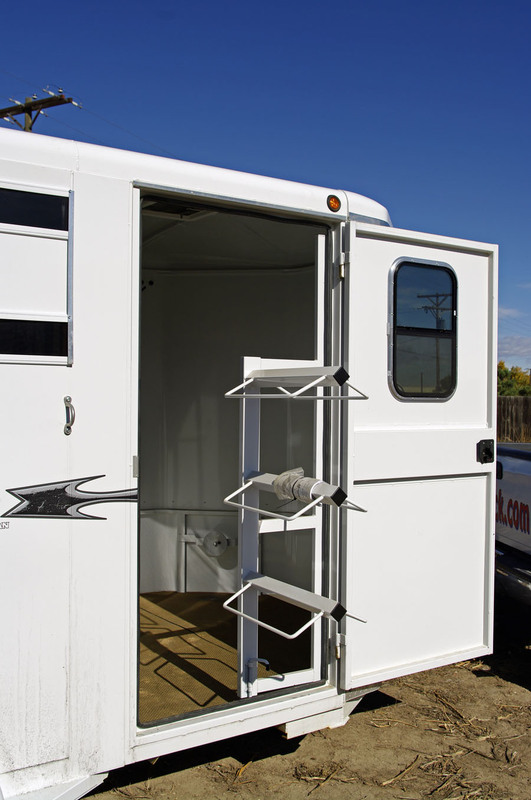 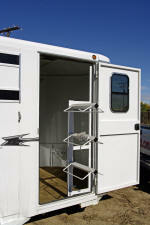 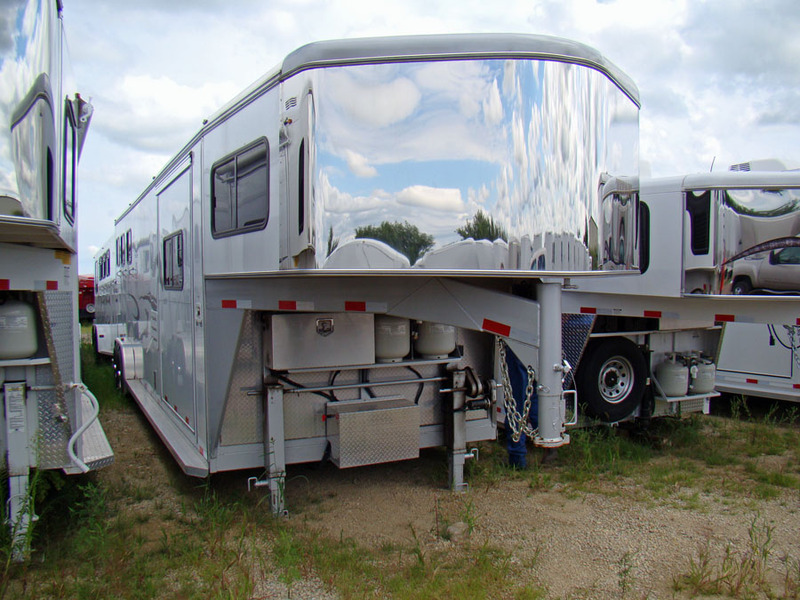 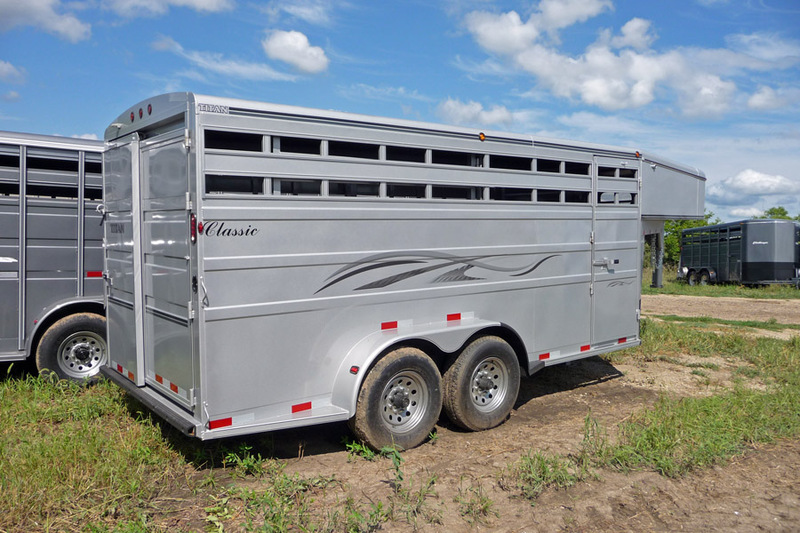 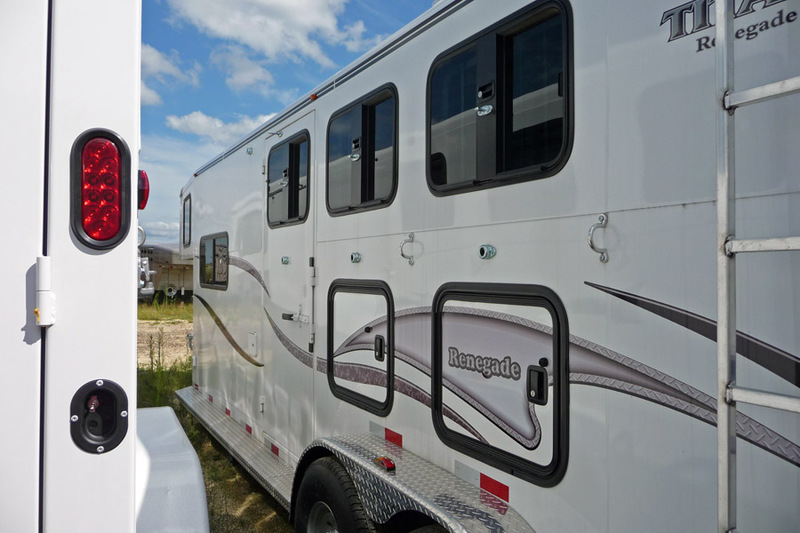 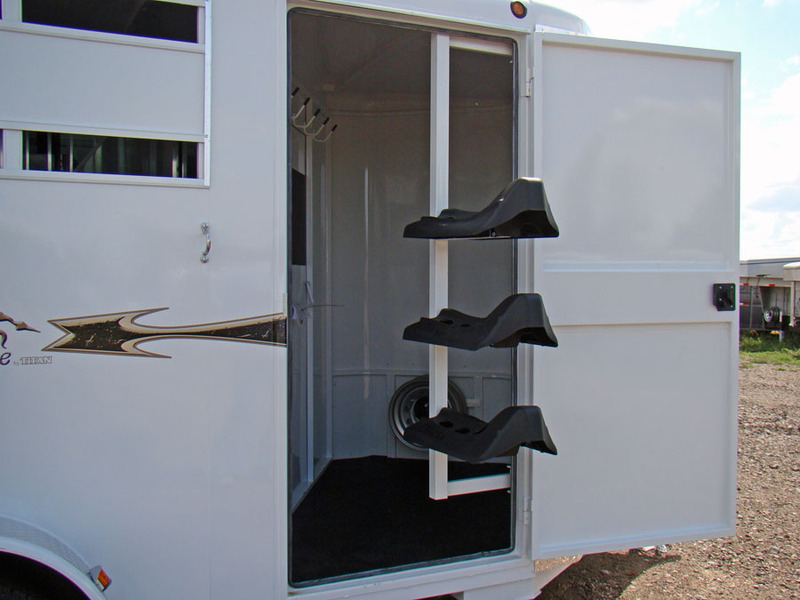 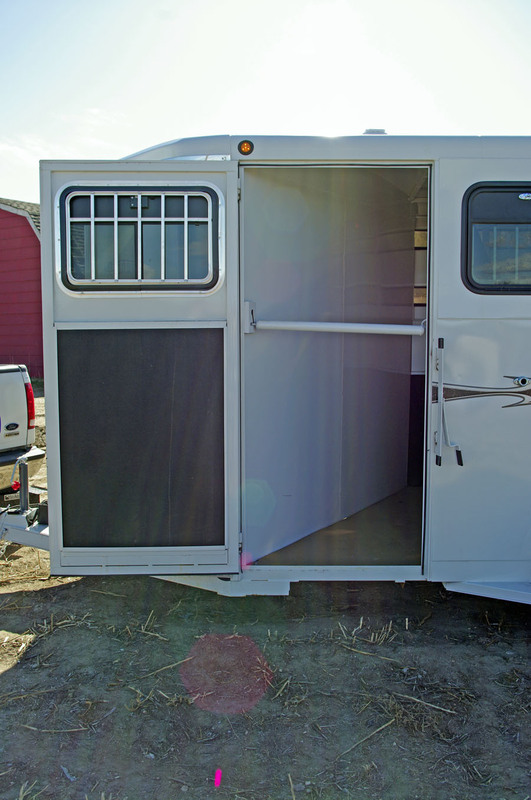 Avalanche, the best selling Titan horse trailer. 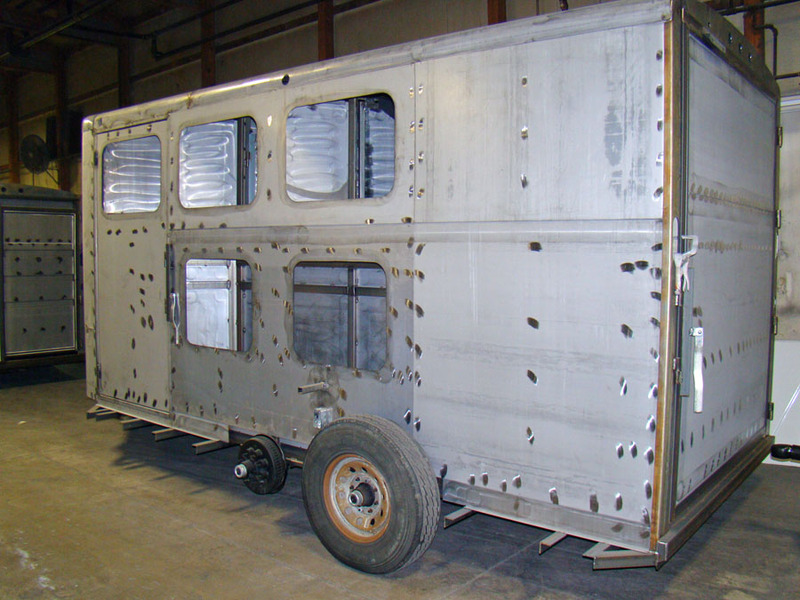 I see these at horse expo’s selling like hot cakes. 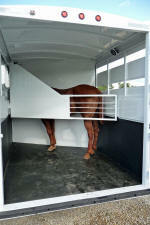 Stalls are simple, horses fit well. 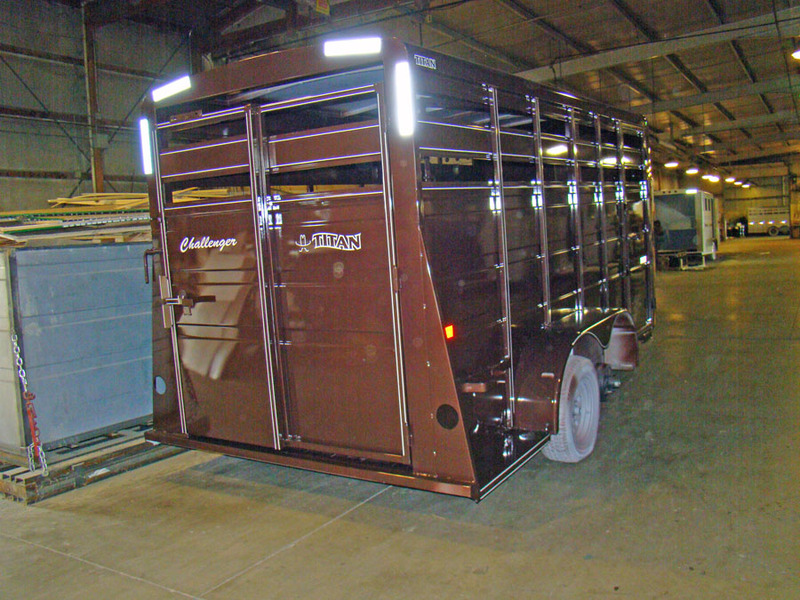 LED lights everywhere, unique nose angles, torsion axles and of course the bright paint. 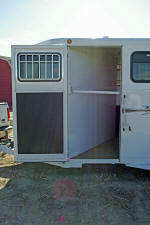 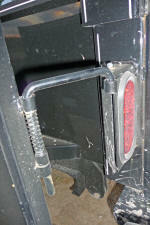 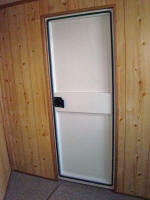 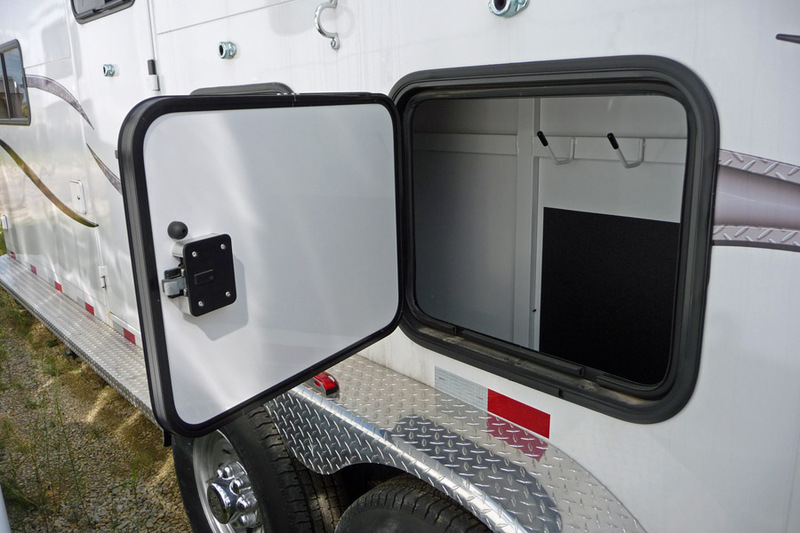 Picture below, drop down feed doors are easy to reach. Stainless nose or tapered aluminum has the look. 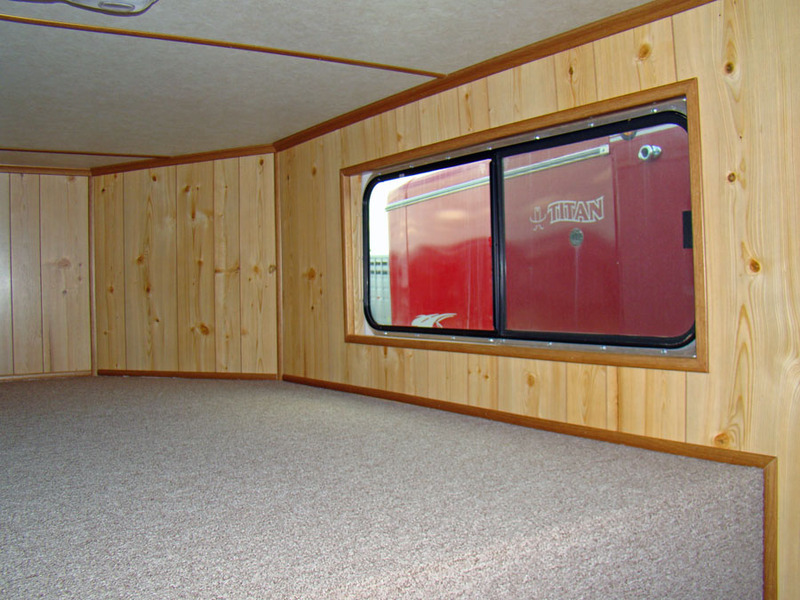 Eight ft. slider give you options for where you need the room. 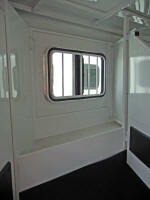 Living Quarters, all the way or just a basic package. 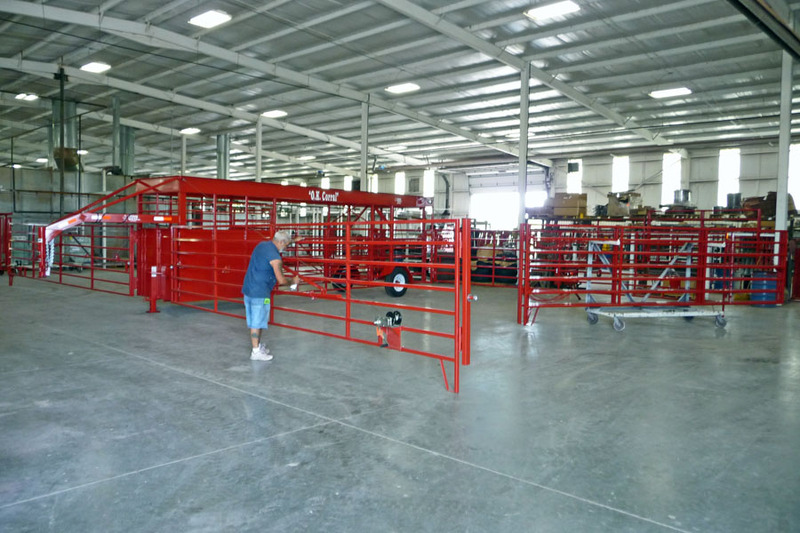 There are some things that are hard for average folks to do like electrical or wall framing, lights and AC that can be done in a factory cheaper than you banging away every weekend. This the part that needs done right to avoid water leaks. 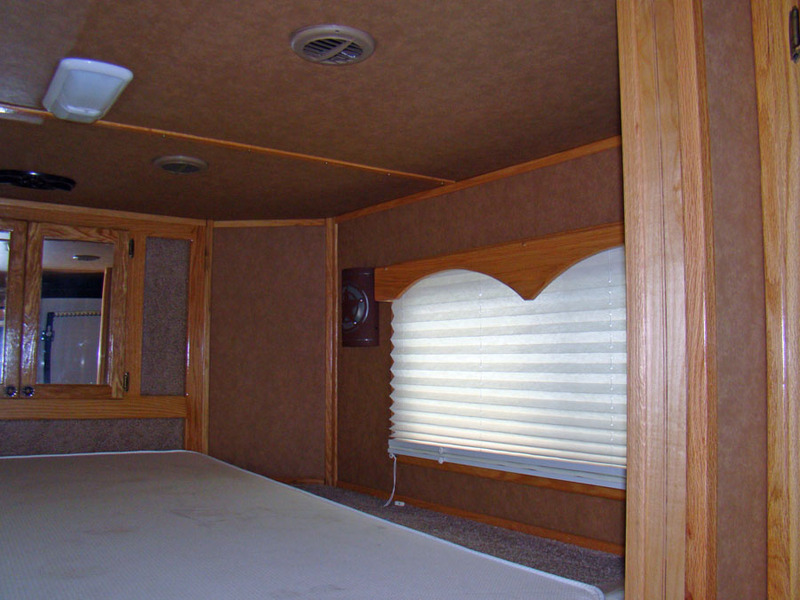 The Panel Package gets you started or makes a nice weekender to get away with the family. 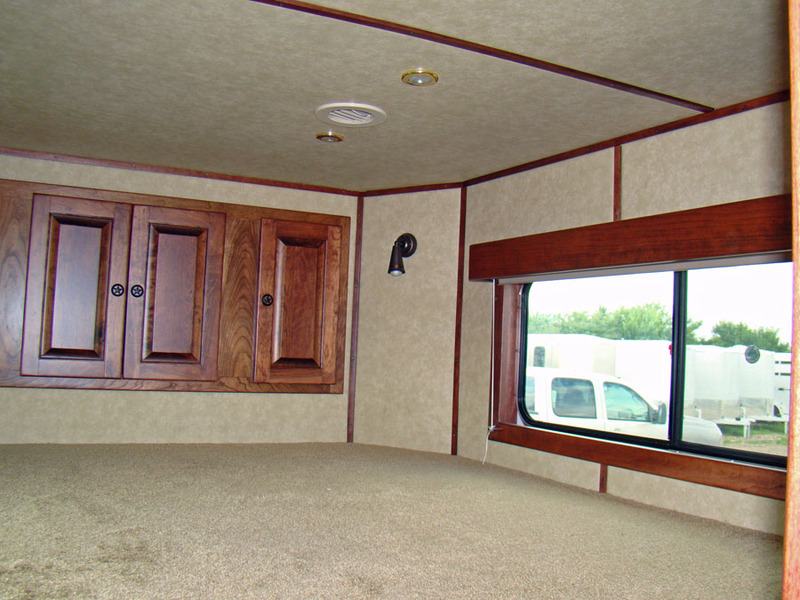 Makes a clean dressing room or relax station during events. 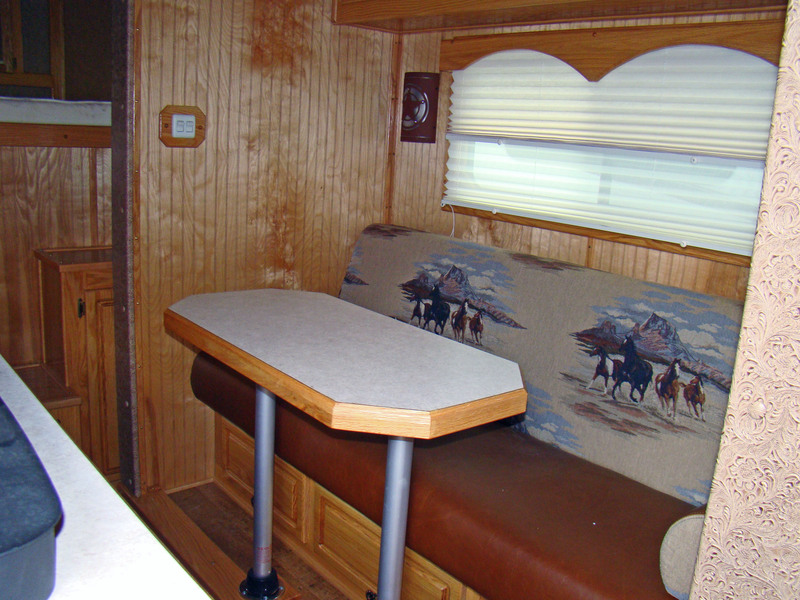 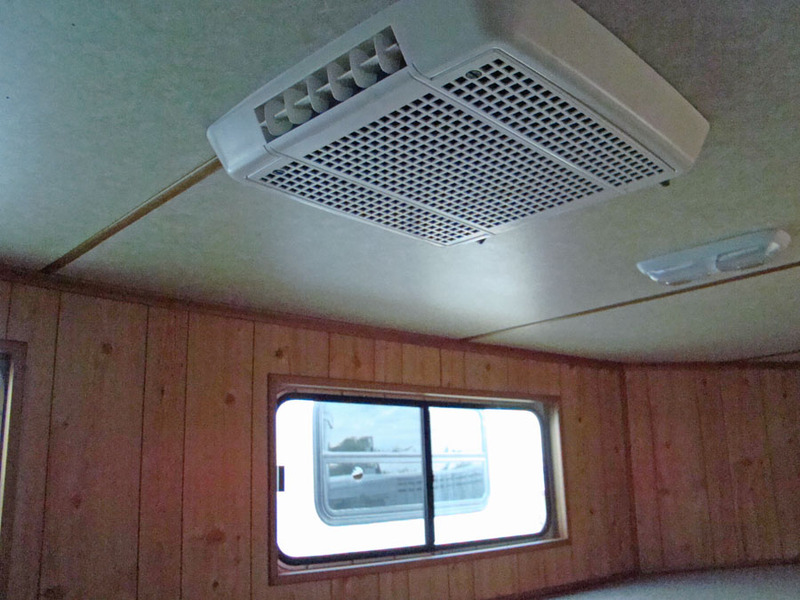 Keeps you out of bad weather and a place to play cards and check email. 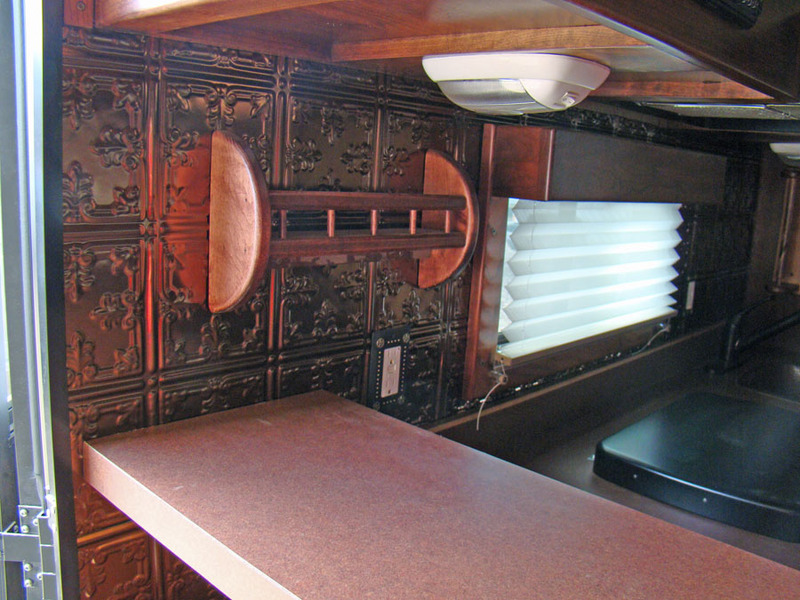 Or if you need something more elaborate, Titan can do custom Living Quarters. 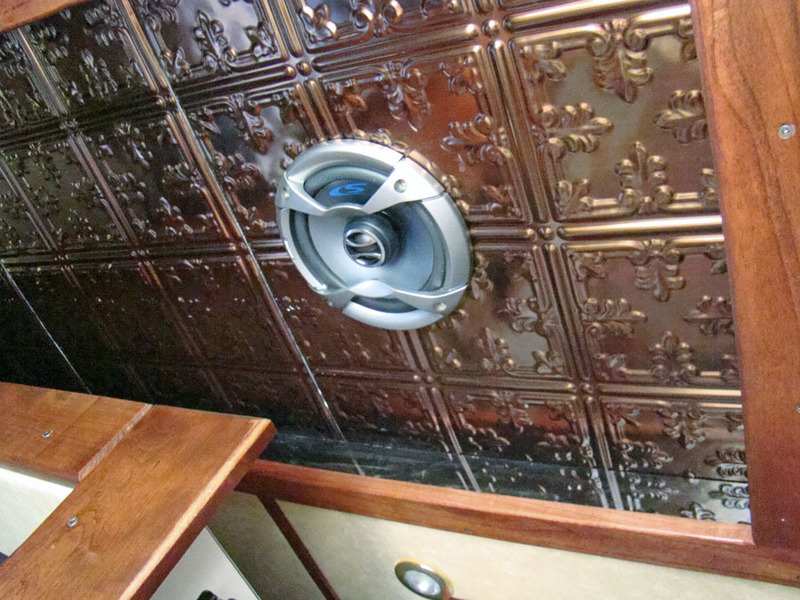 I love the antique tile below, reminds me of a bar in western movies. 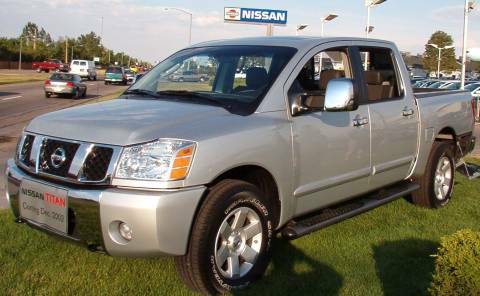 Everyone could use one of these, besides the big dump trailers Titan builds that keep contractors in business, this SUV model makes your fixer up project a breeze. 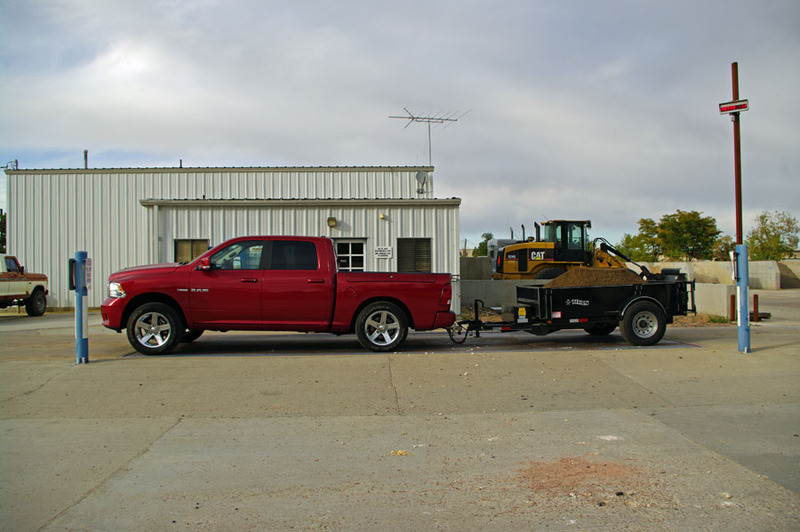 I hauled 3 ton of road base shown in the left picture, hauled 8′ big square bales, 6′ big round bales, skid loaders. 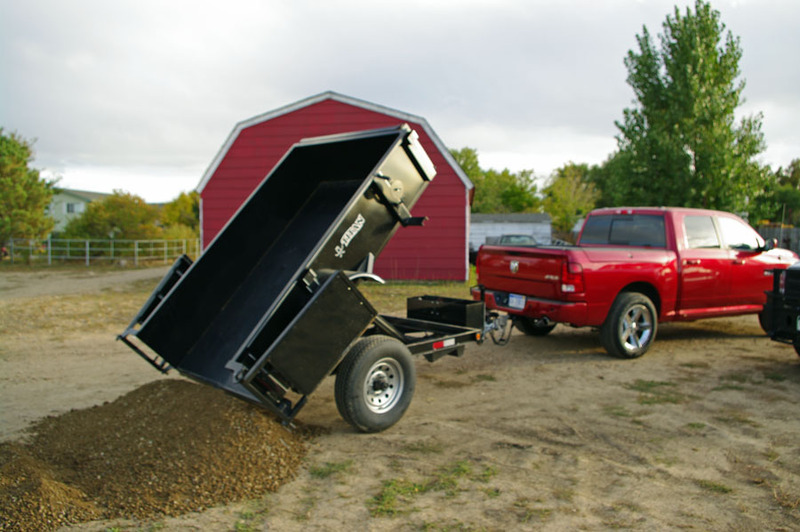 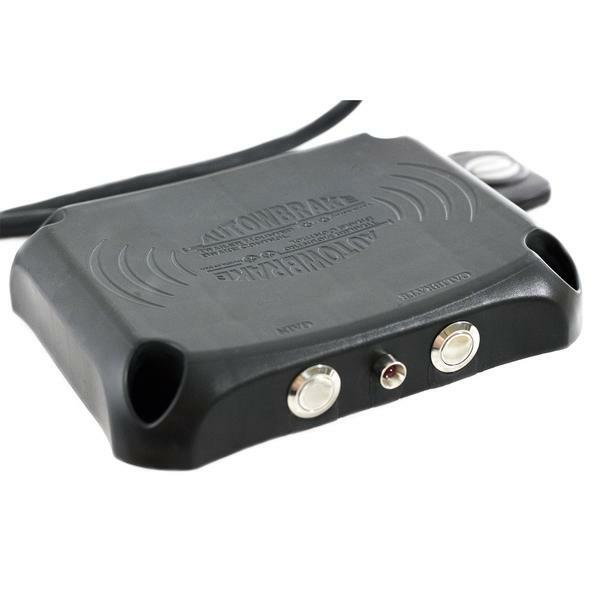 lawn tractors and ATV’s.Hydraulic dumping of just about anything you need, replaces your pickup or at least keeps your truck from getting all dinged up. 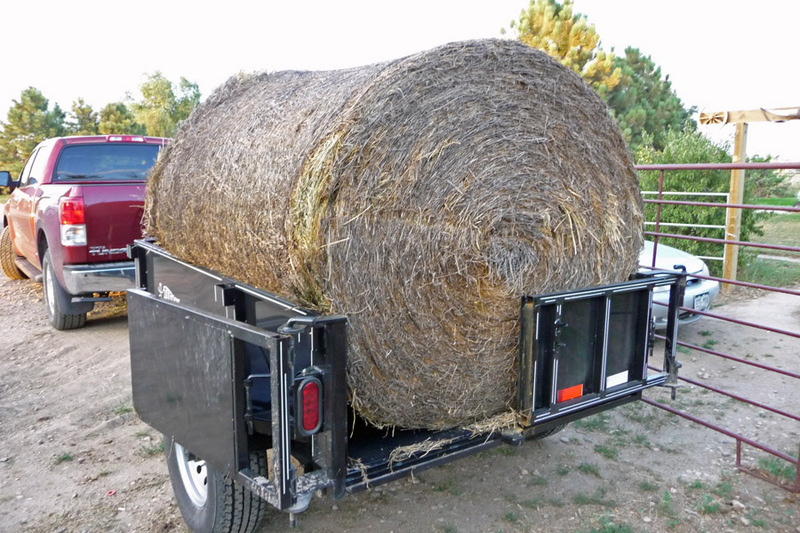 My truck tailgates get a big smile in them from the round bales that don’t come out as easy as I thought they would. 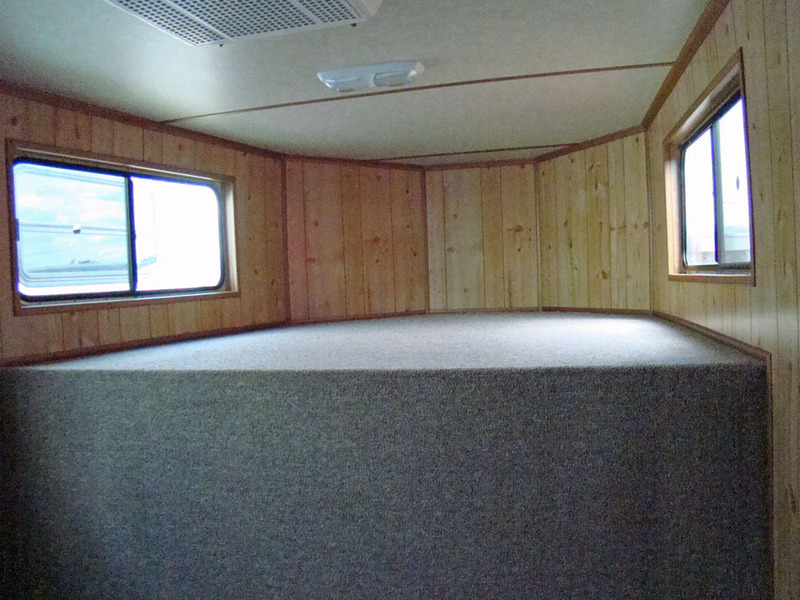 5′ by 8′ box, it’s bigger than a truck bed and built like a tank. 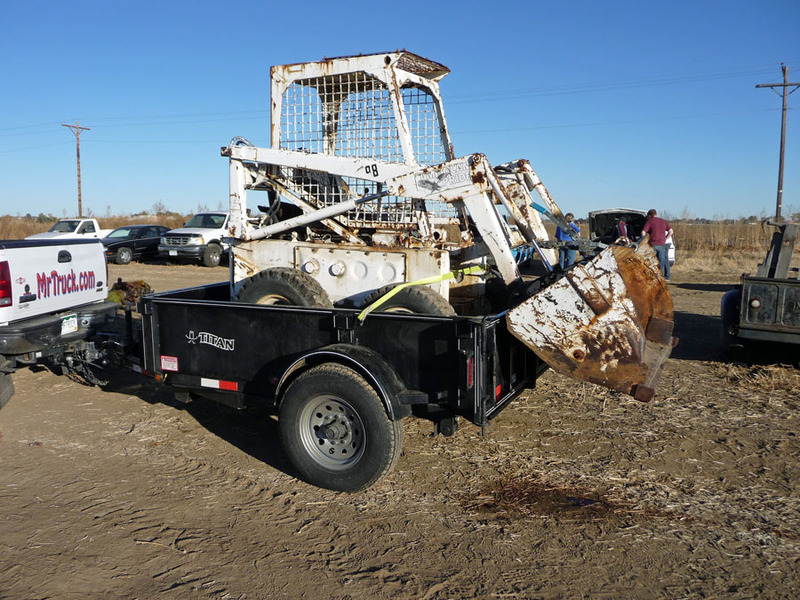 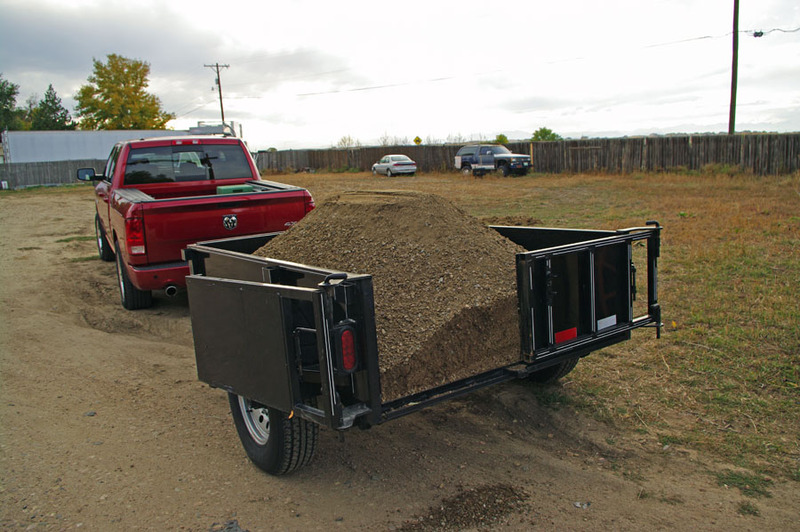 Truck beds aren’t made for much work anymore and most are only 6.5′. 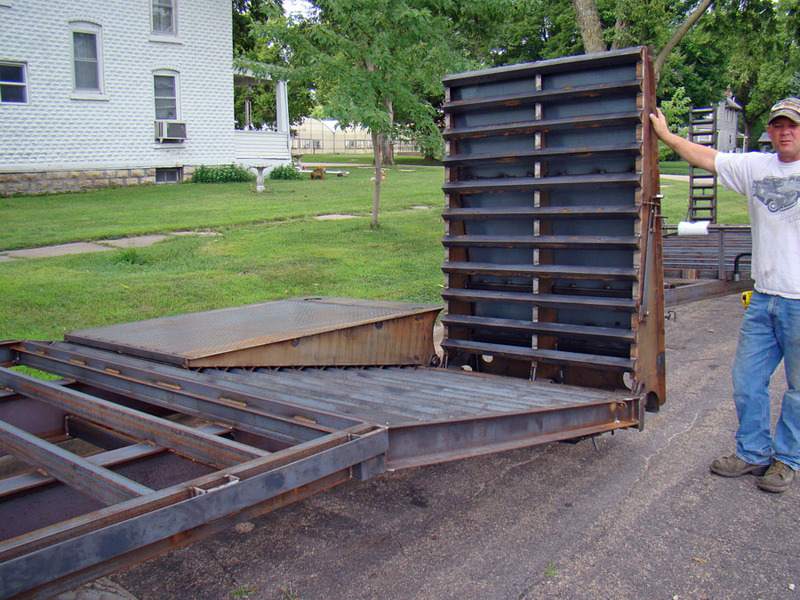 A smashed truck bed doesn’t do much for resale either. 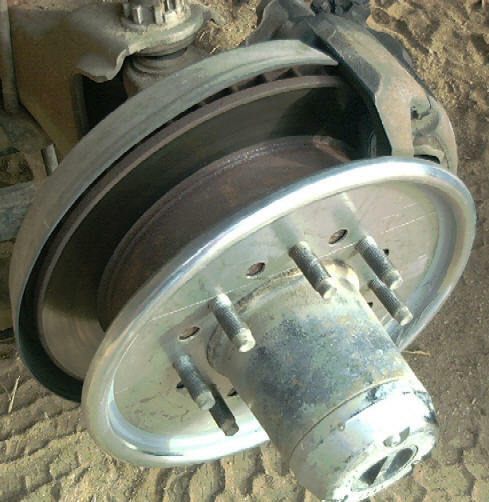 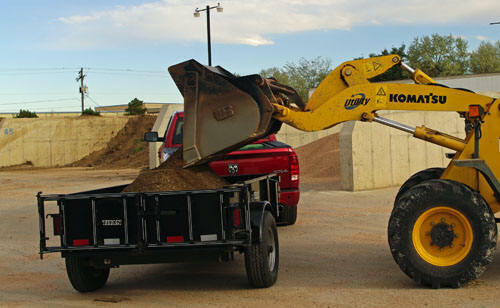 These dumper trailers cost what a good truck flatbed does and do so much more. 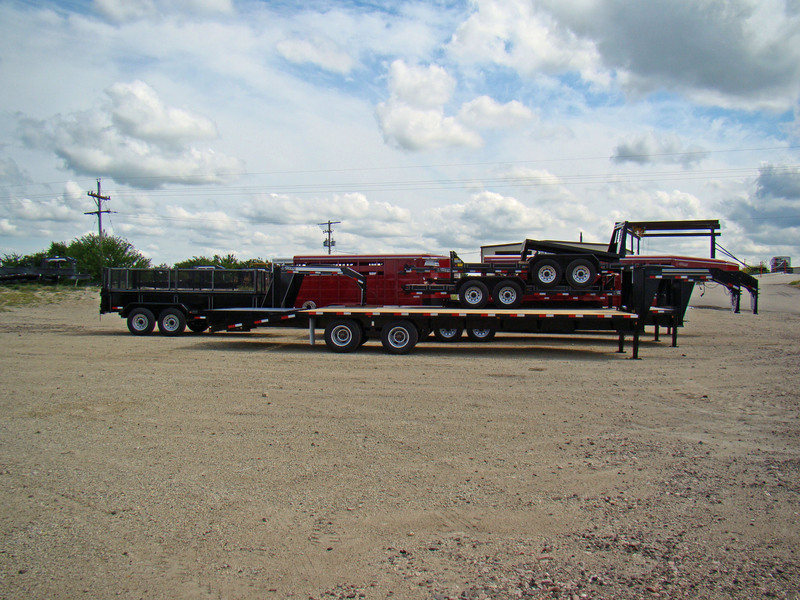 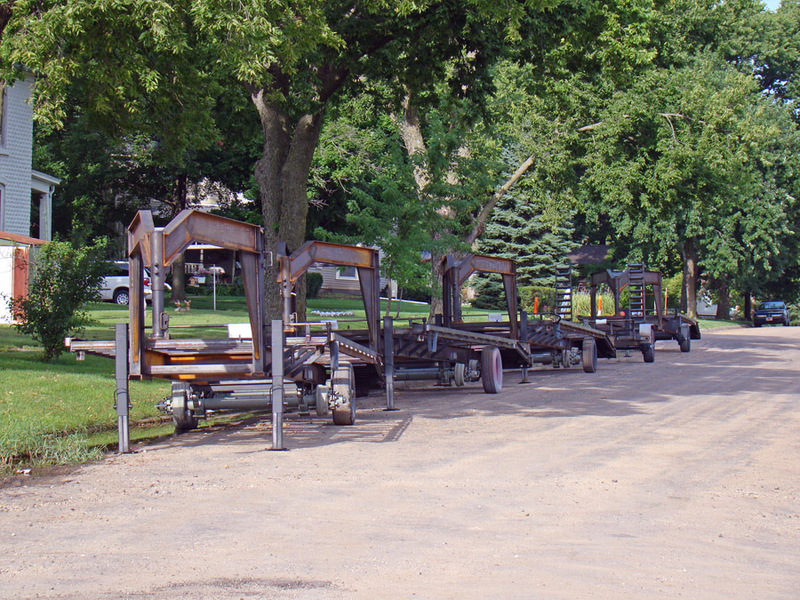 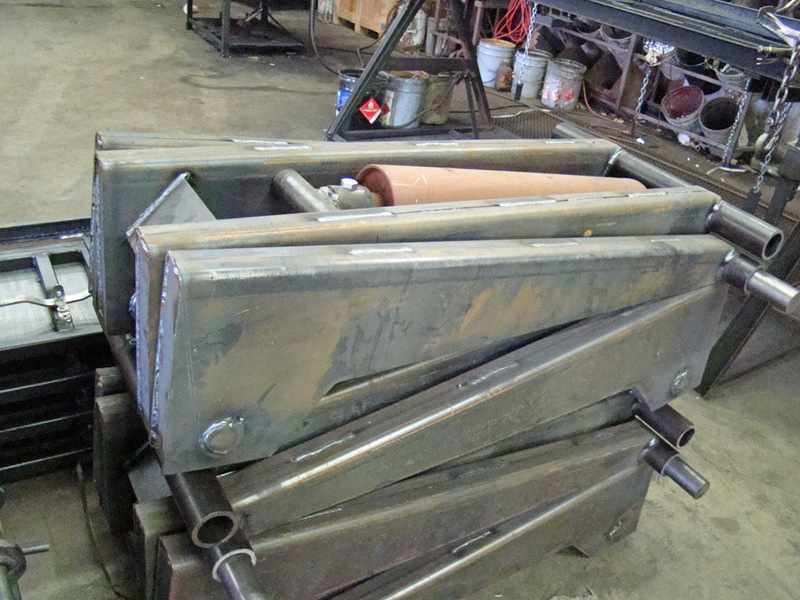 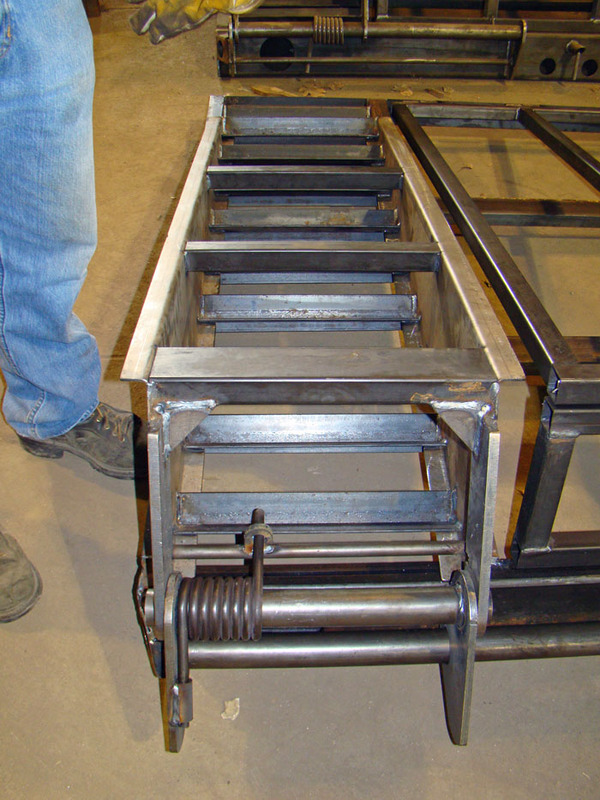 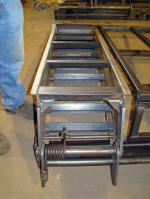 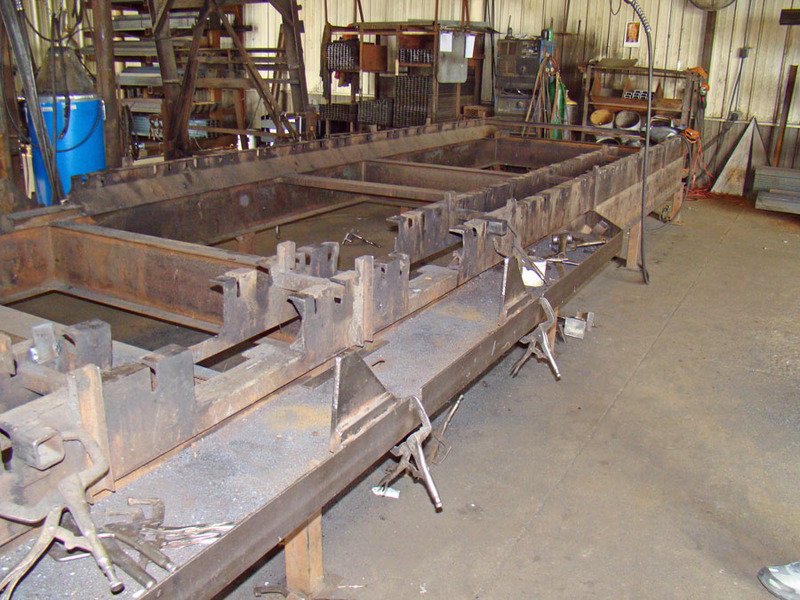 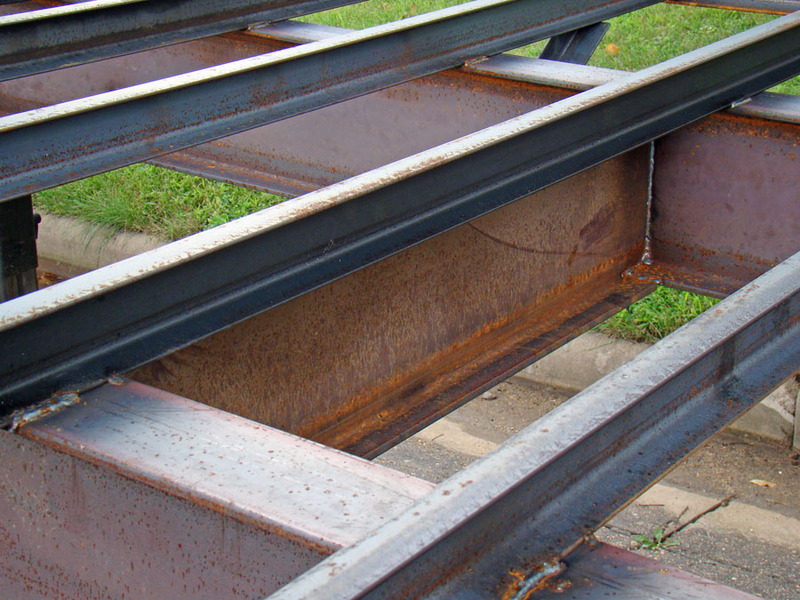 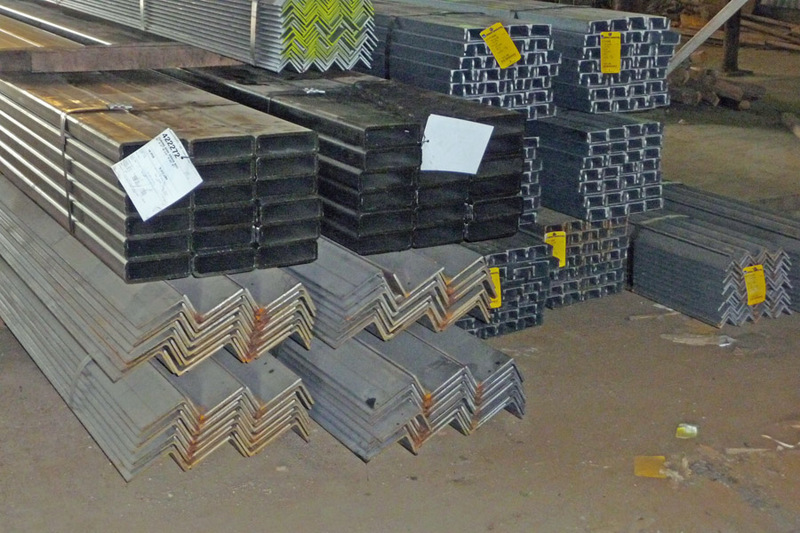 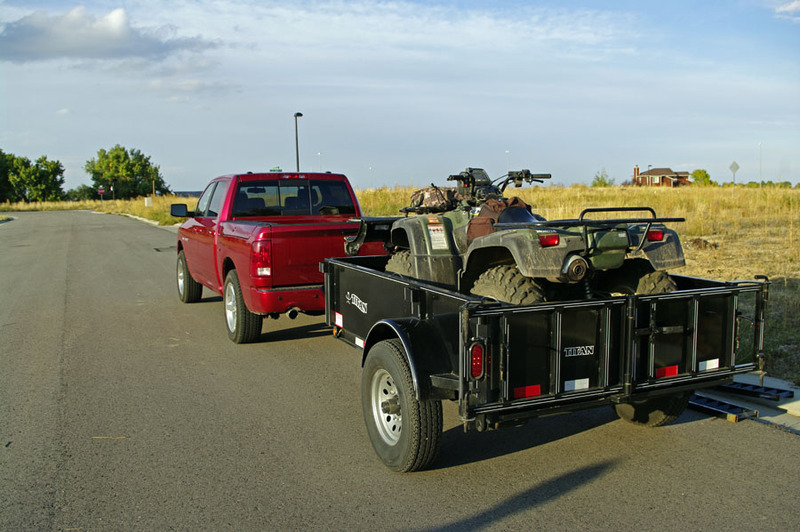 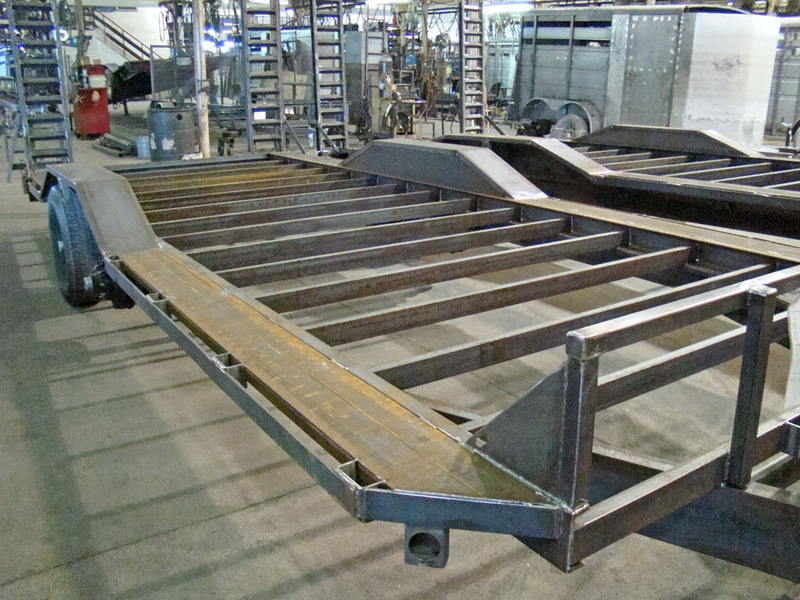 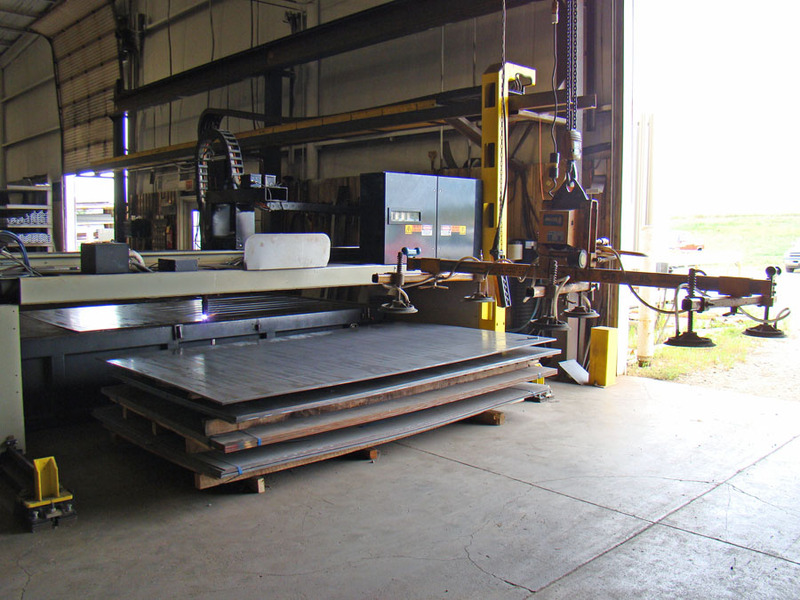 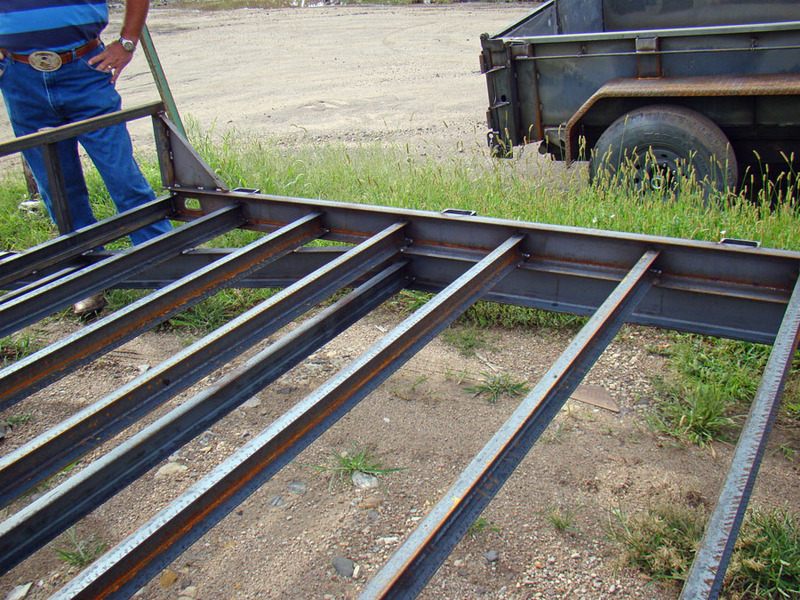 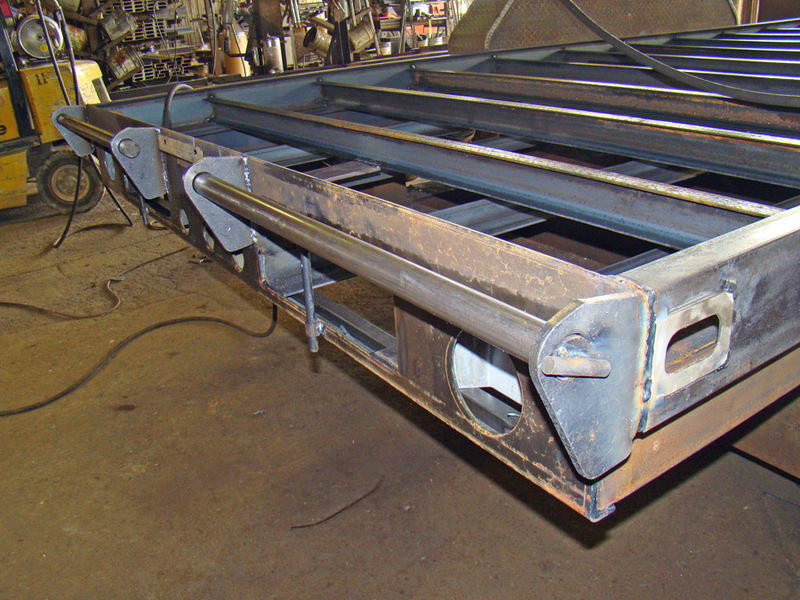 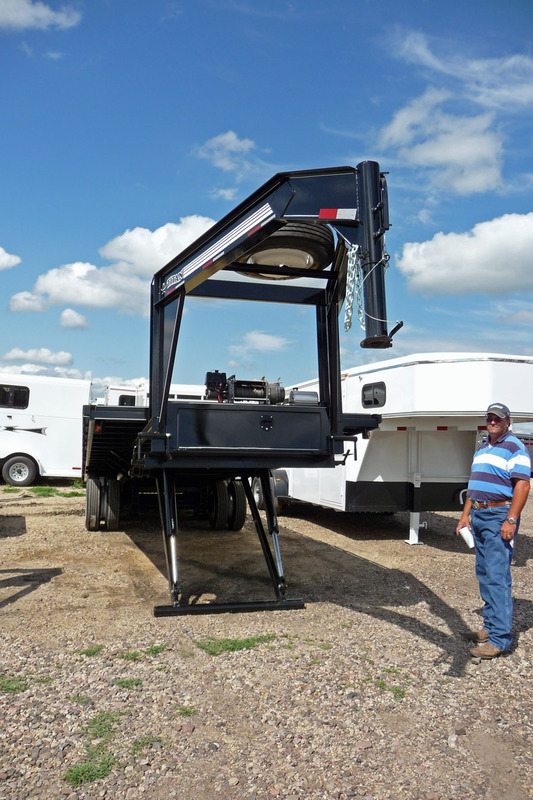 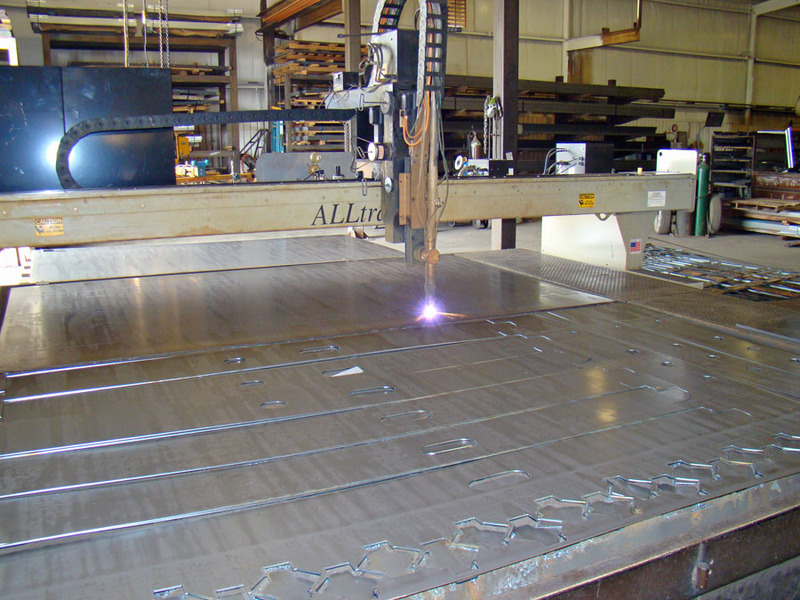 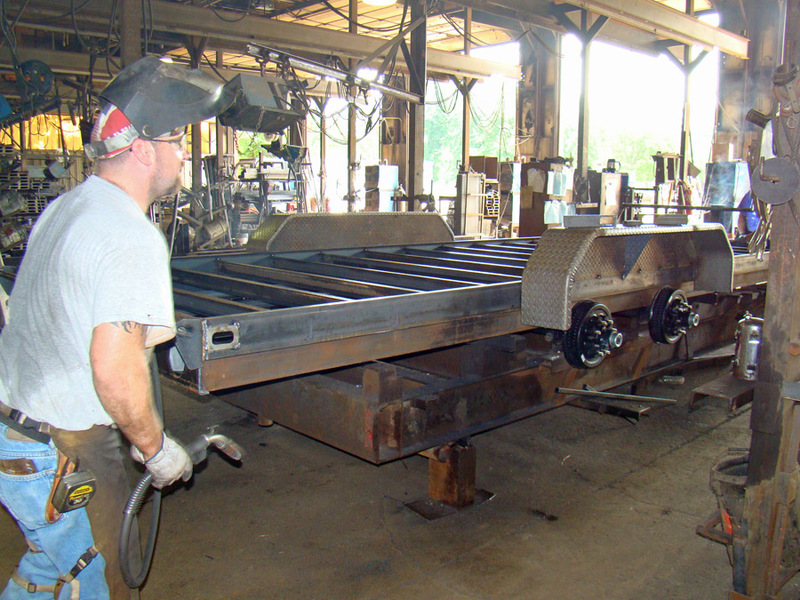 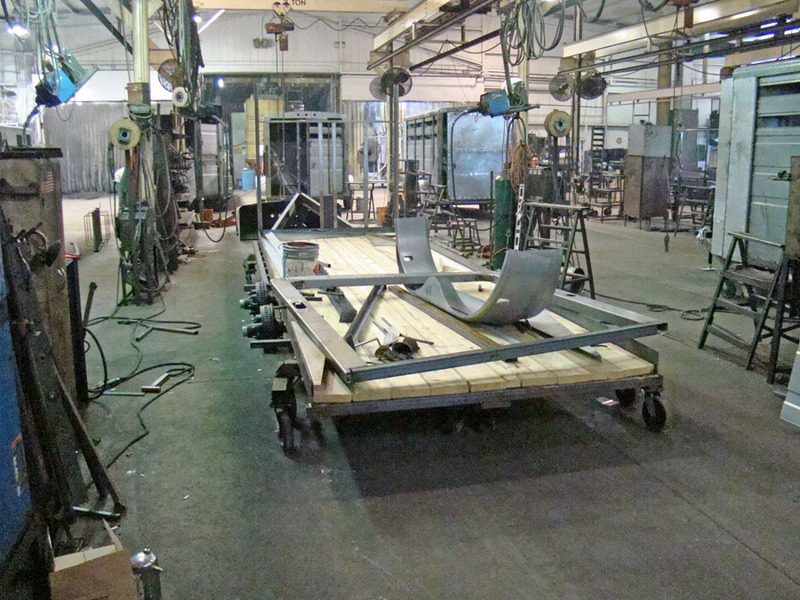 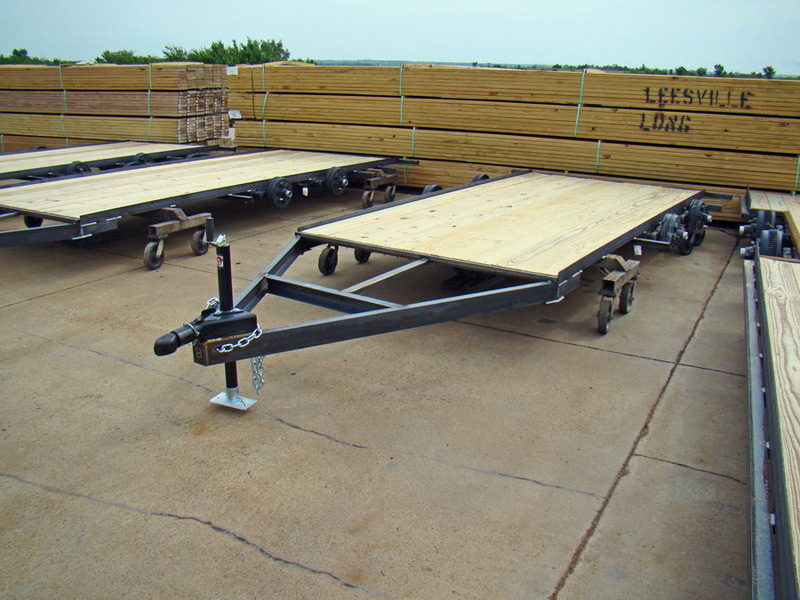 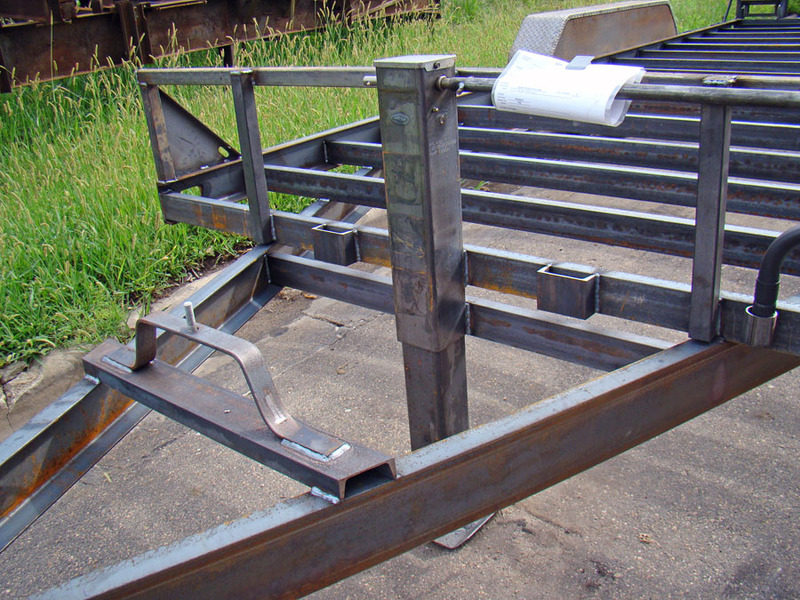 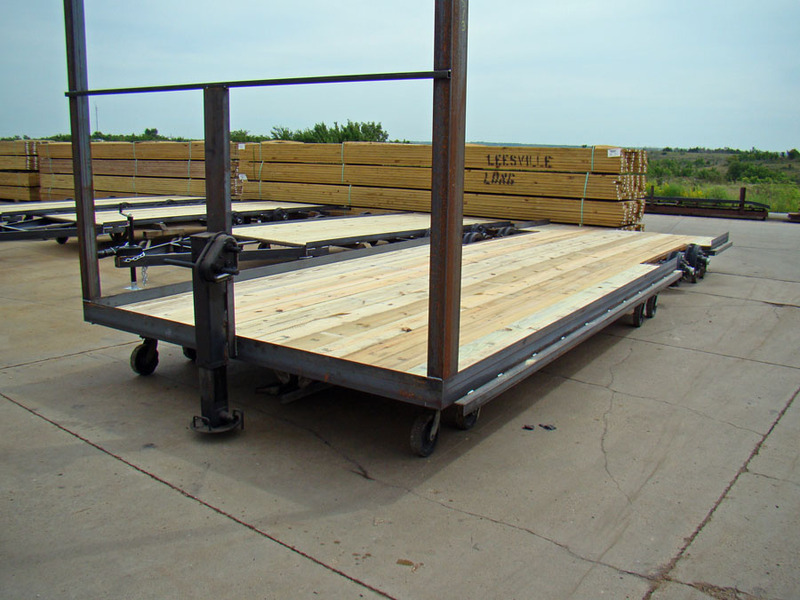 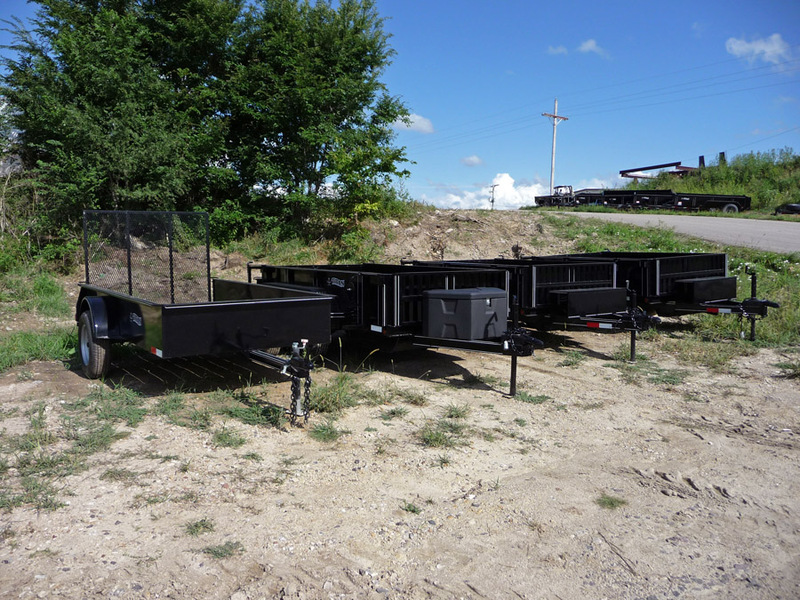 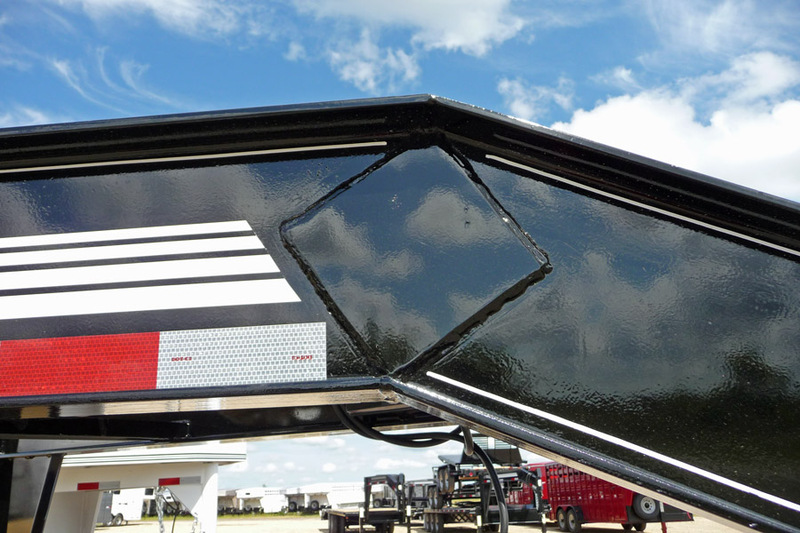 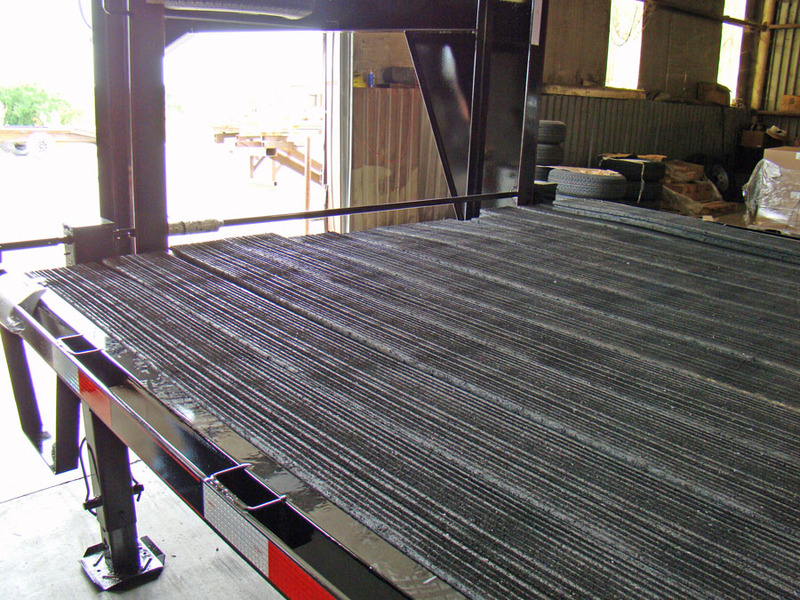 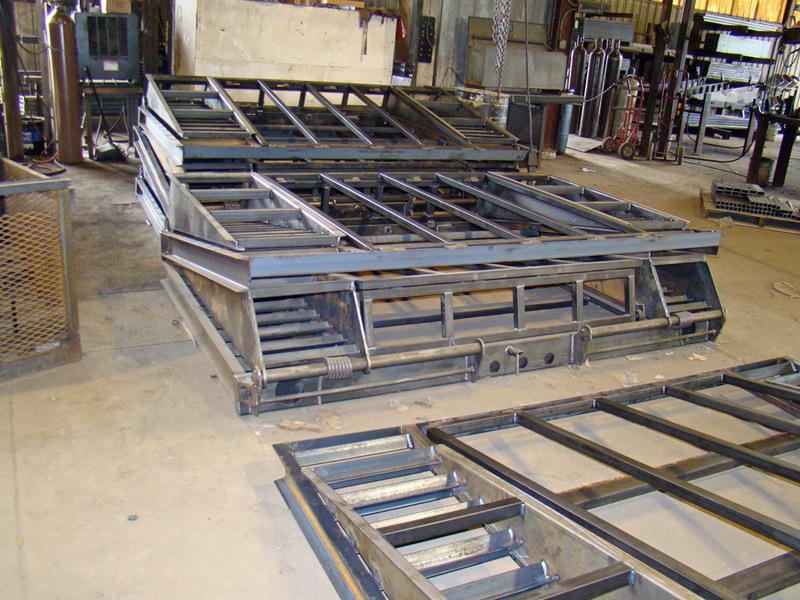 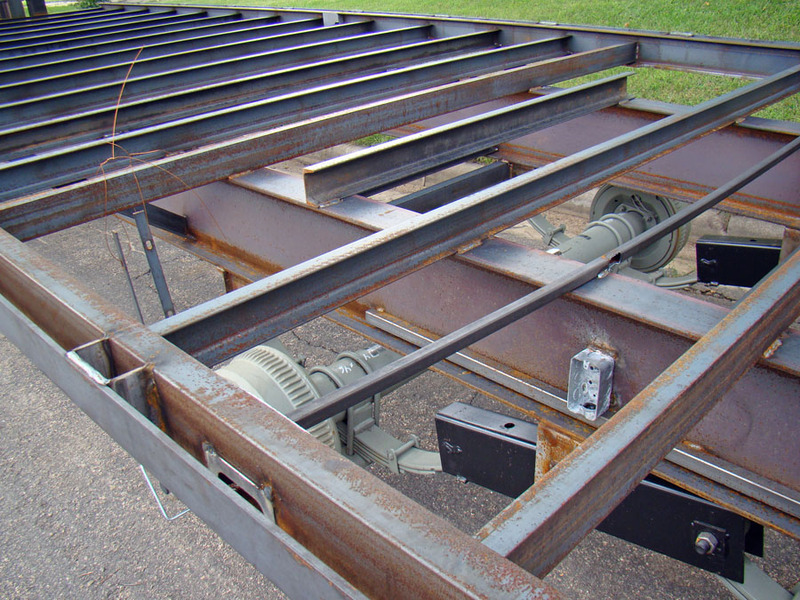 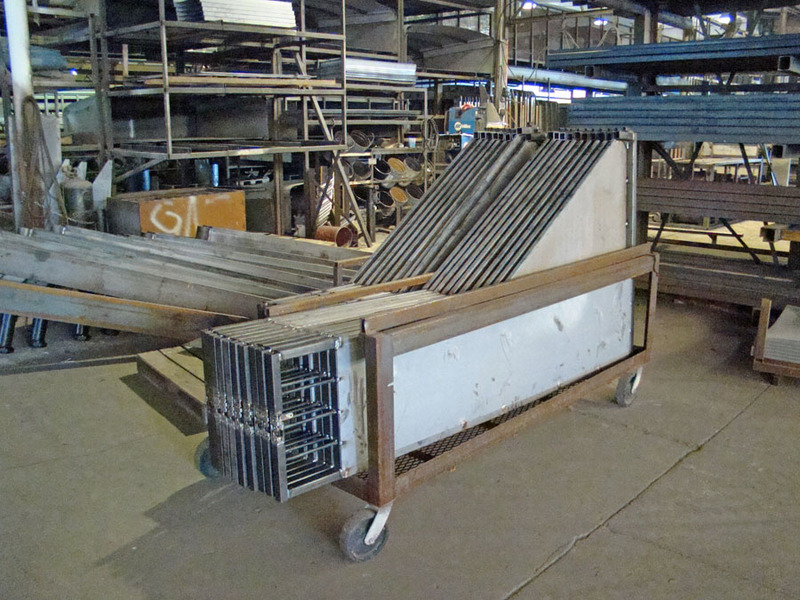 Gooseneck flatbeds have 10″ I-Beam frames and many choices for ramps. 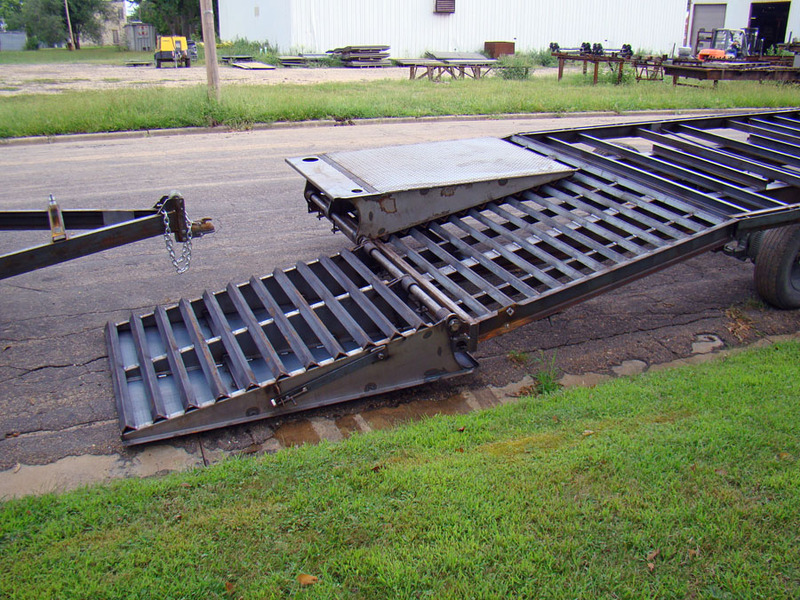 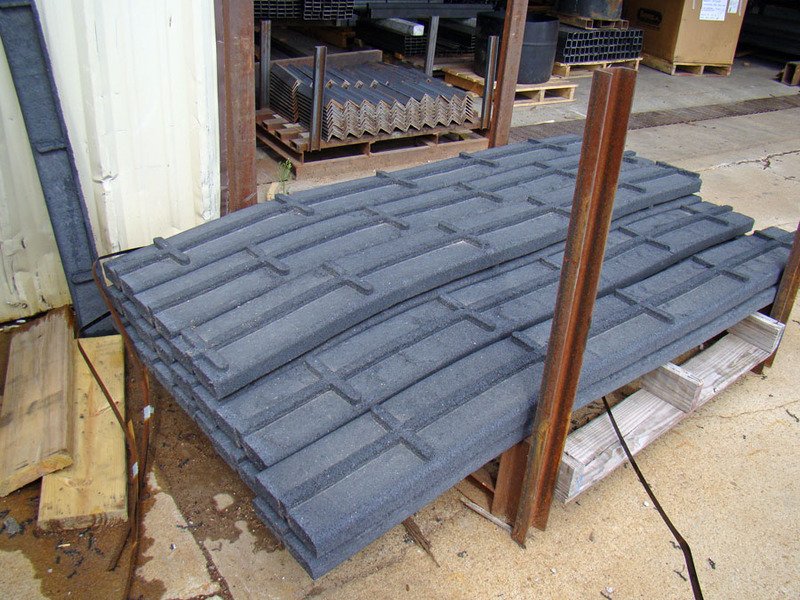 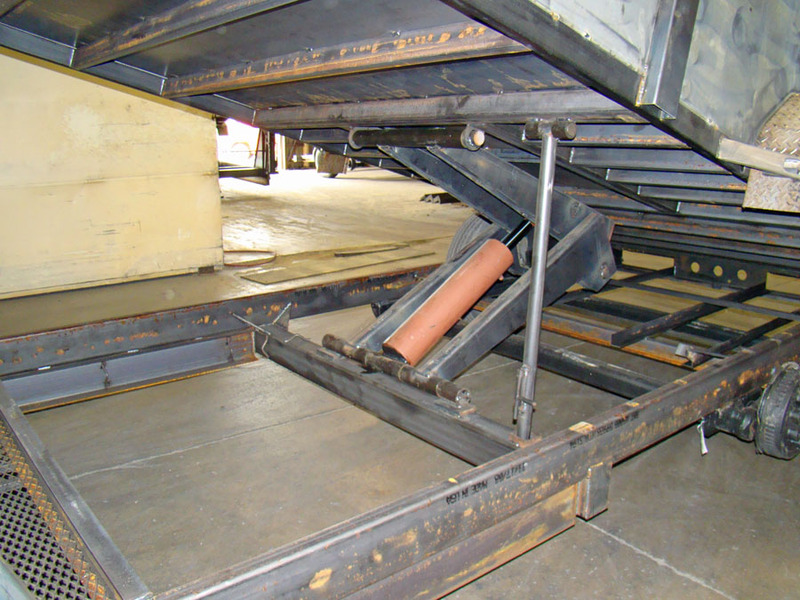 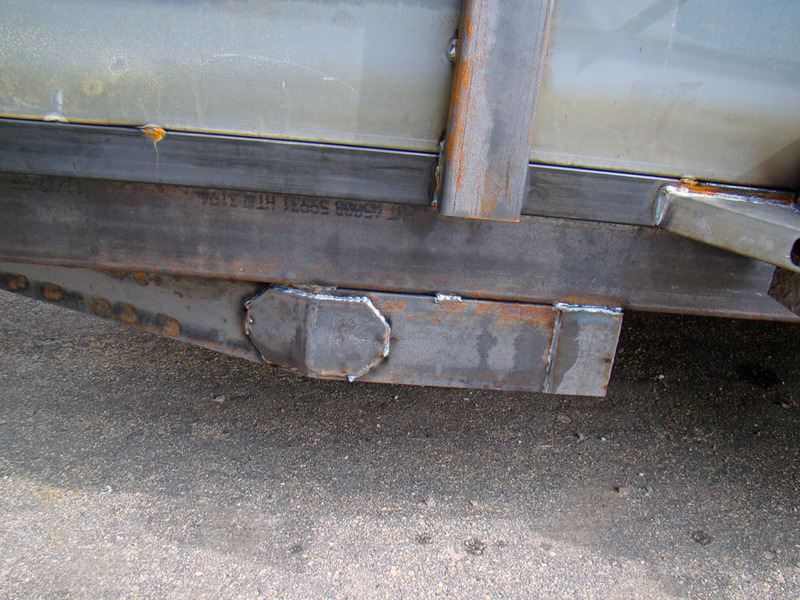 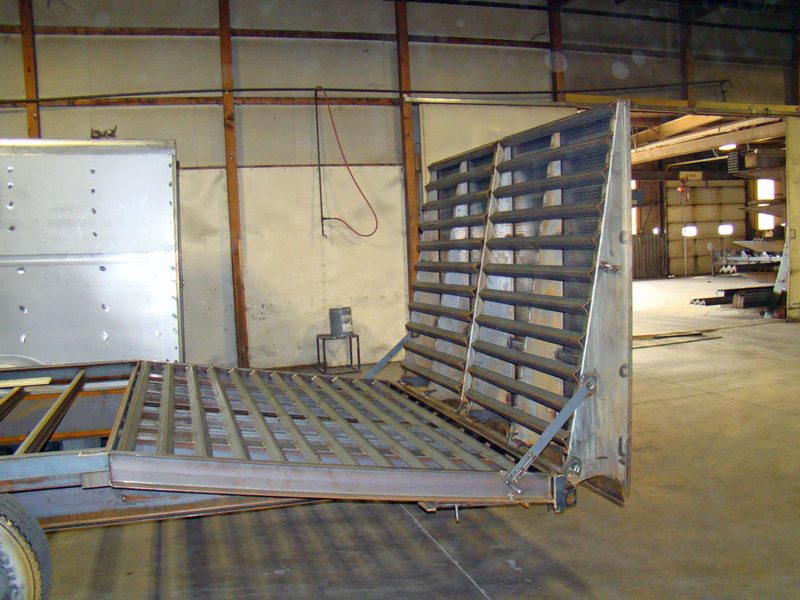 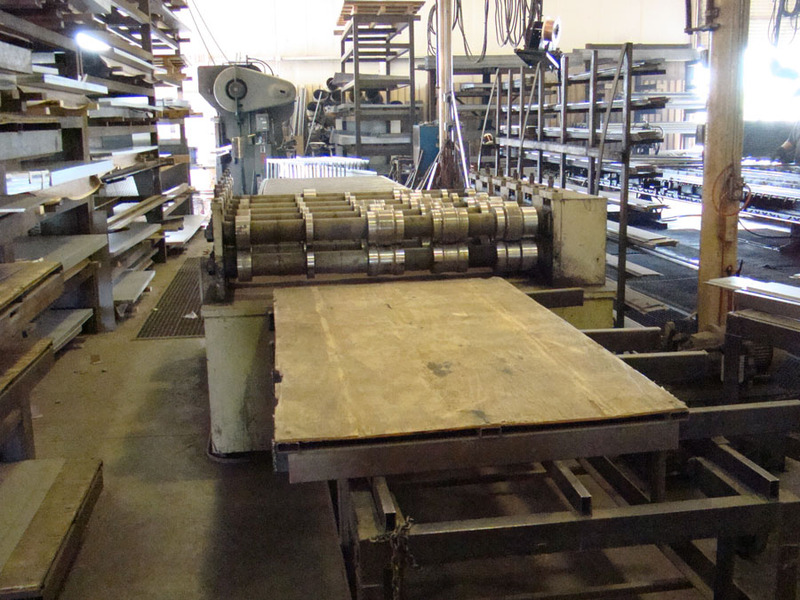 Some ramps fold up for an extended flatbed, some latch up in the air or slide in slots, see below. 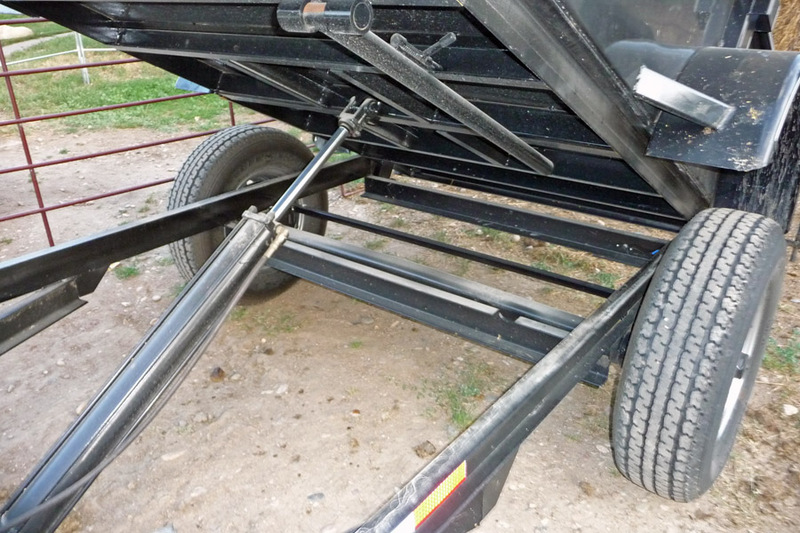 Longer dovetail and spring assist ramps make loading low clearance equipment easy. 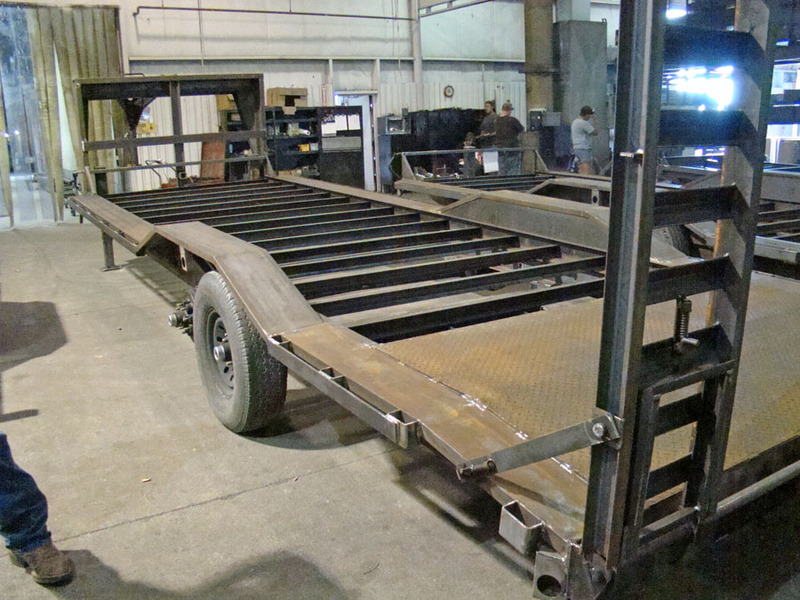 Called the wide glide for a 8’6″ wide flatbed. 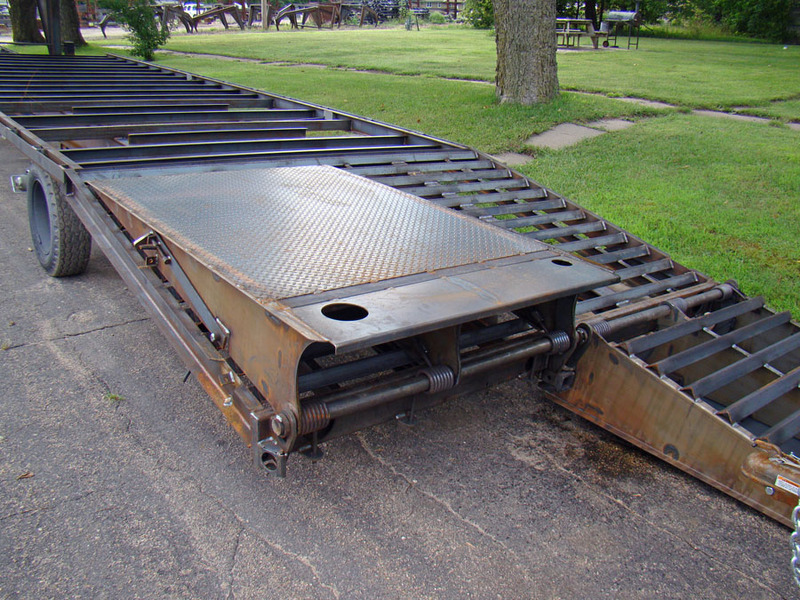 Load your M1 Abrams on it. 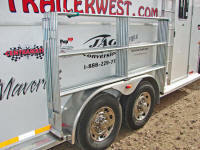 Thousands of trailers a year roll out of Waterville Kansas. 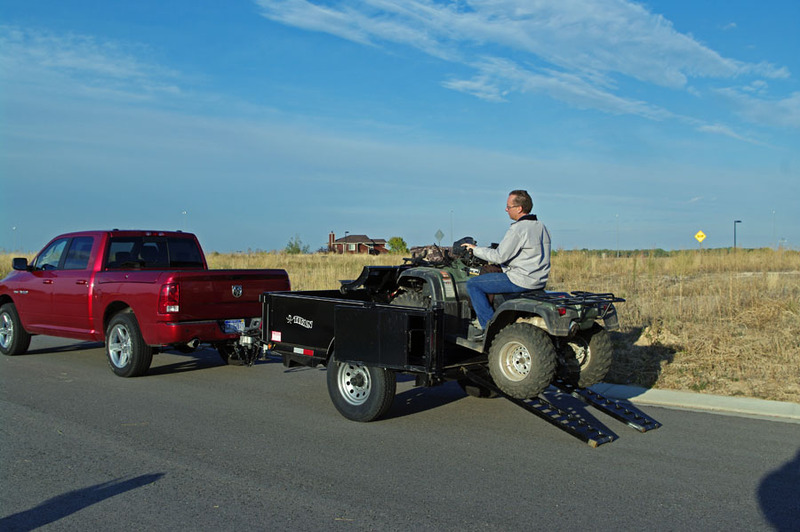 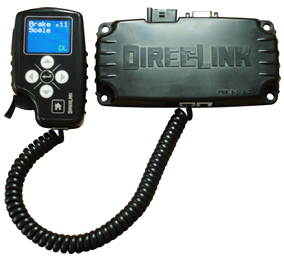 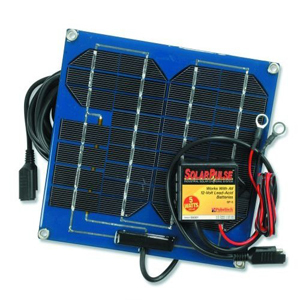 Titan has a well established network of dealers across the country. 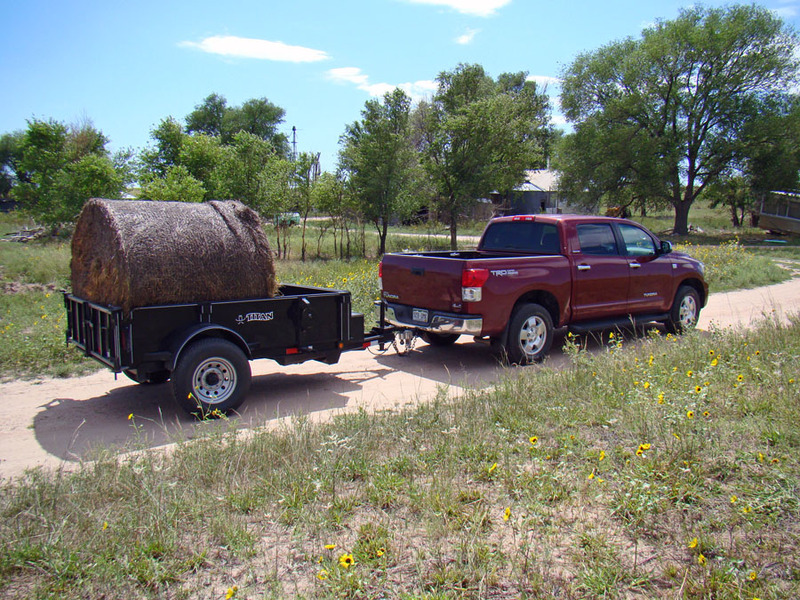 A fun trailer, the jack lifts the trailer even when hooked to your truck. 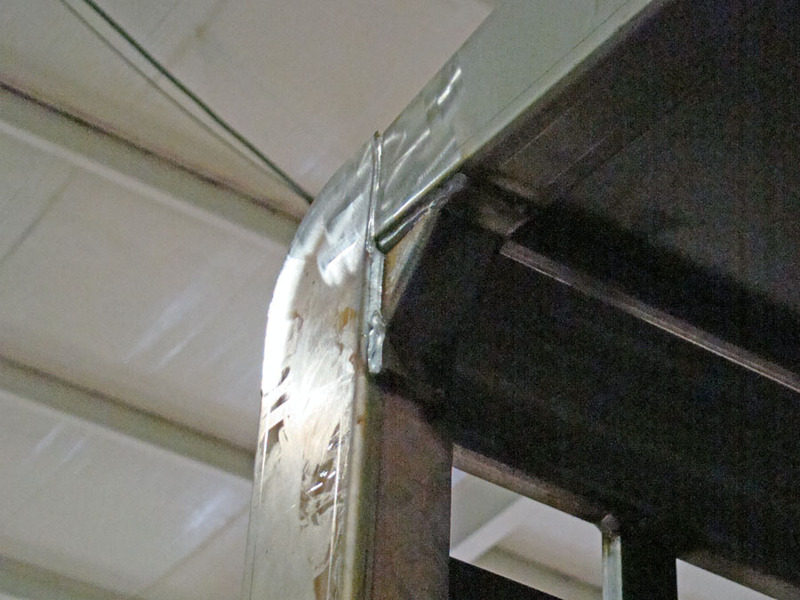 The neck unpins to articulate. 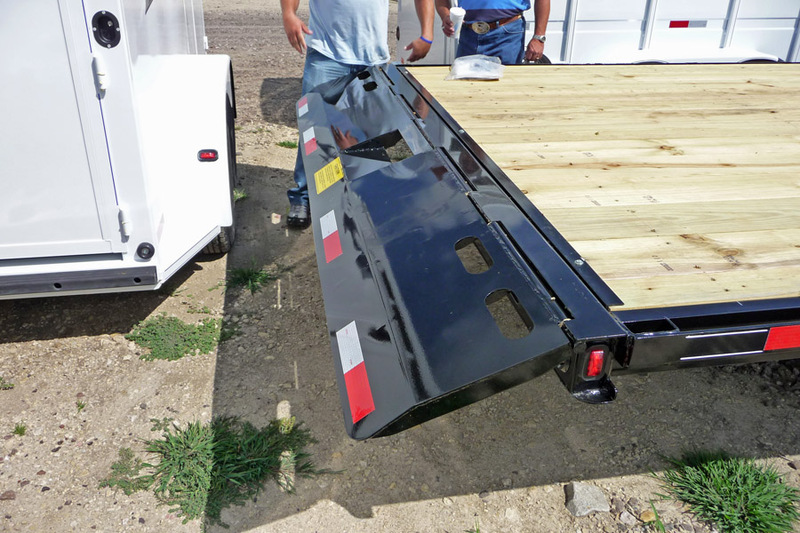 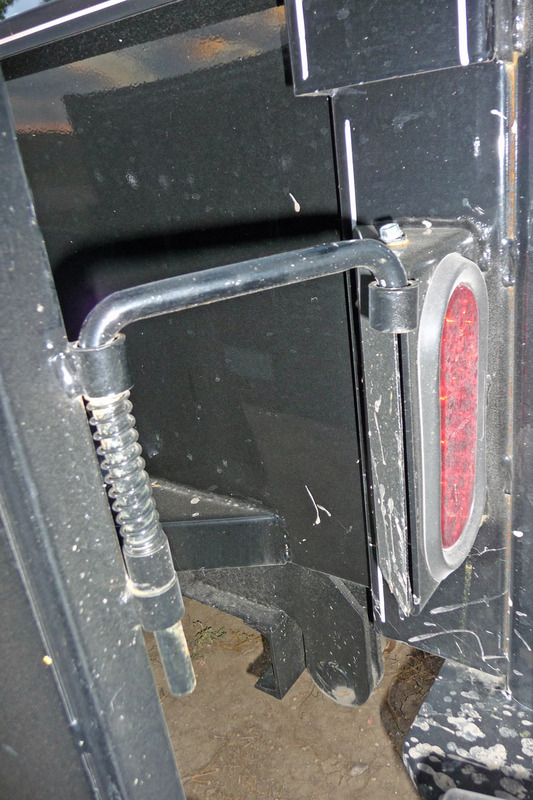 The short rear ramp lifts up for loading heavy equipment. 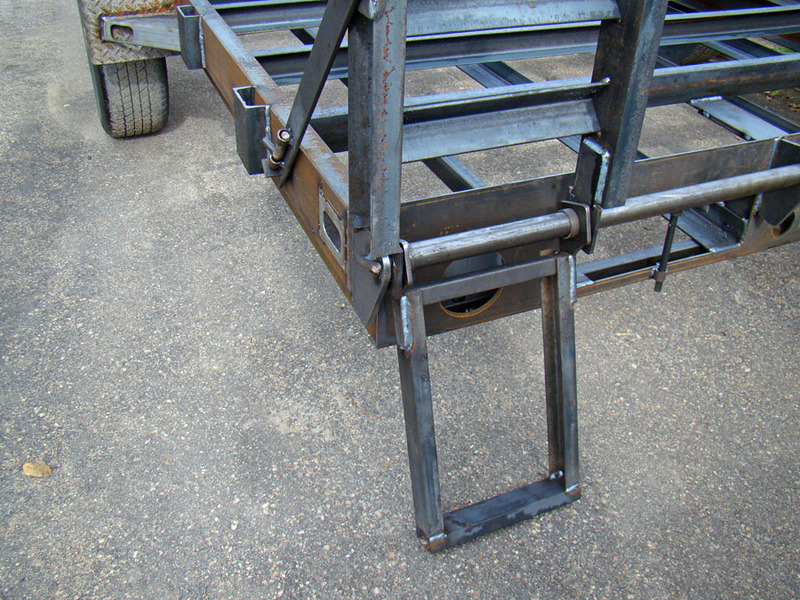 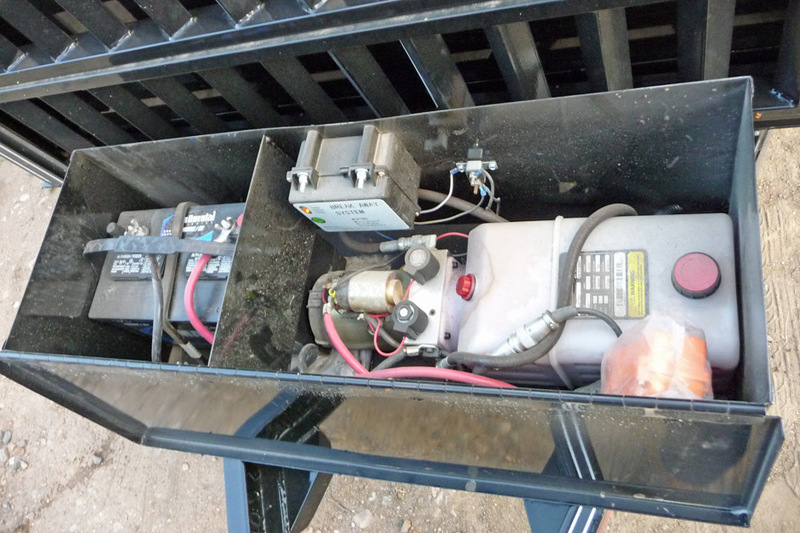 Winch and hydraulic pump enclosed, make this trailer a treat to use. 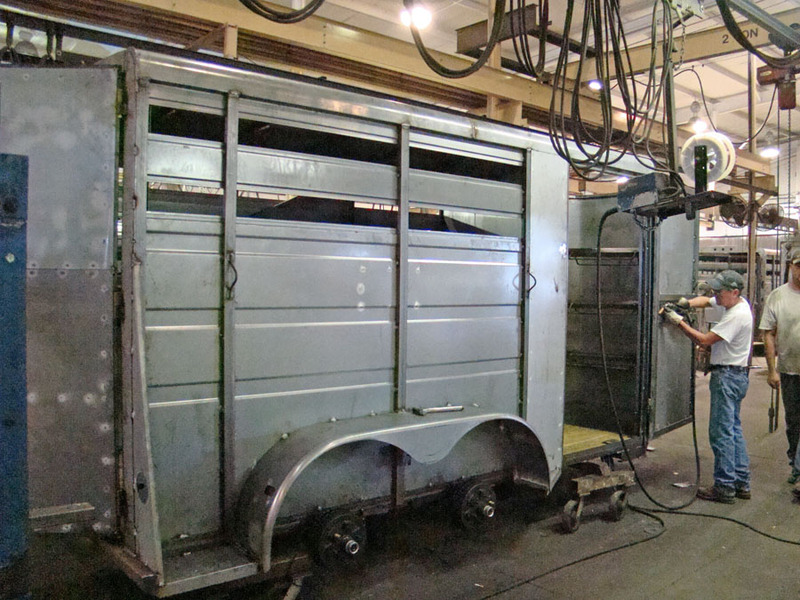 From loading, crowding Buffalo’s (Bison) and cattle to horse panels and hay feeders, Titan carries their knowledge for painting to the tough stuff. 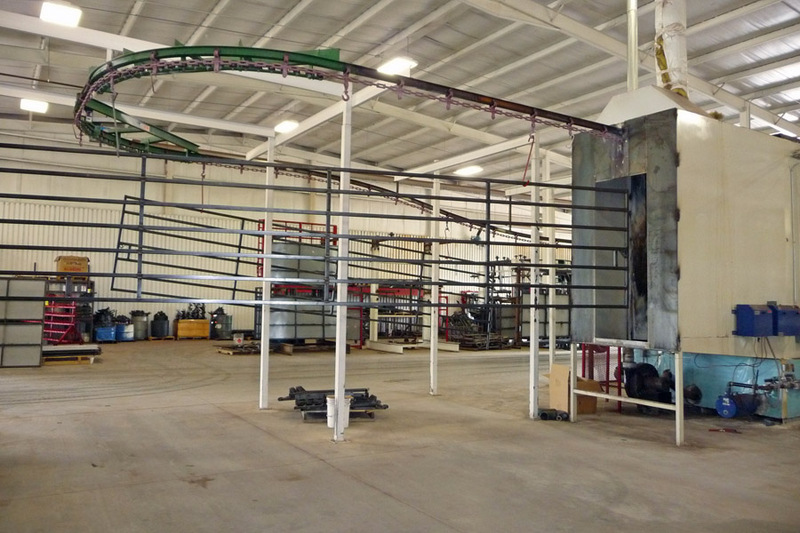 You’ve probably heard of the O. K. Corral, but didn’t know it was in Kansas. 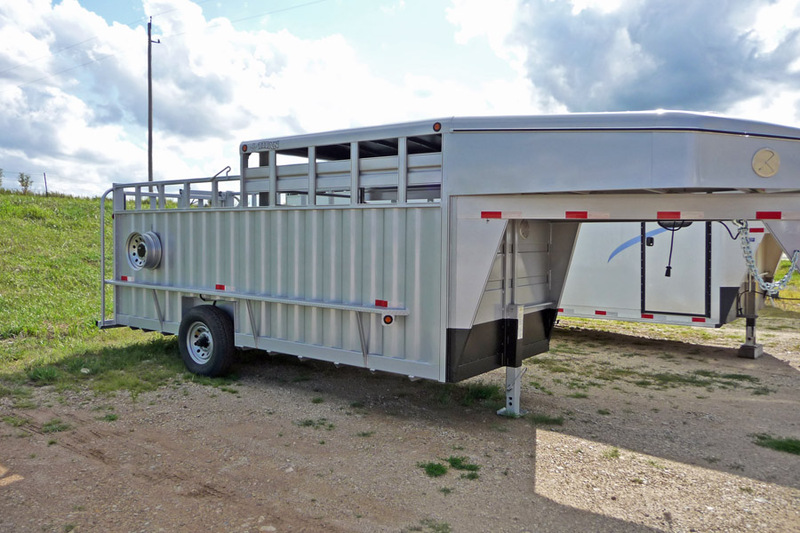 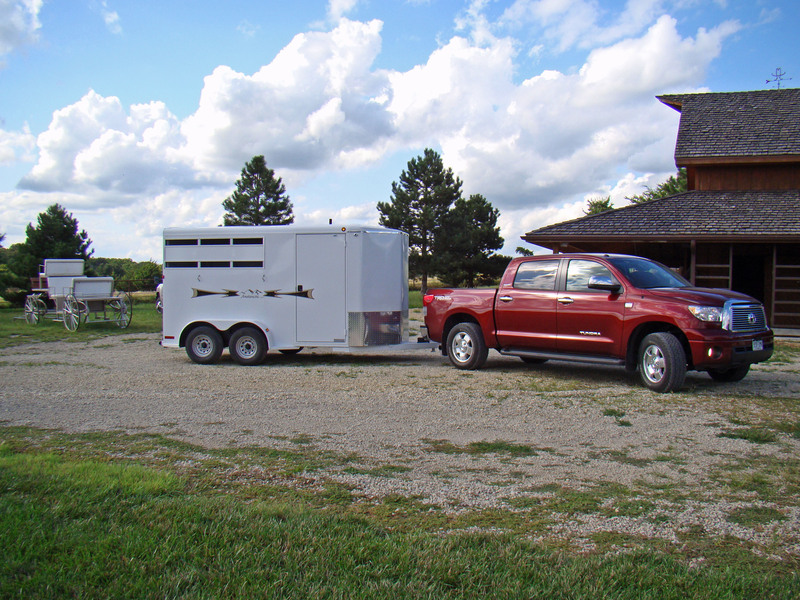 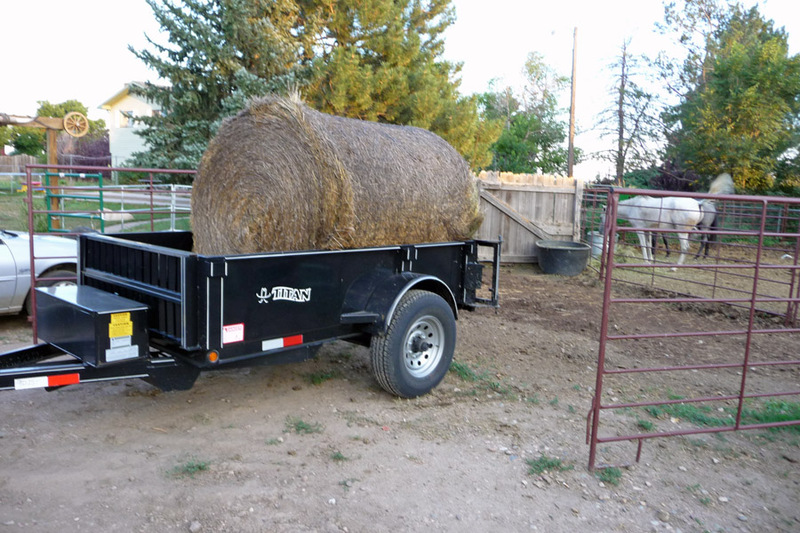 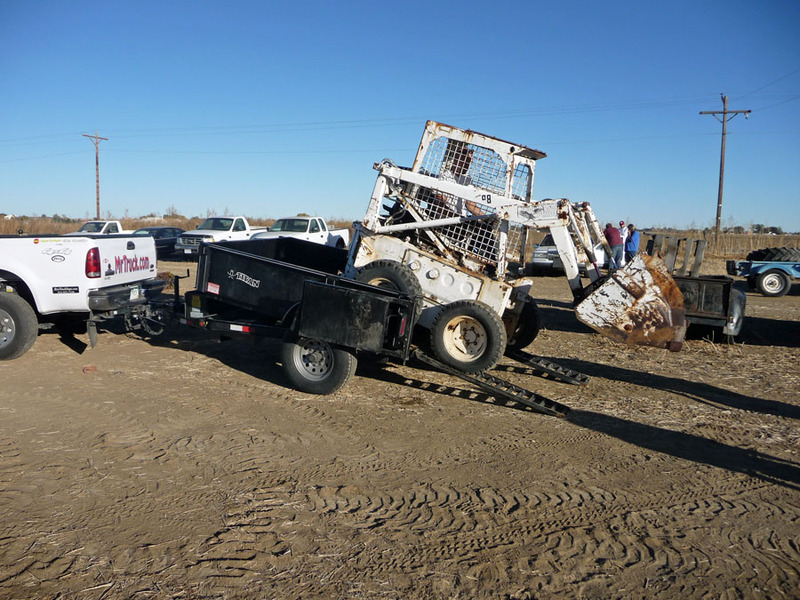 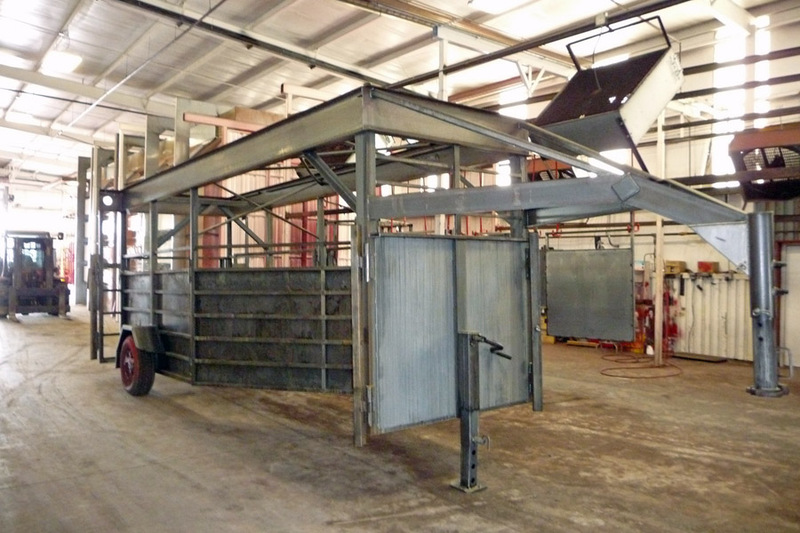 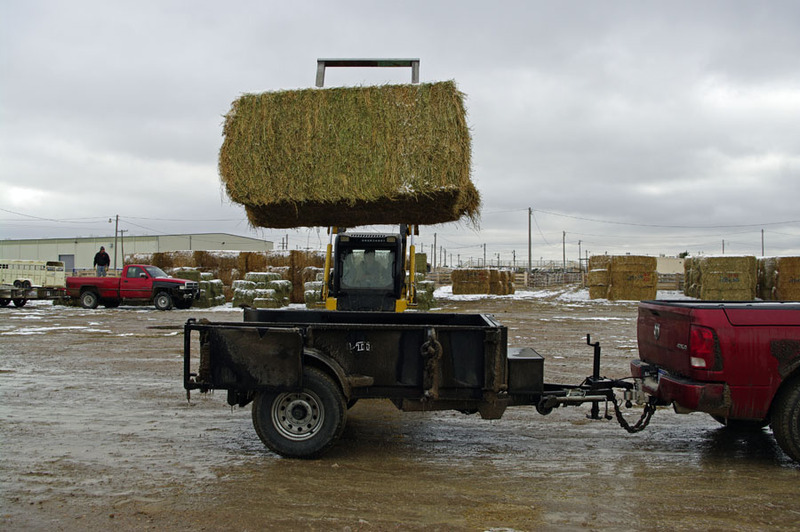 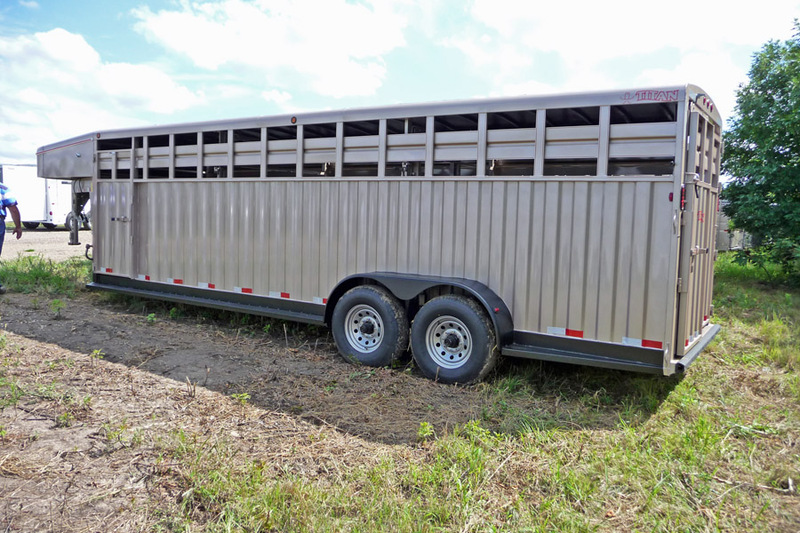 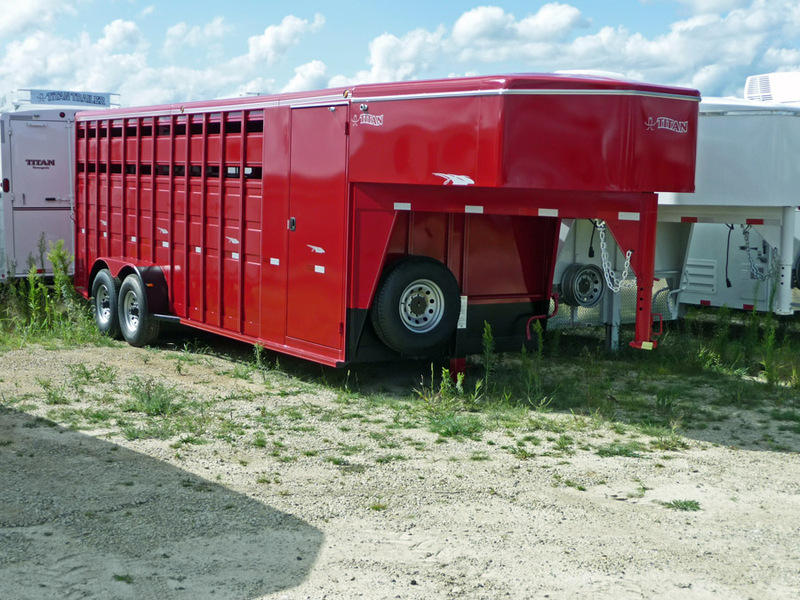 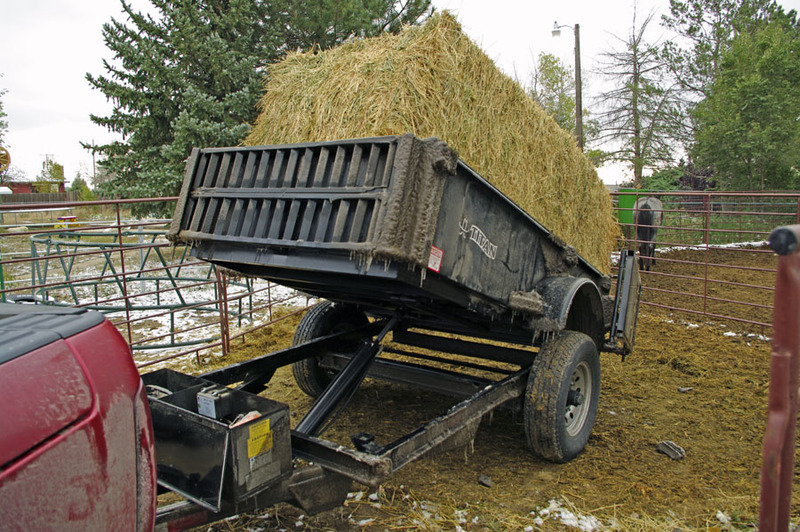 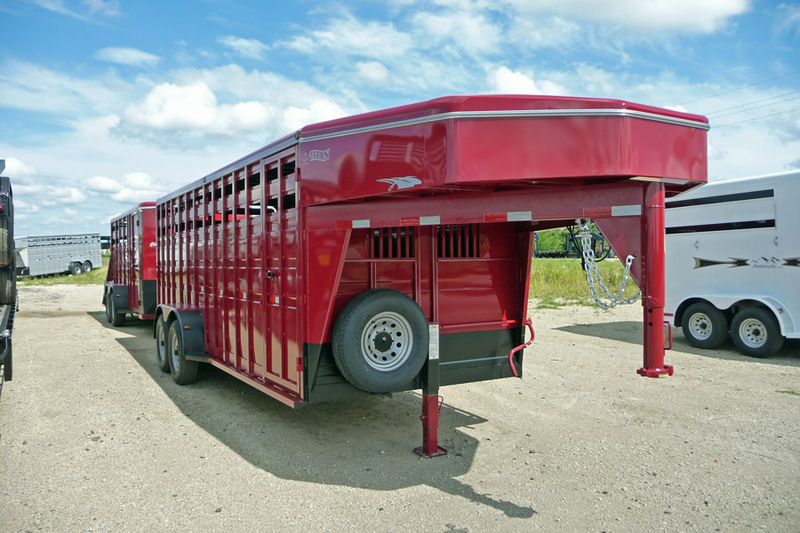 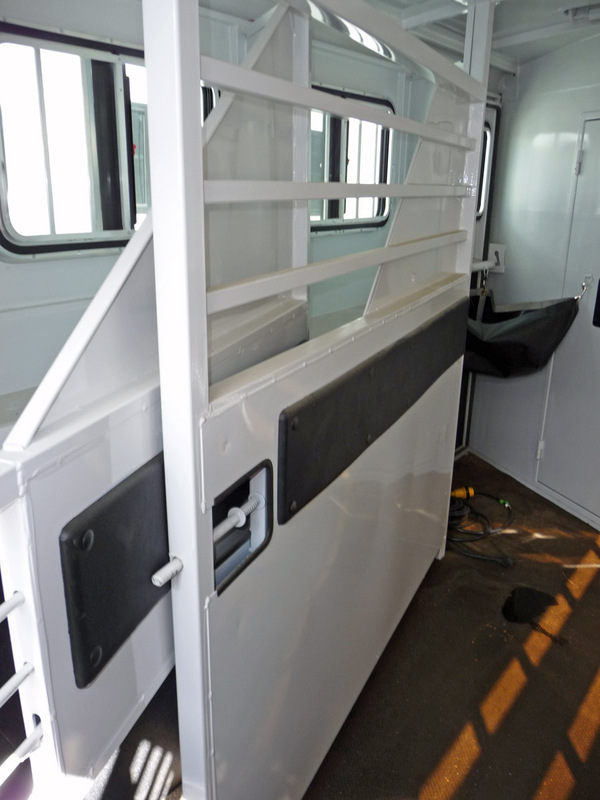 Titan’s portable corrals hauls the whole cattle handling system complete with catch pen, holding pens, all folded up into a gooseneck trailer that even hauls your ATV or horse. 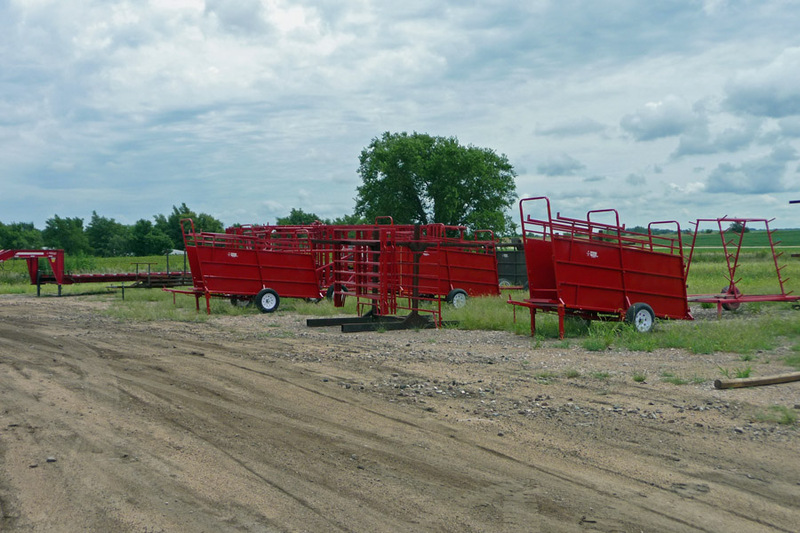 Just drive to your herd, unfold the O. K. Corral and get the cattle sorted, worked or loaded for town. 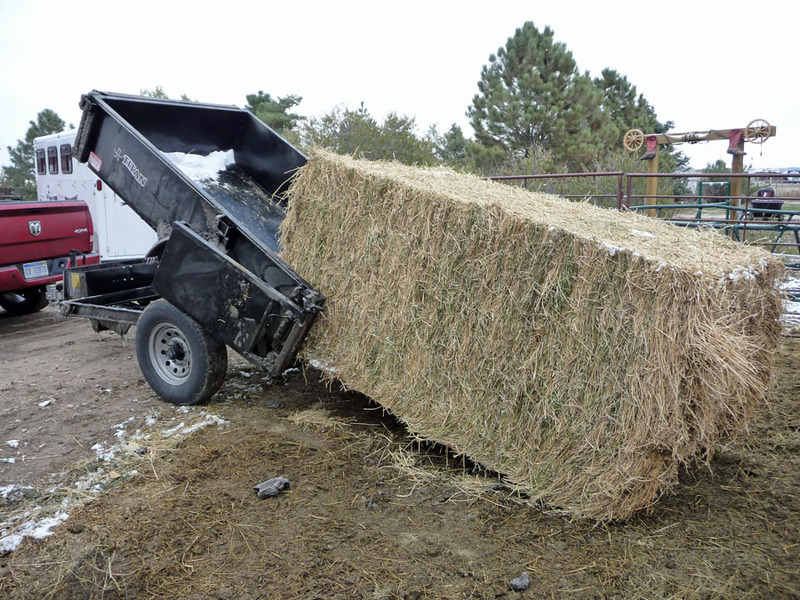 Stop wasting hay. 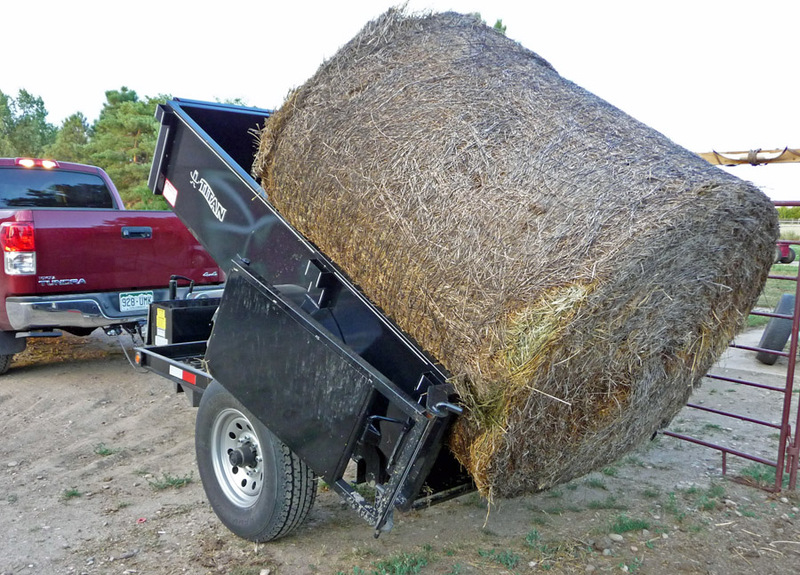 I started self feeding my horses grass hay in round bales. 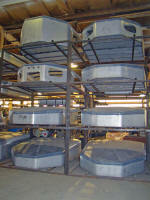 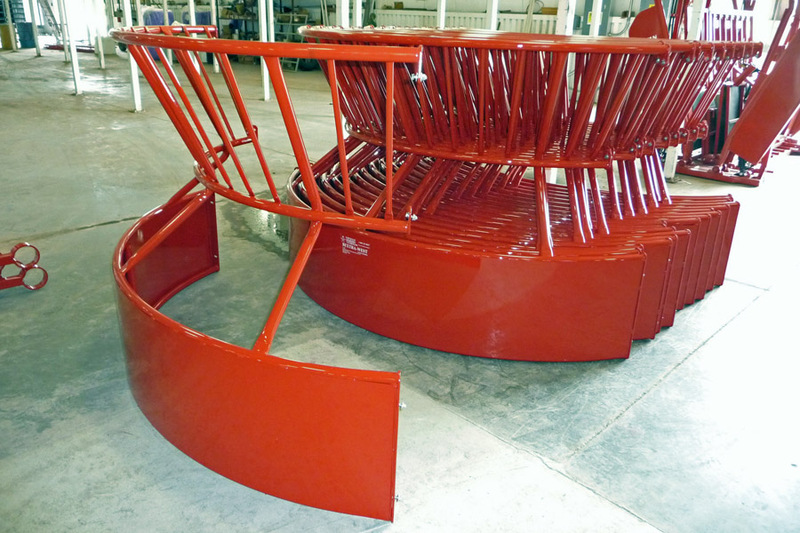 Titan West has the feeders to keep your cattle working for their hay instead of standing on it. 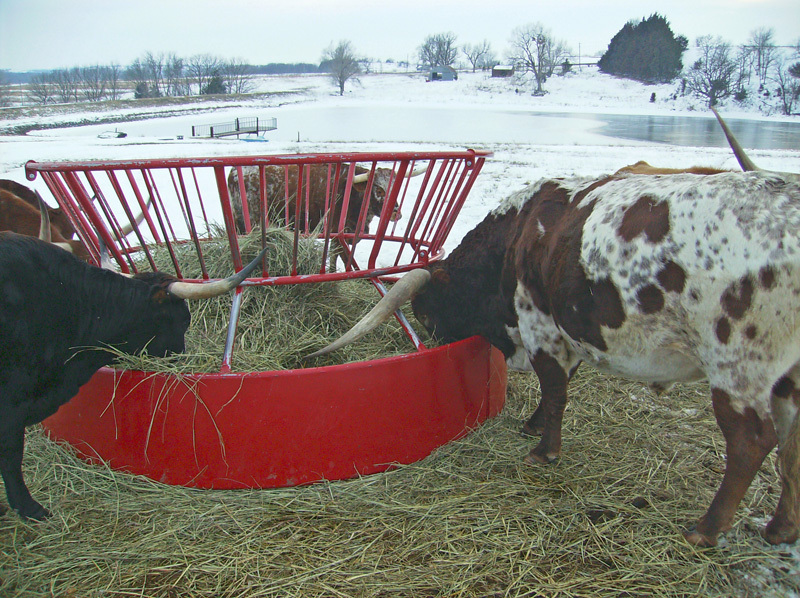 See the Longhorns above going at it.